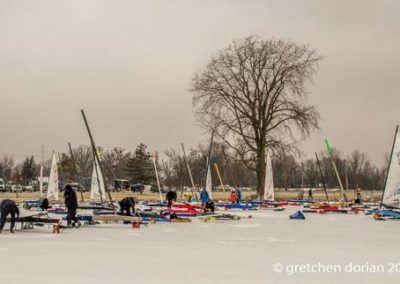 Awards ceremony to be at 4:30 PM at oakwood resort. 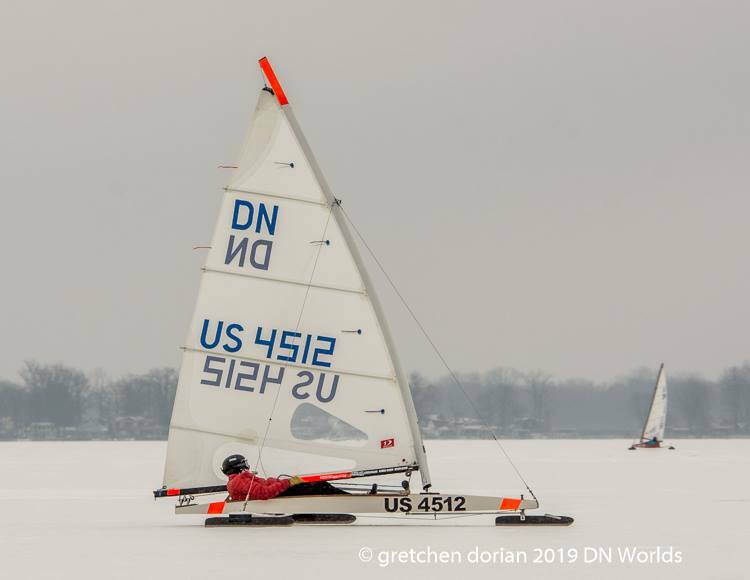 13 races in the books for the first day of the 2019 DN North American Championship. 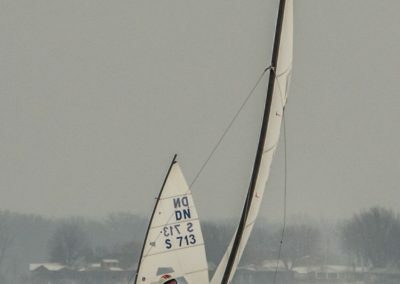 Big breeze, a relatively small course at .7 mile because of wind direction, and competitive fleets all the way around. 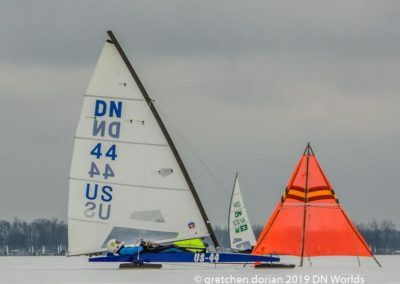 The 2019 Gold Cup had 5 women competitors and 3 received women’s trophies. 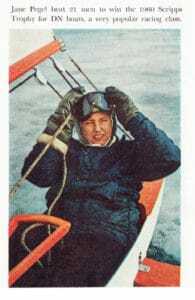 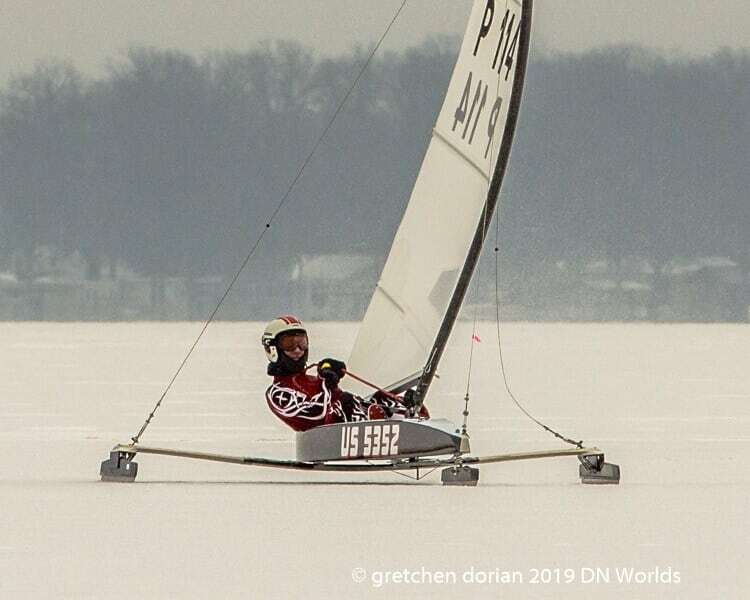 Renee Fields, an experienced land sailor who sailed and raced an iceboat for the first time, placed 27th in the Bronze fleet. 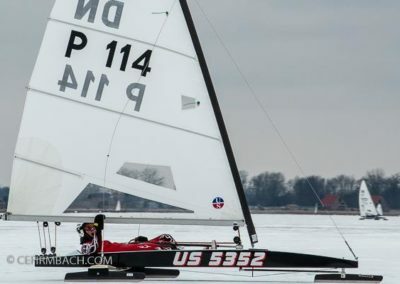 The top ranked North American woman, Julie Richards, finished 25th in the Silver fleet. 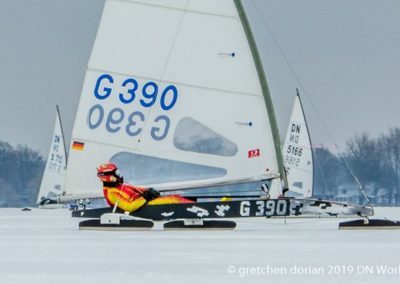 Germany’s Anja Fiedler finished 9th in the Gold fleet. 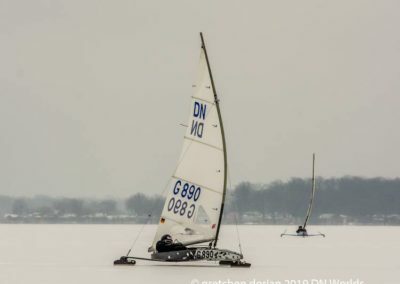 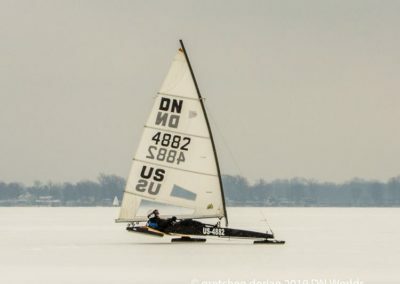 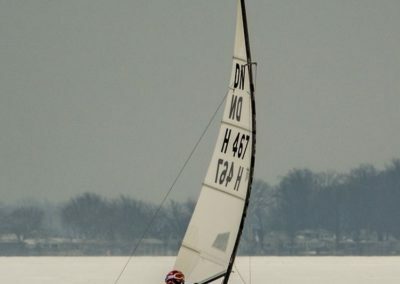 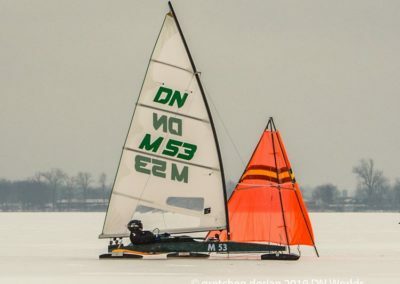 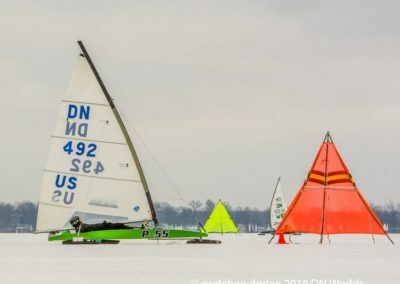 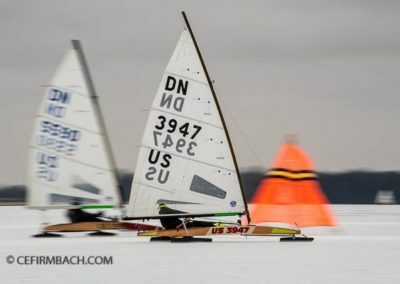 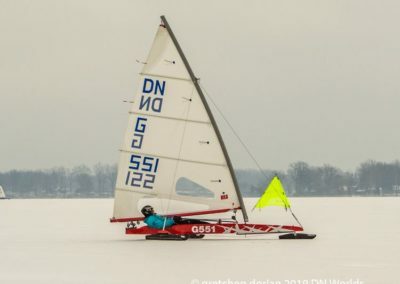 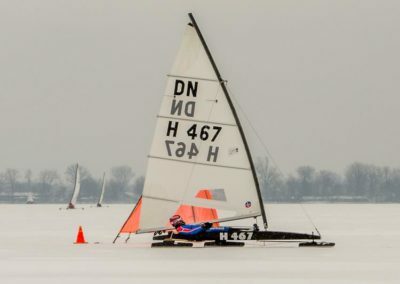 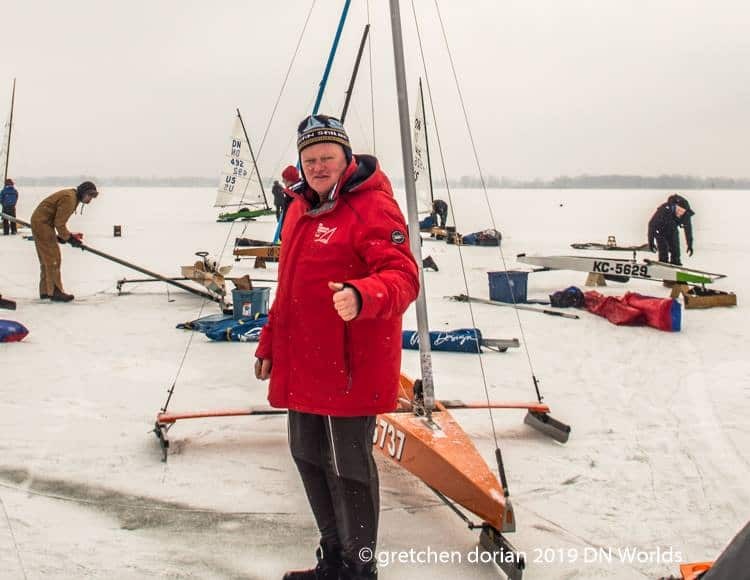 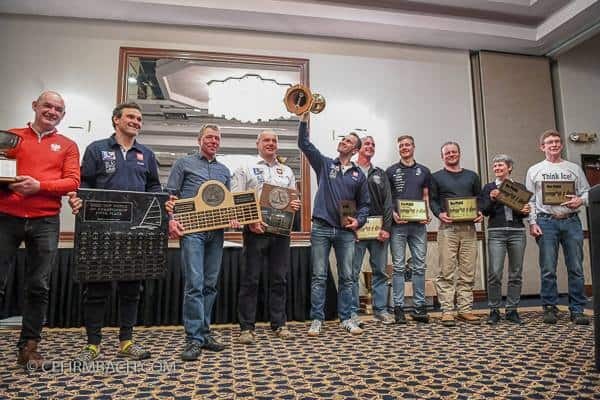 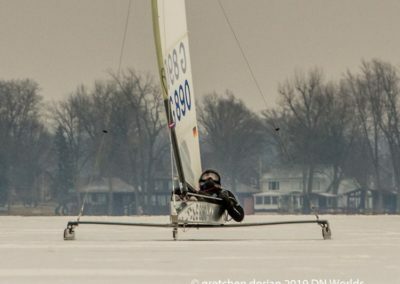 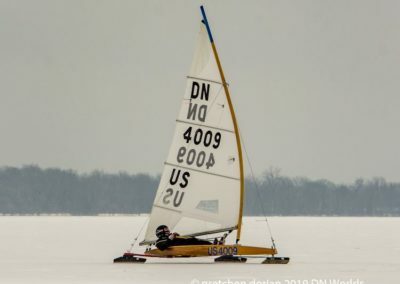 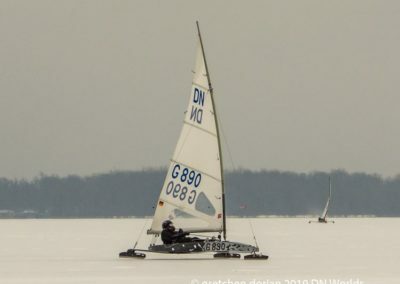 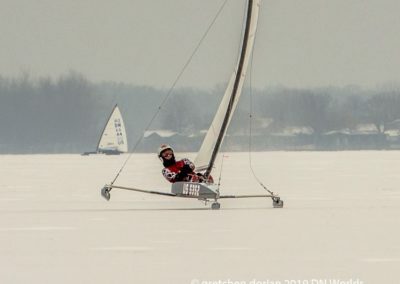 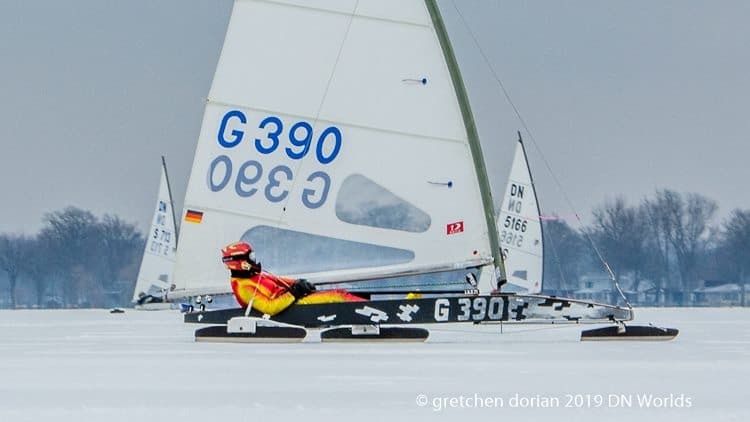 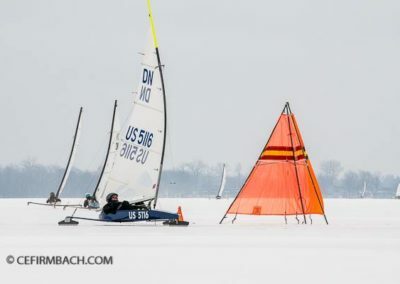 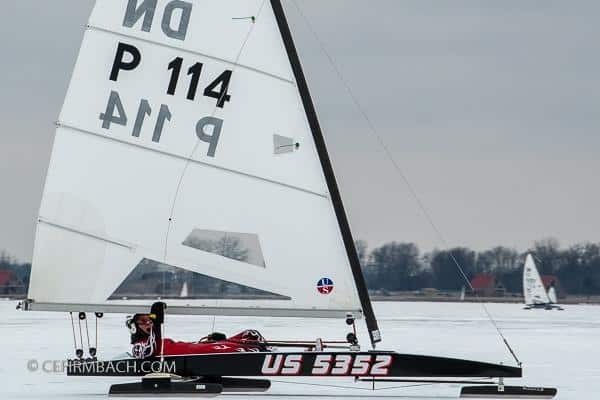 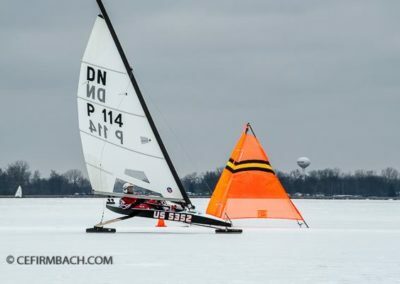 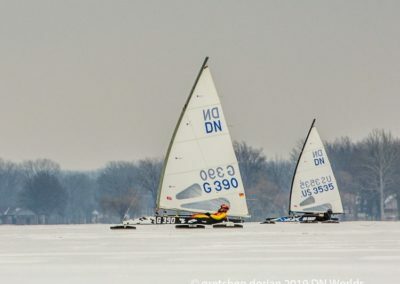 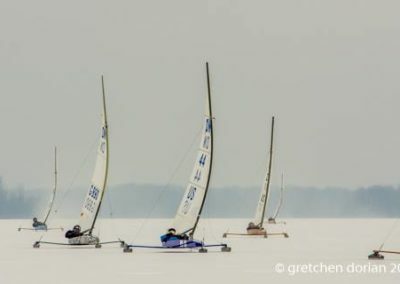 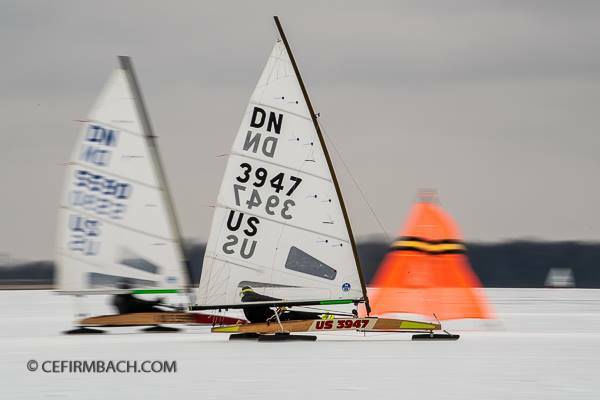 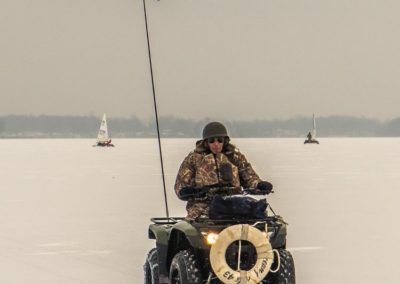 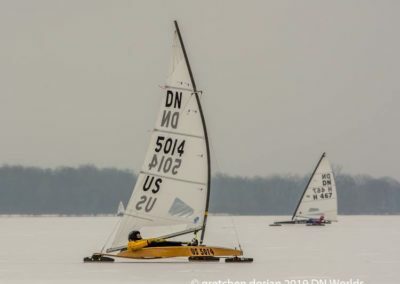 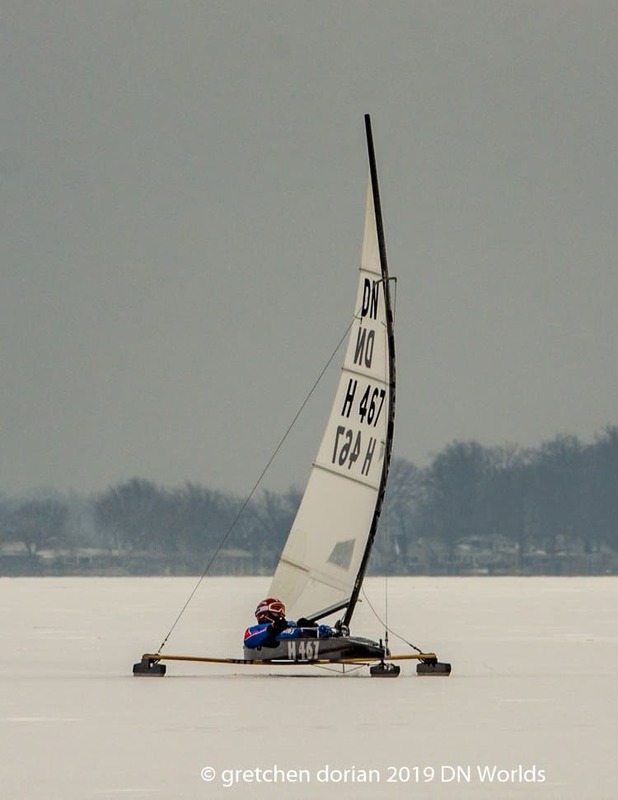 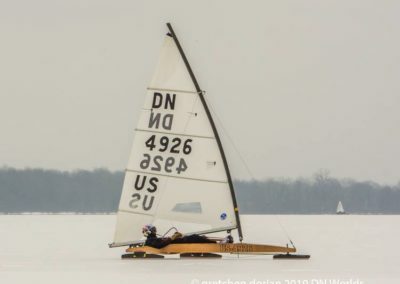 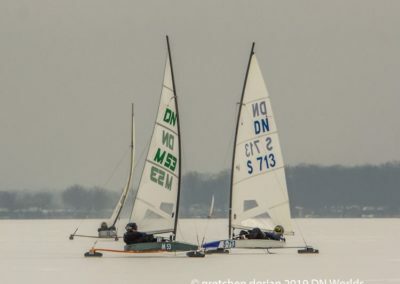 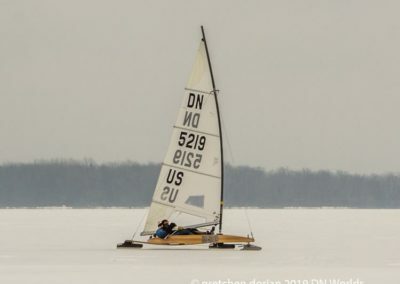 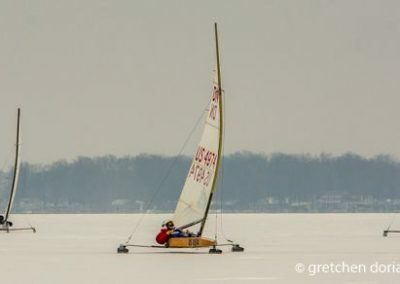 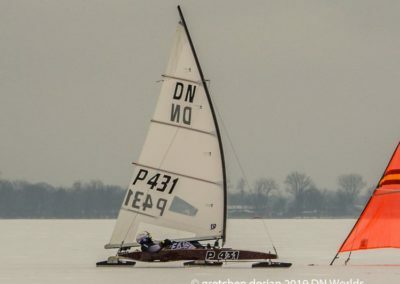 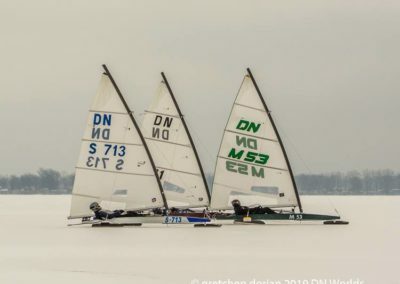 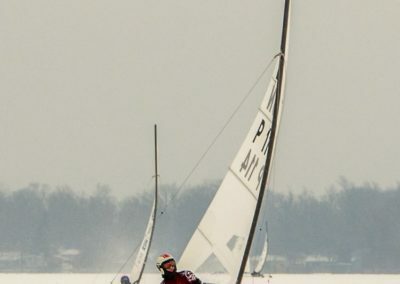 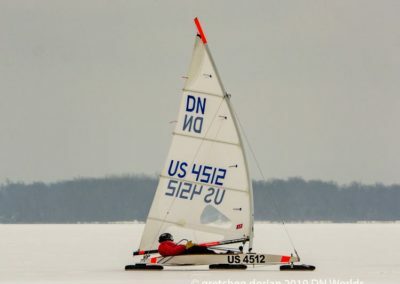 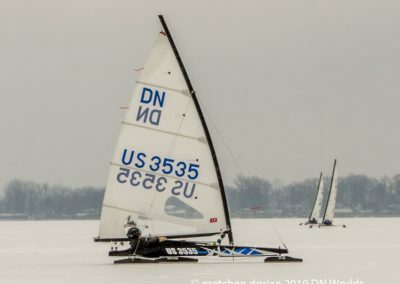 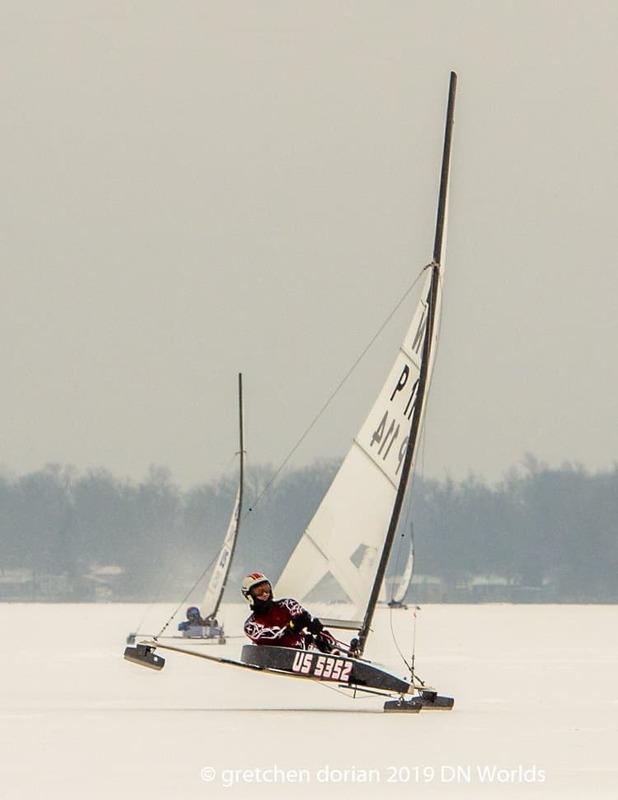 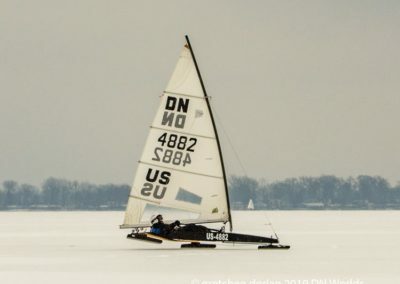 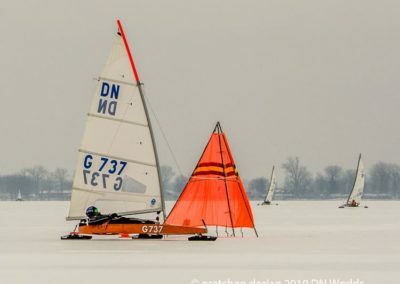 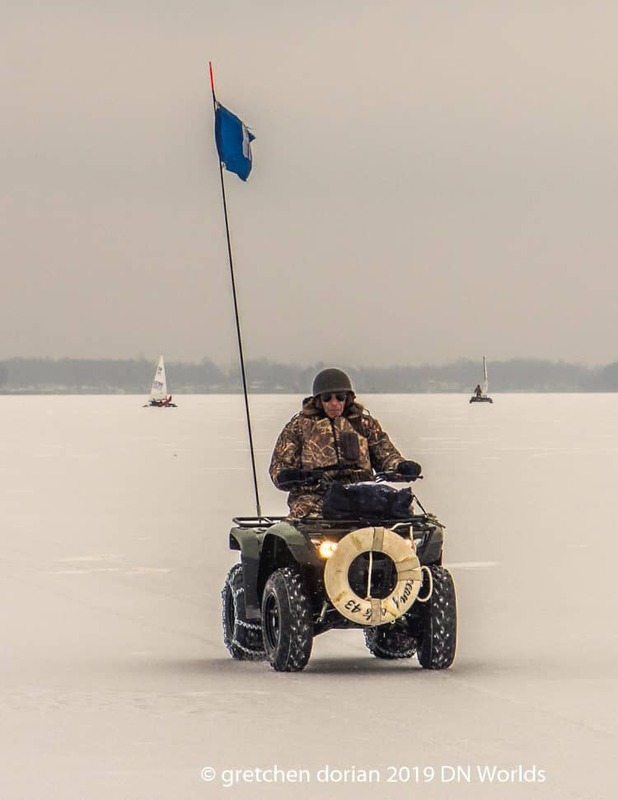 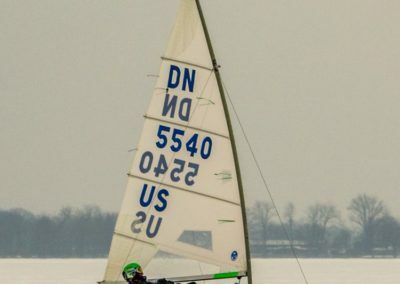 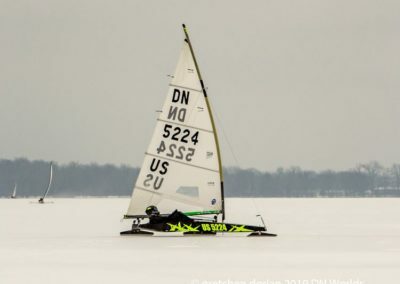 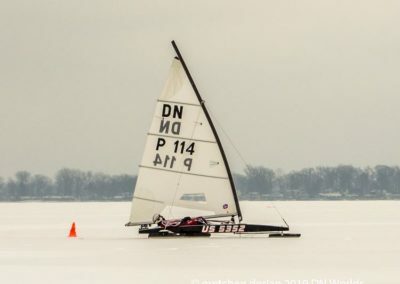 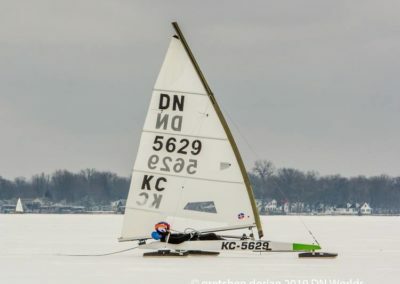 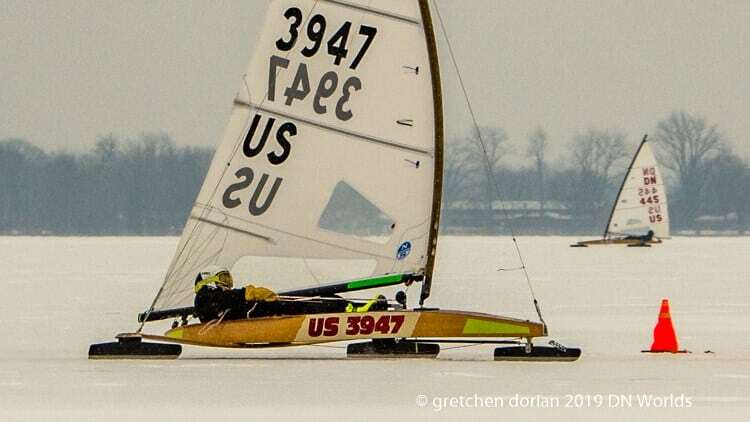 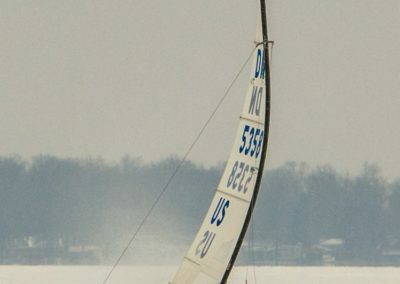 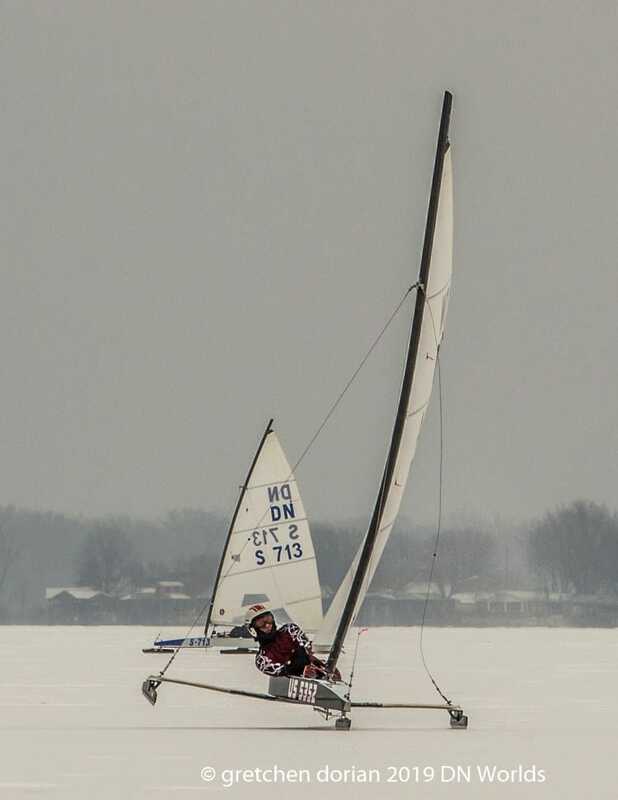 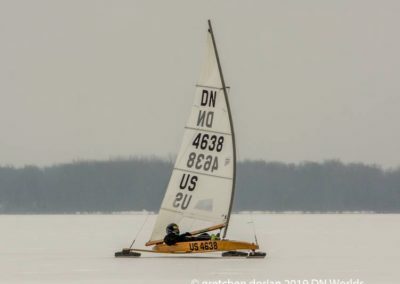 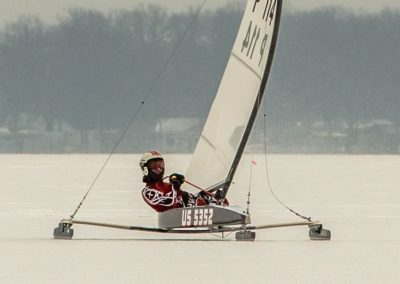 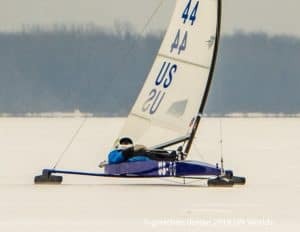 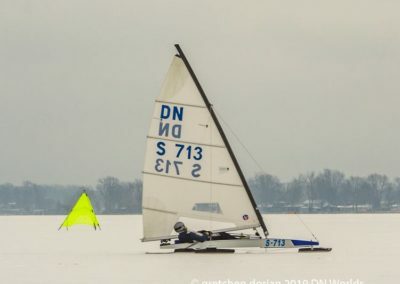 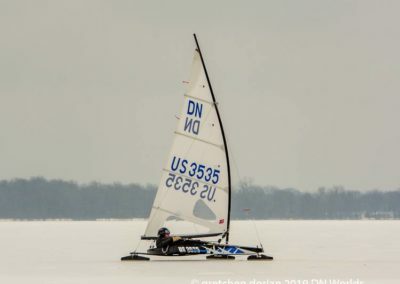 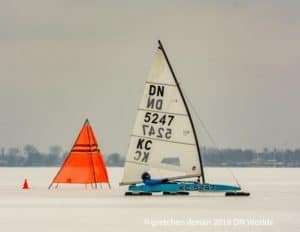 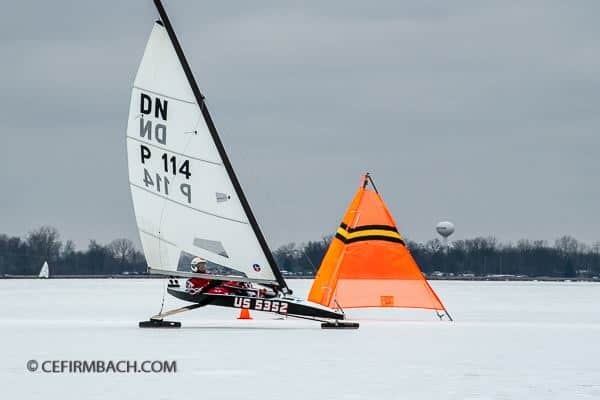 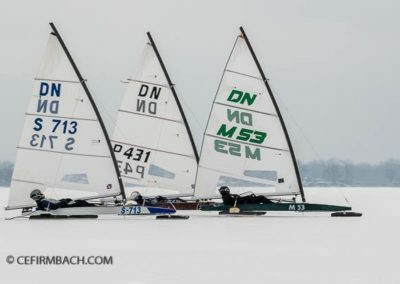 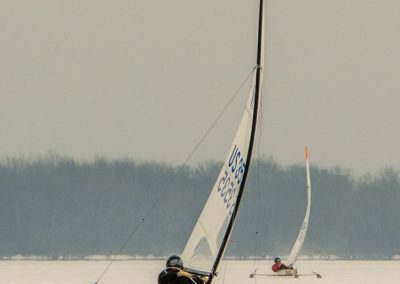 We had previously published that Anja was the first female to finish in the top ten of a World Championship but let the record show that Lake Geneva’s Jane Pegel US805 accomplished that feat at the first World Championship sailed in 1973 on Gull Lake in Michigan. 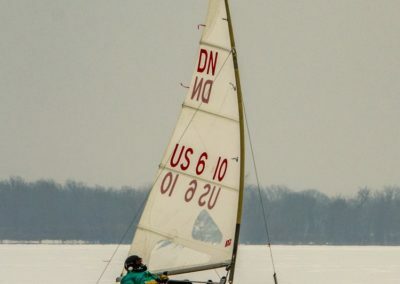 Jane placed 8th in the Gold fleet at that inaugural Worlds. 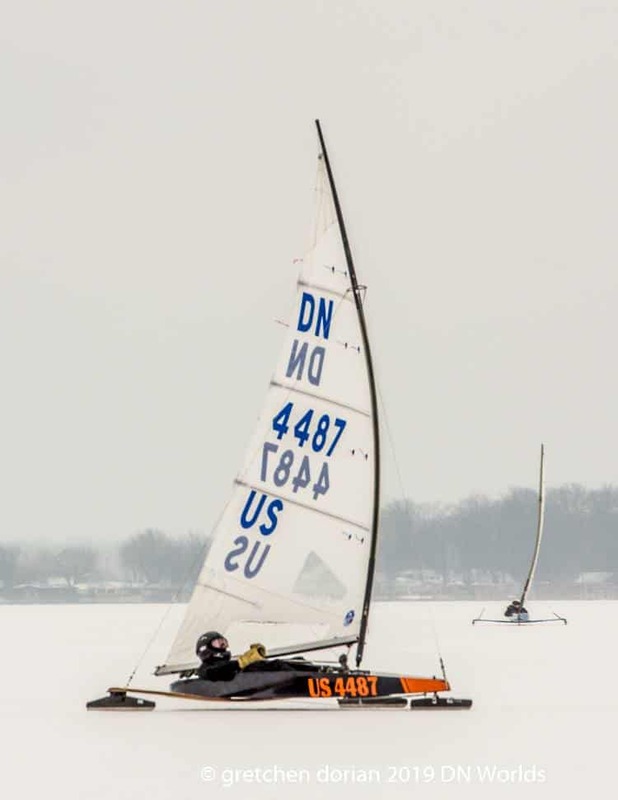 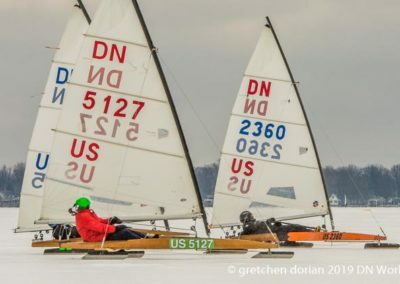 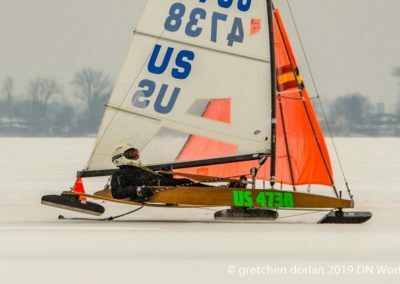 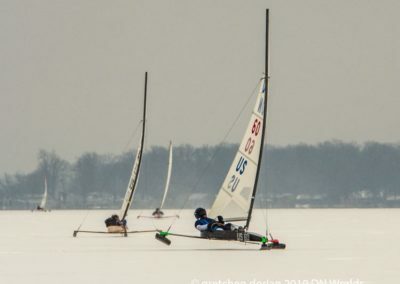 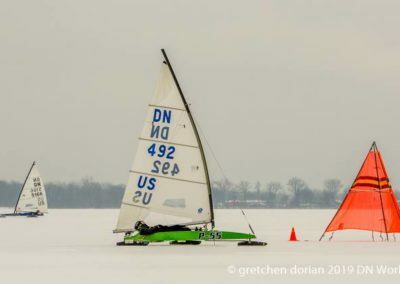 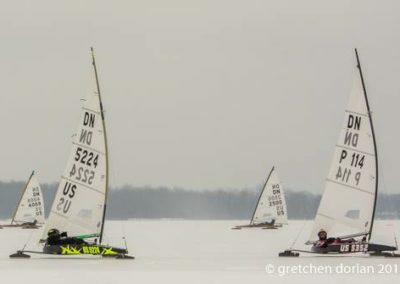 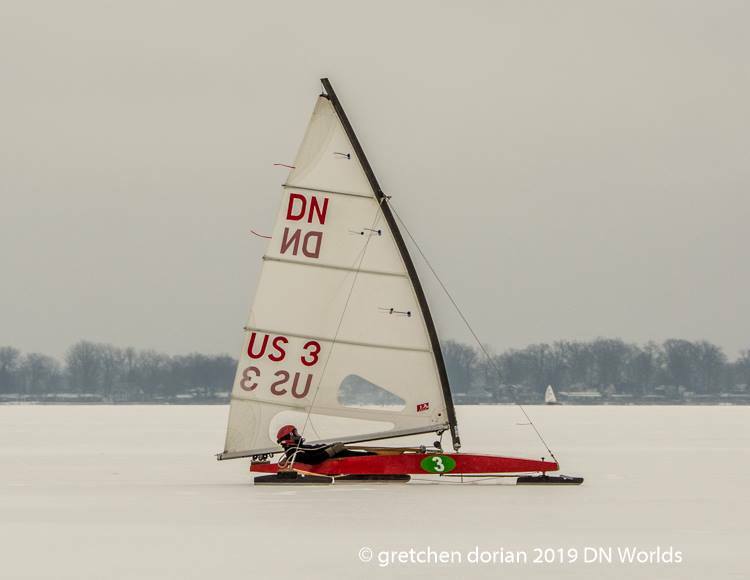 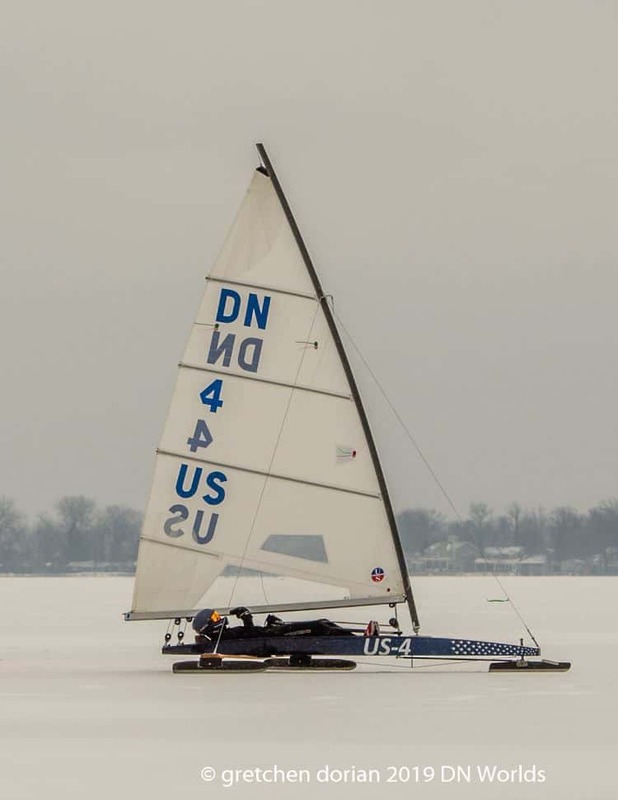 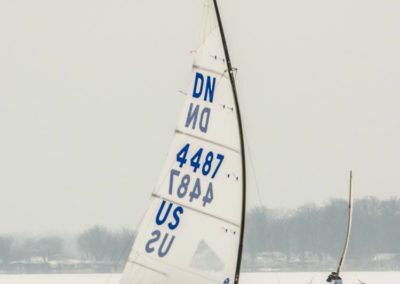 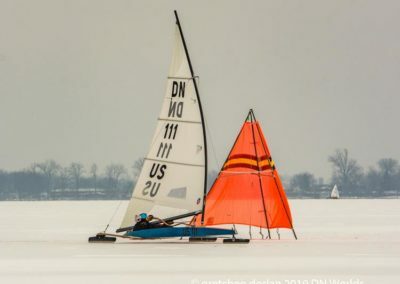 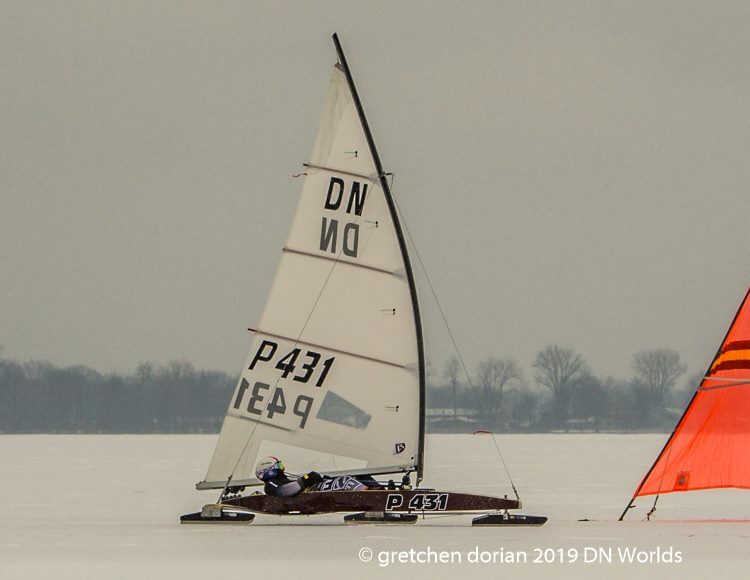 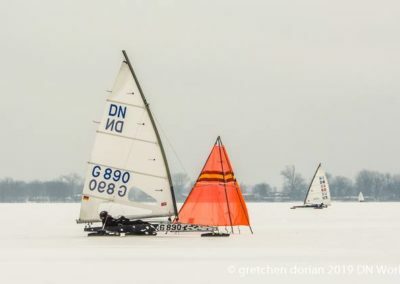 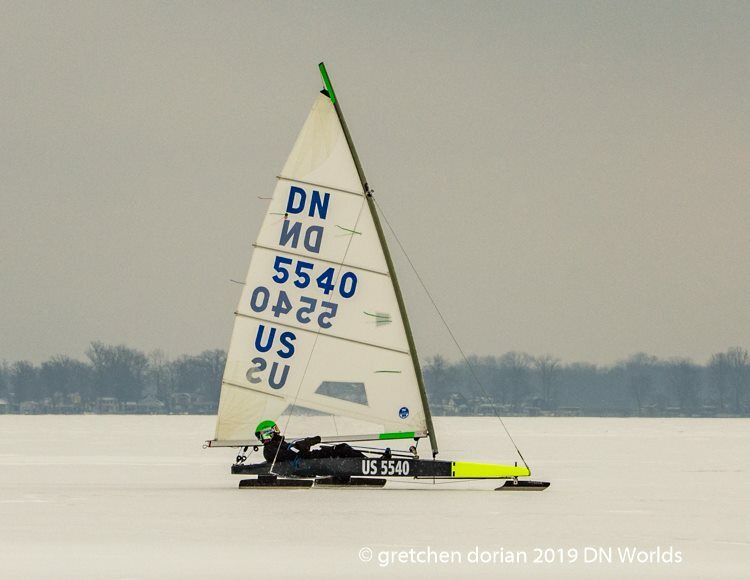 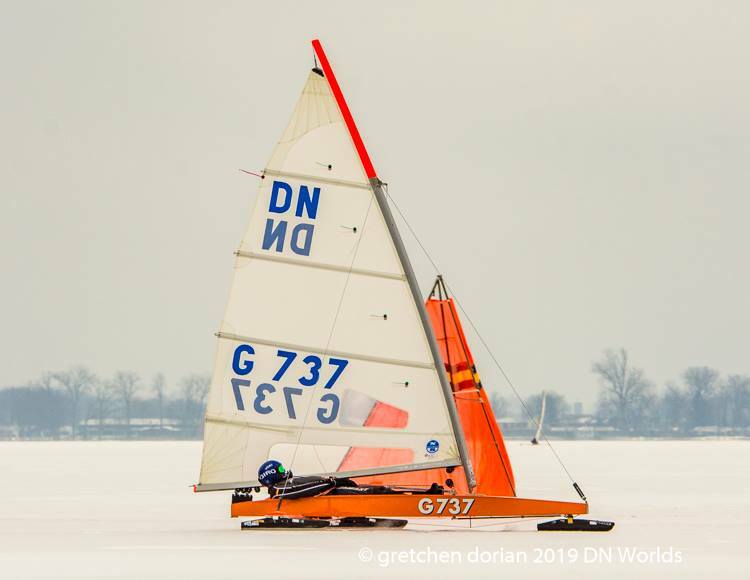 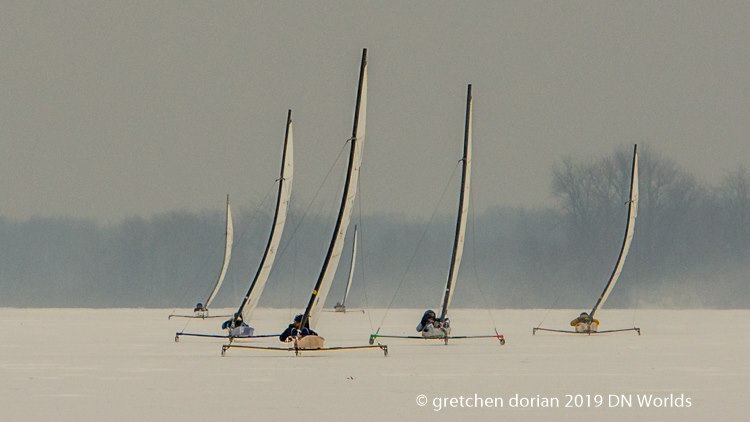 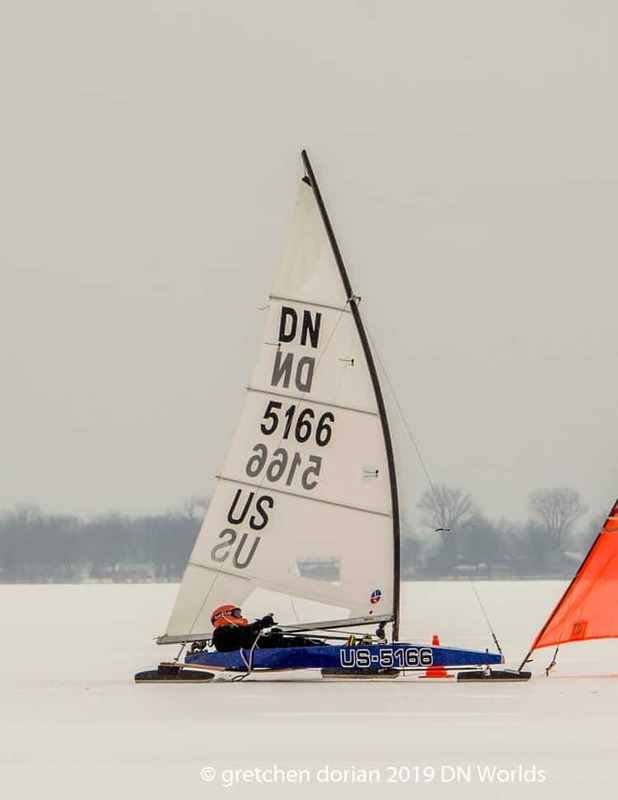 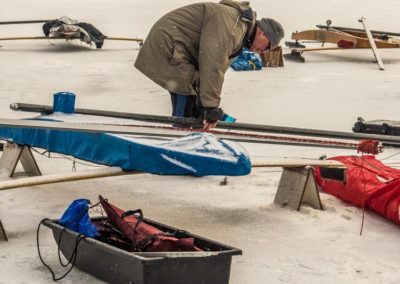 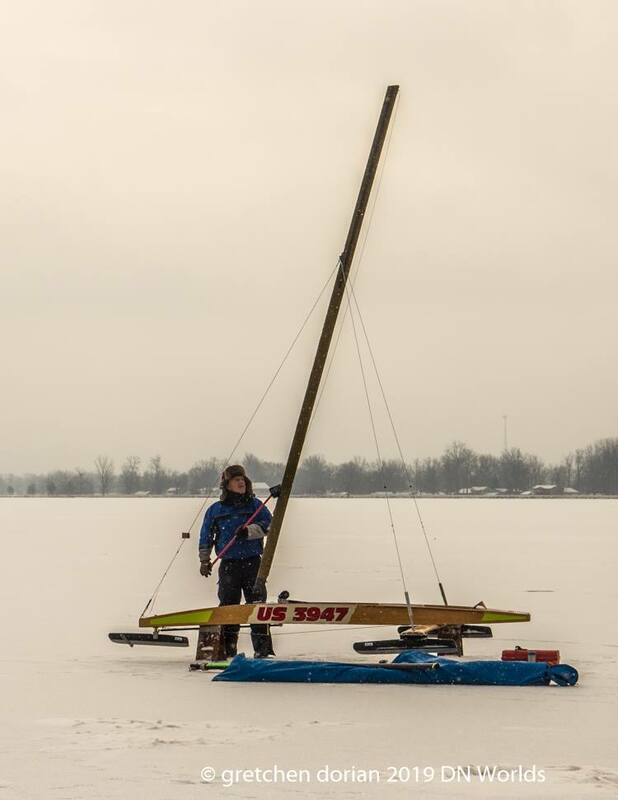 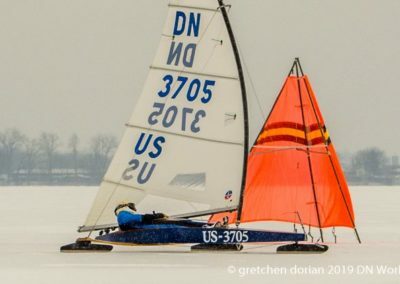 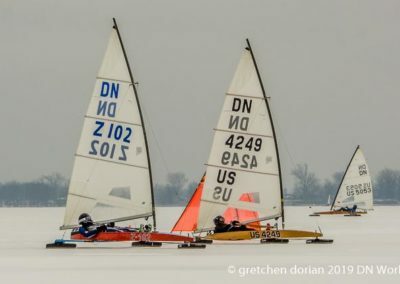 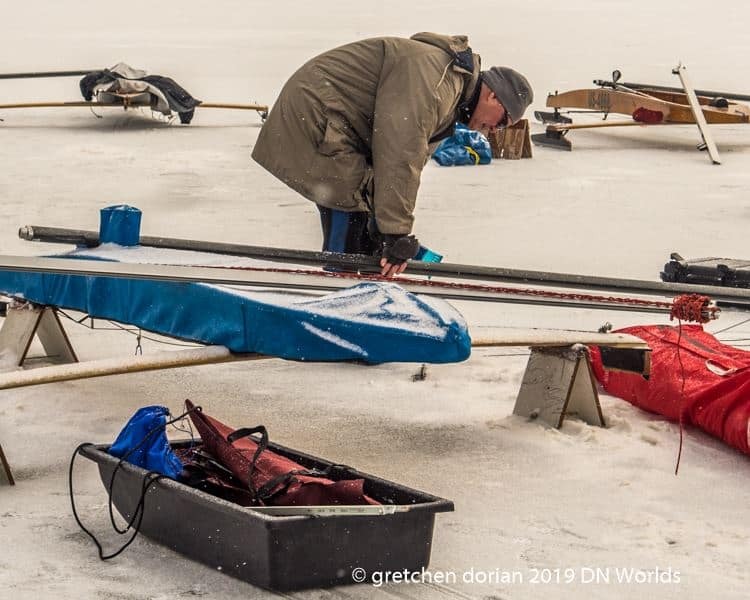 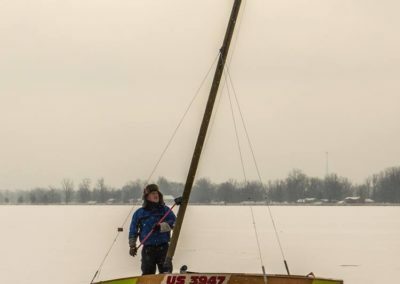 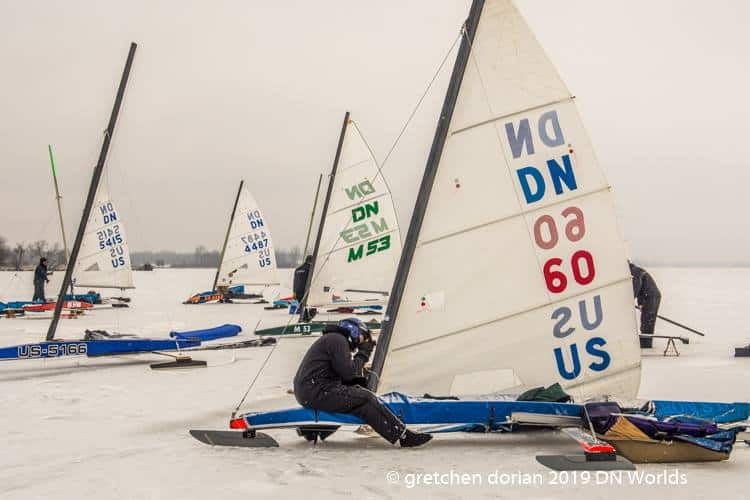 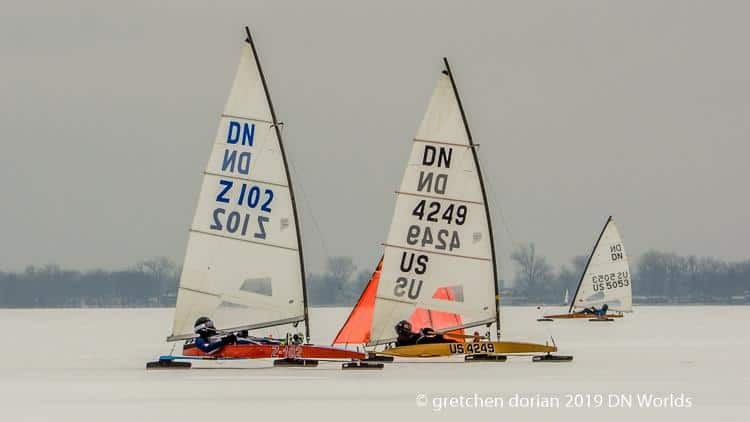 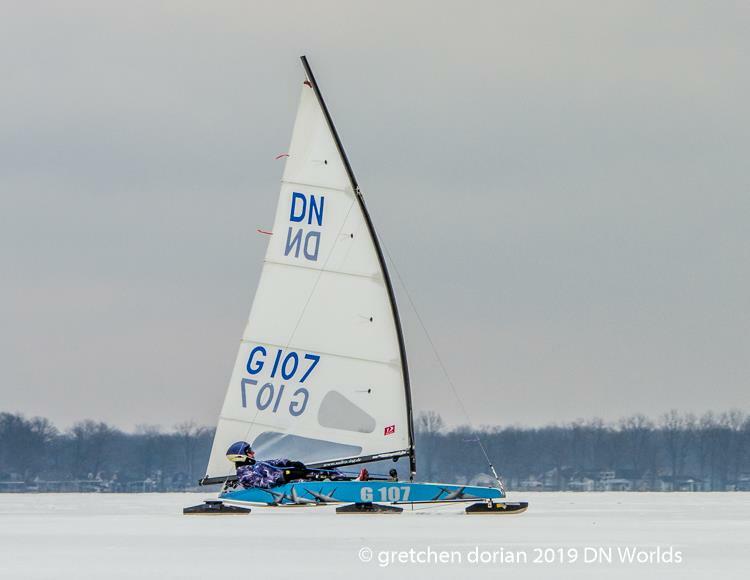 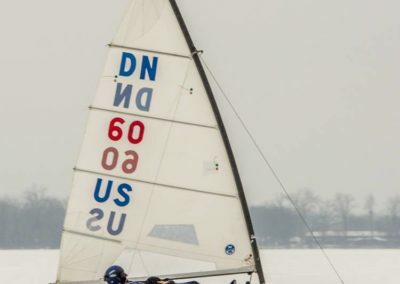 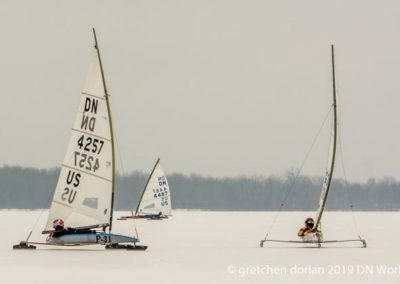 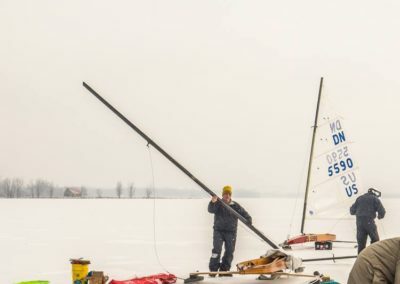 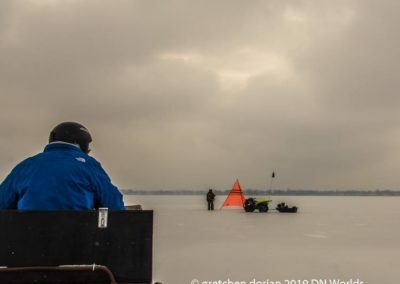 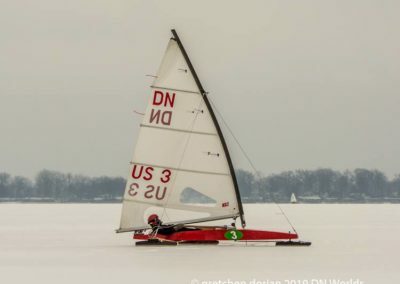 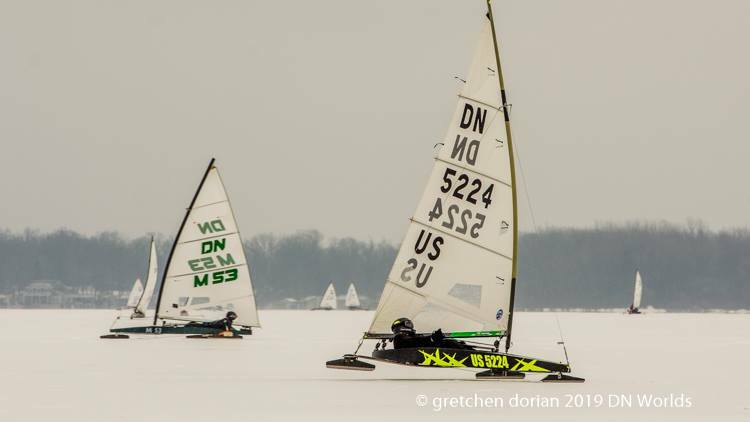 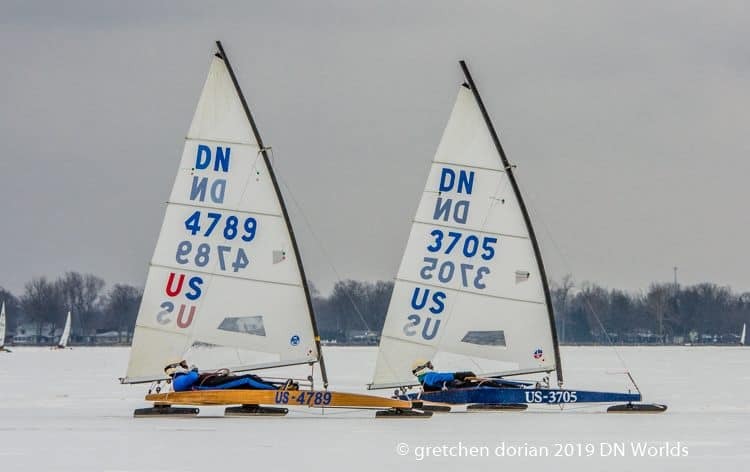 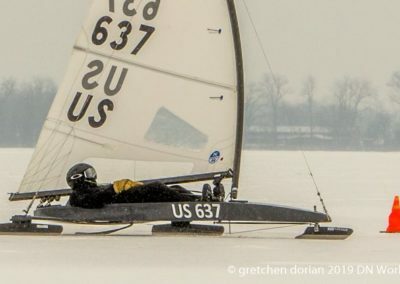 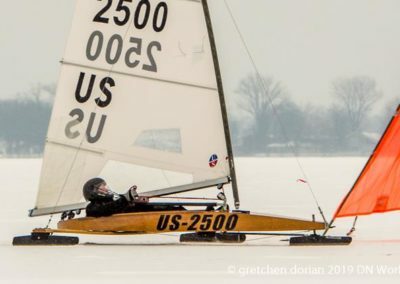 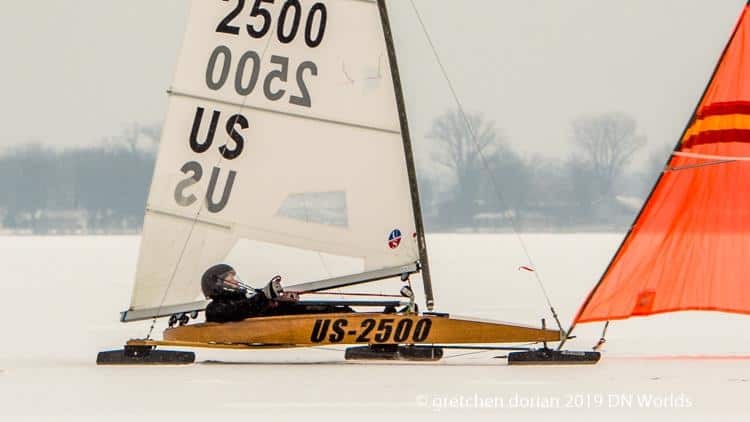 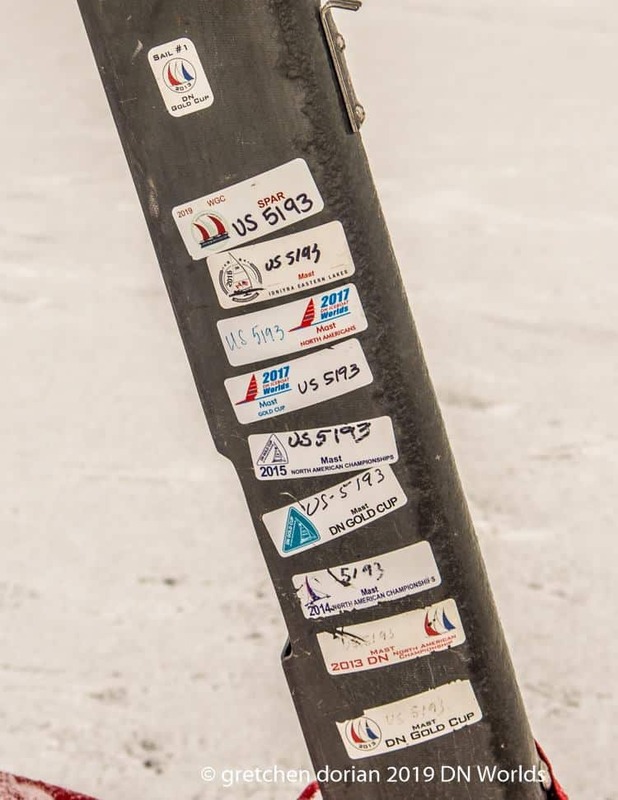 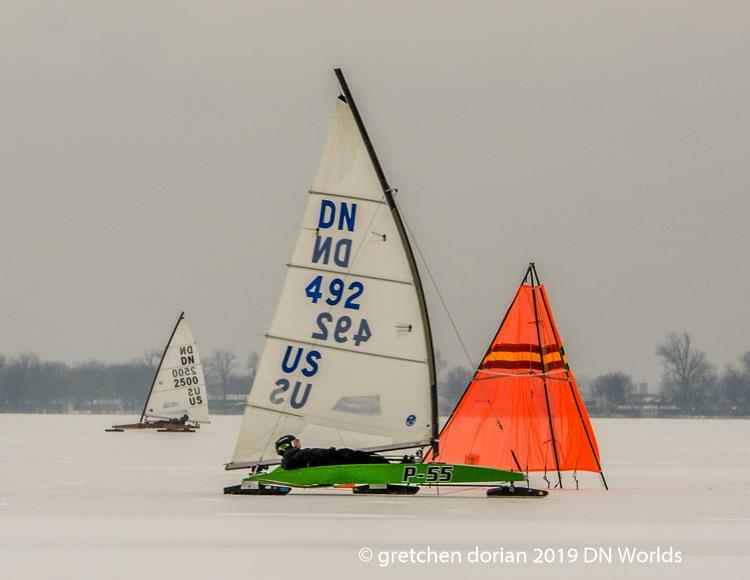 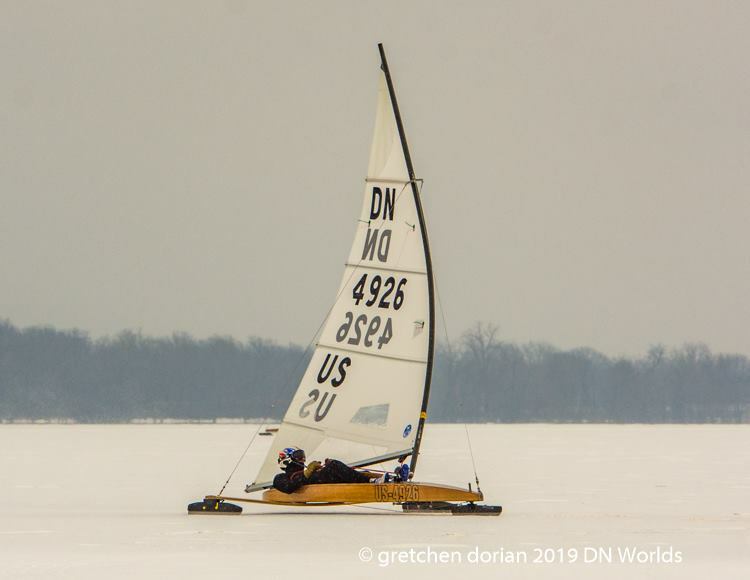 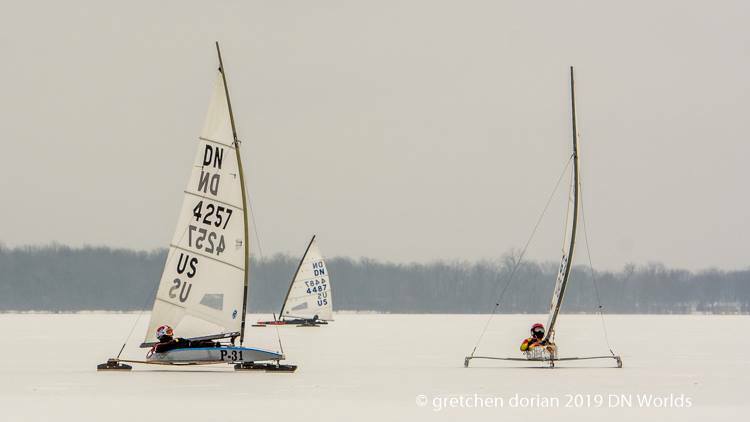 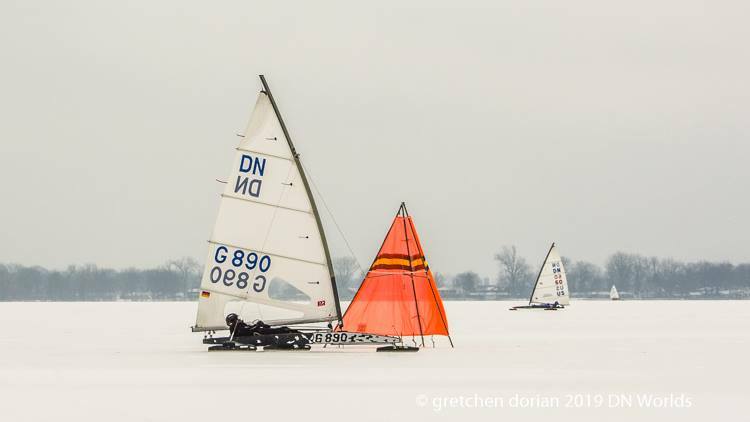 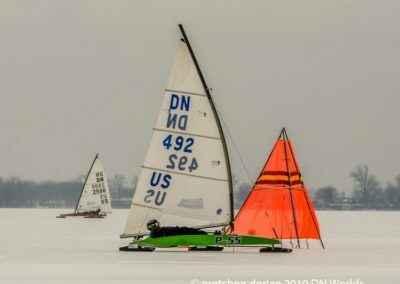 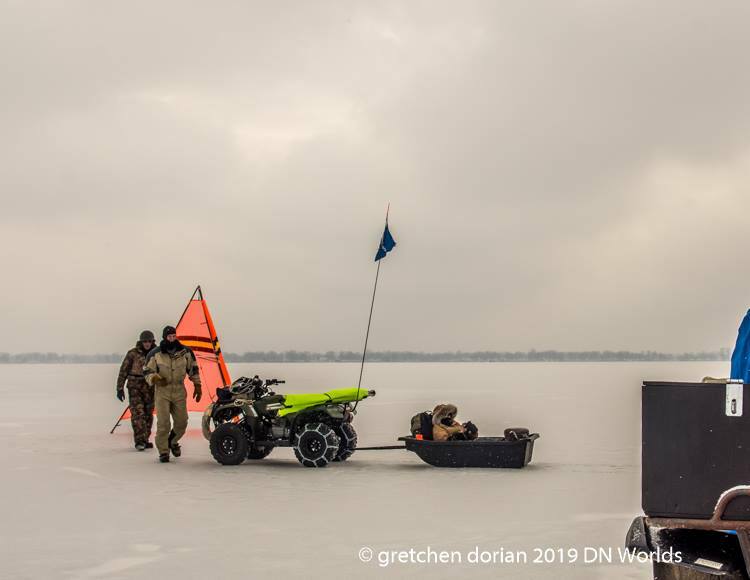 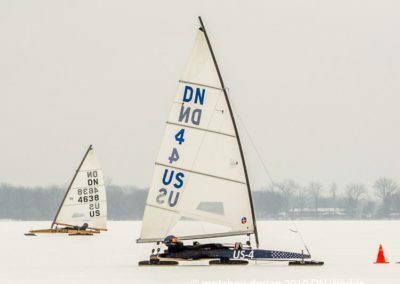 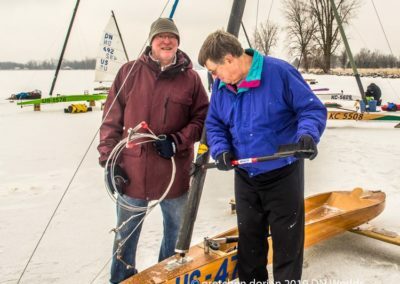 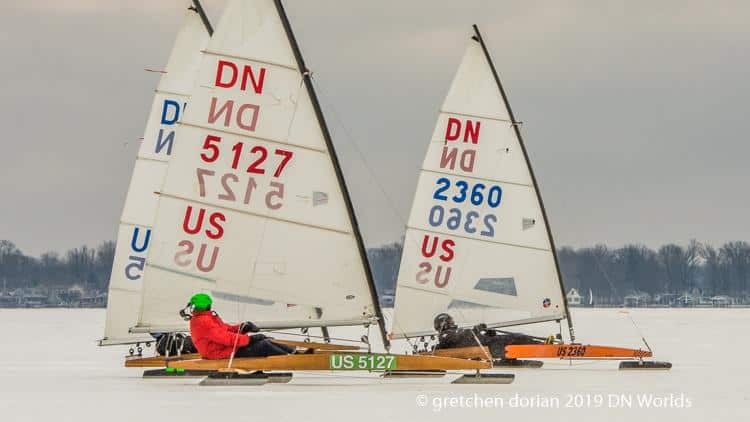 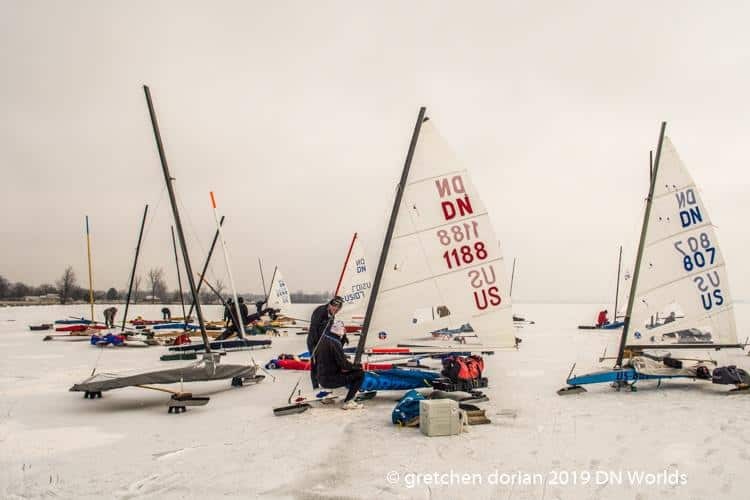 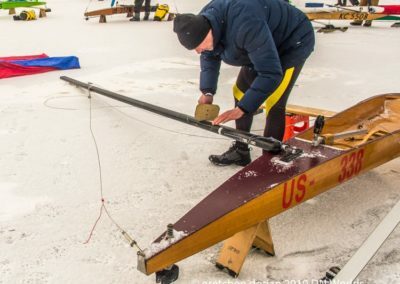 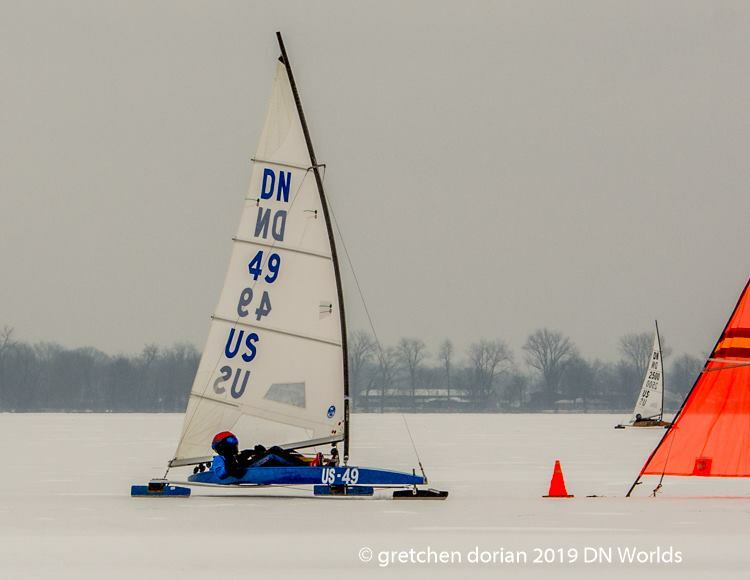 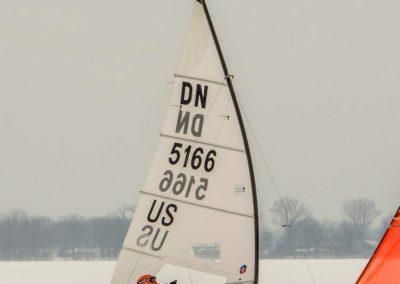 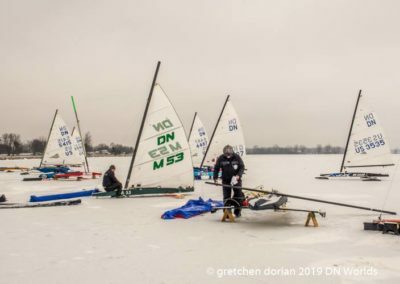 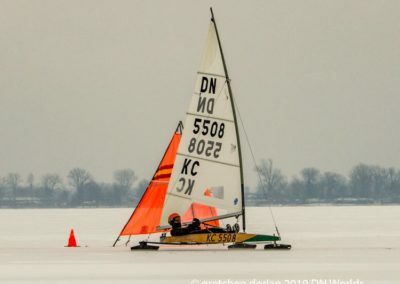 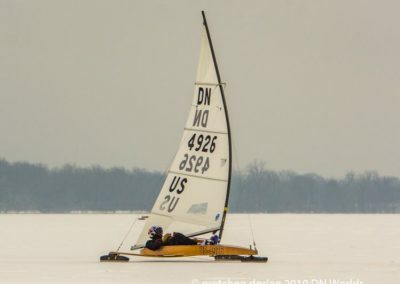 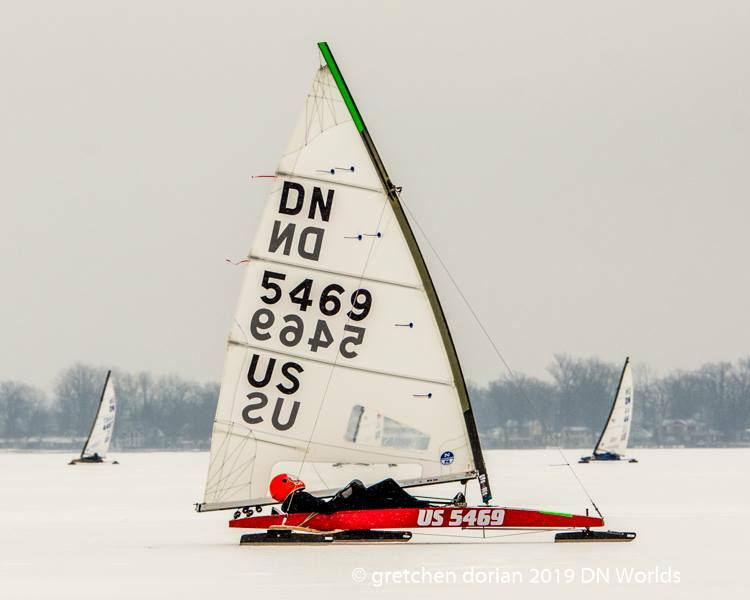 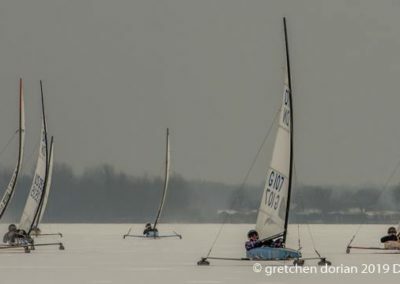 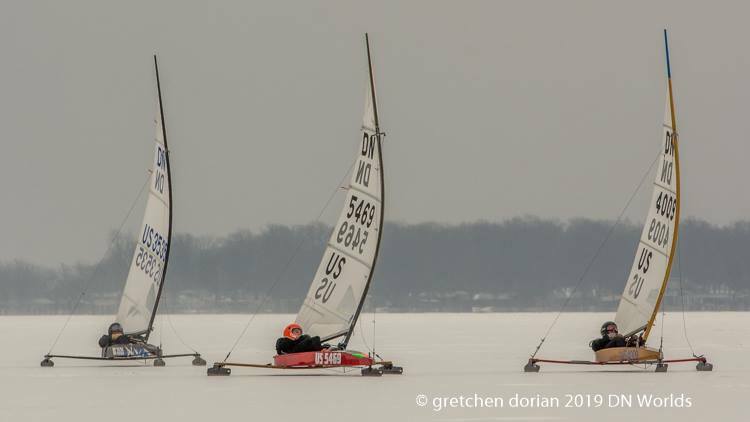 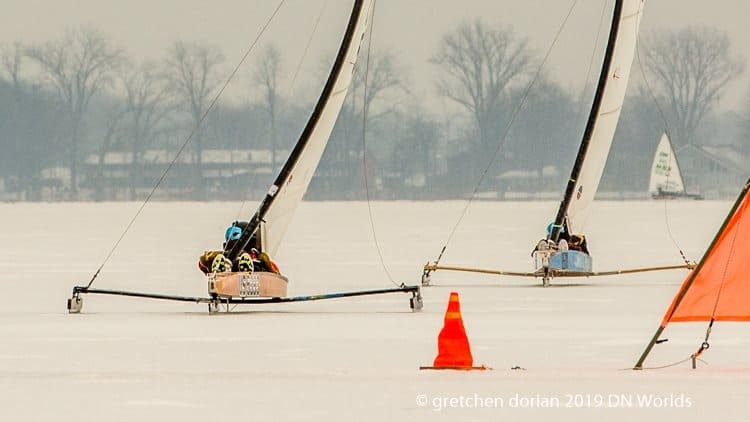 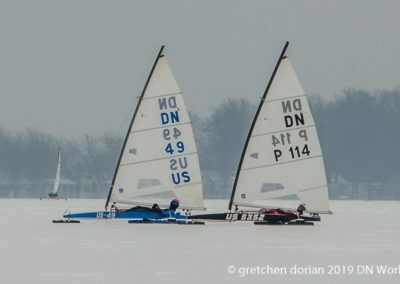 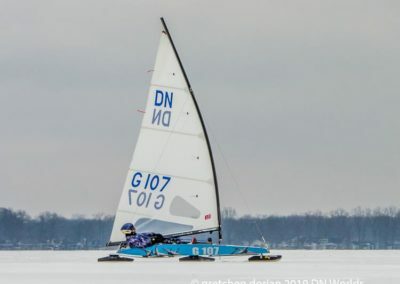 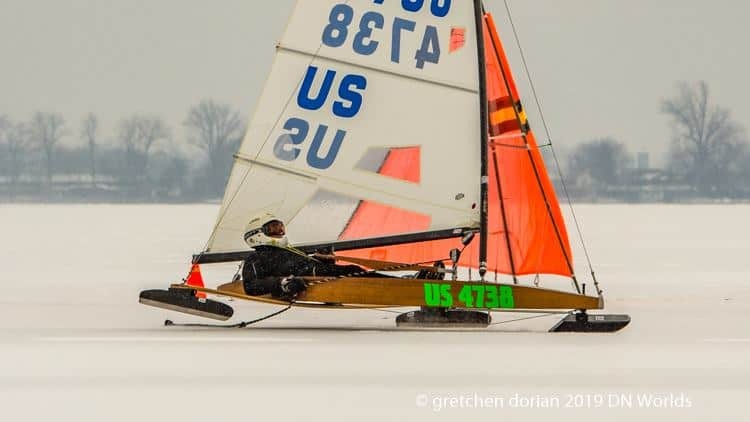 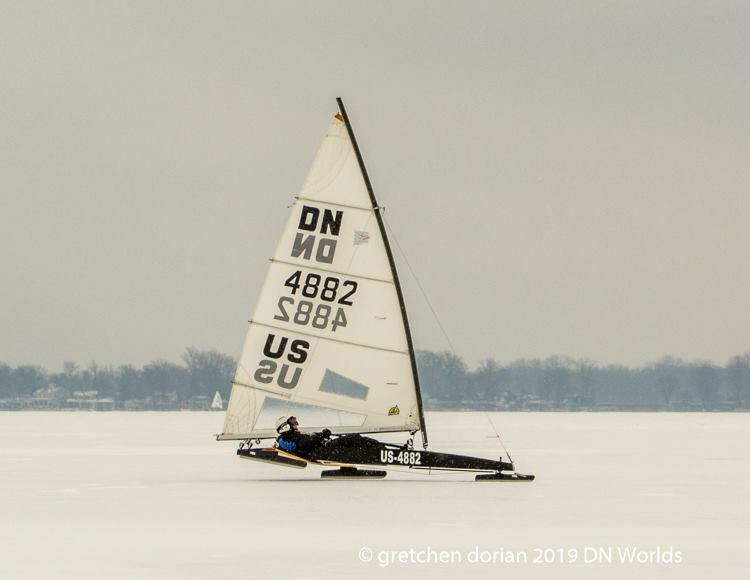 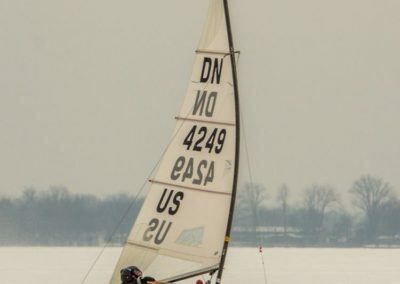 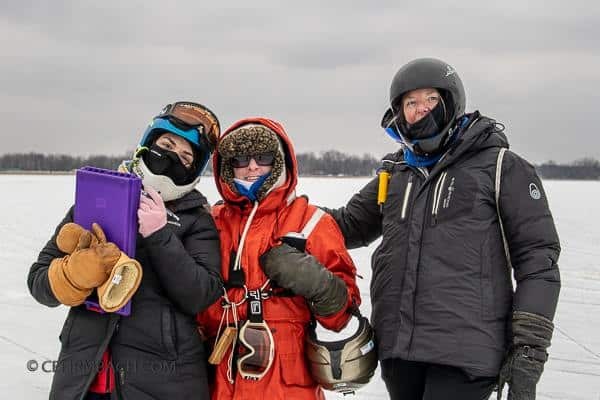 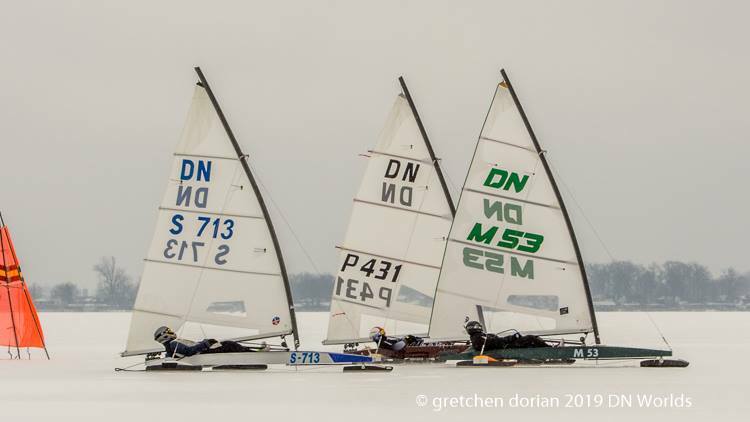 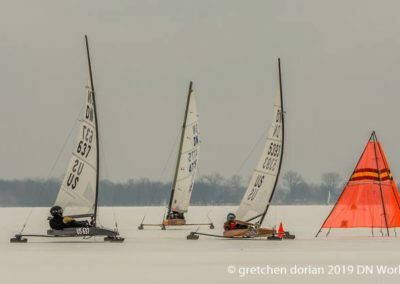 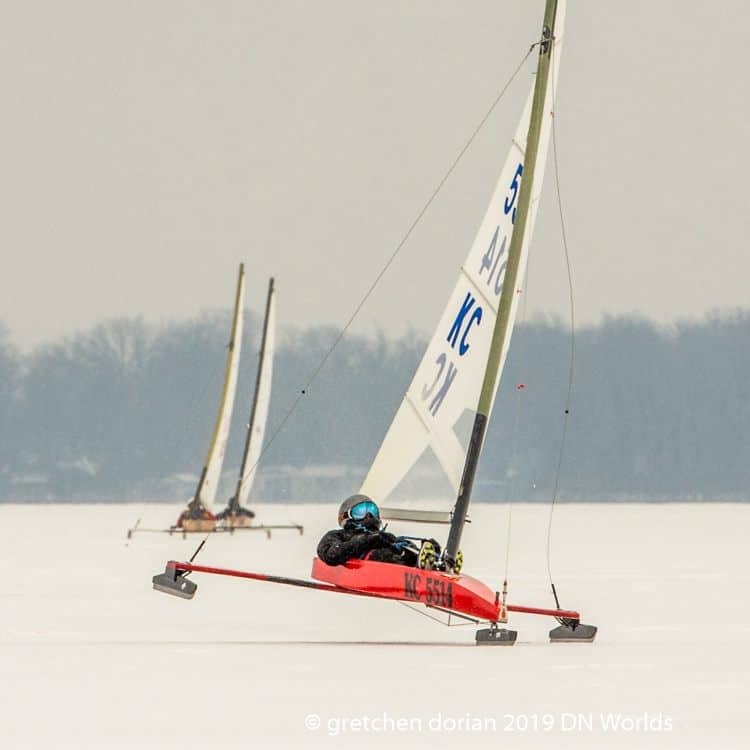 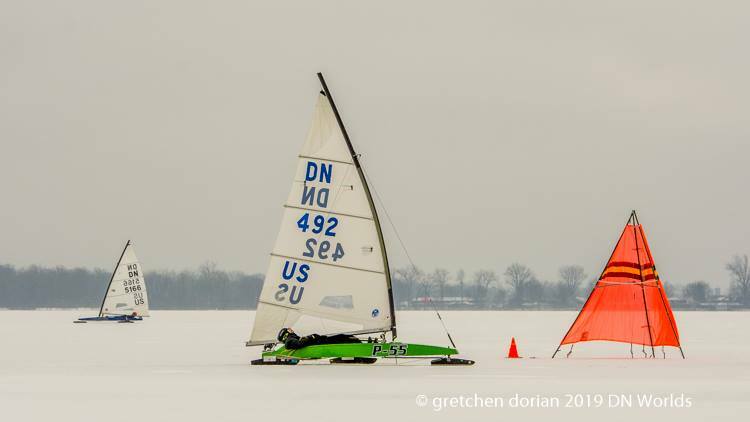 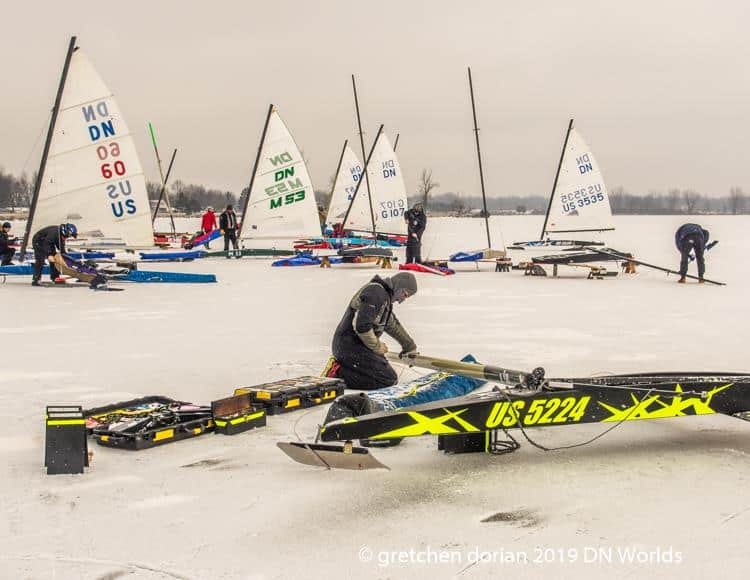 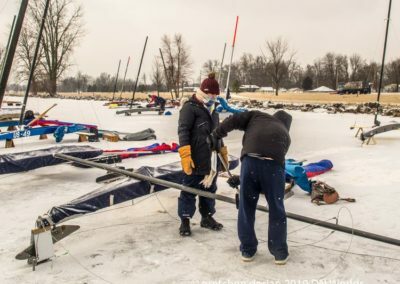 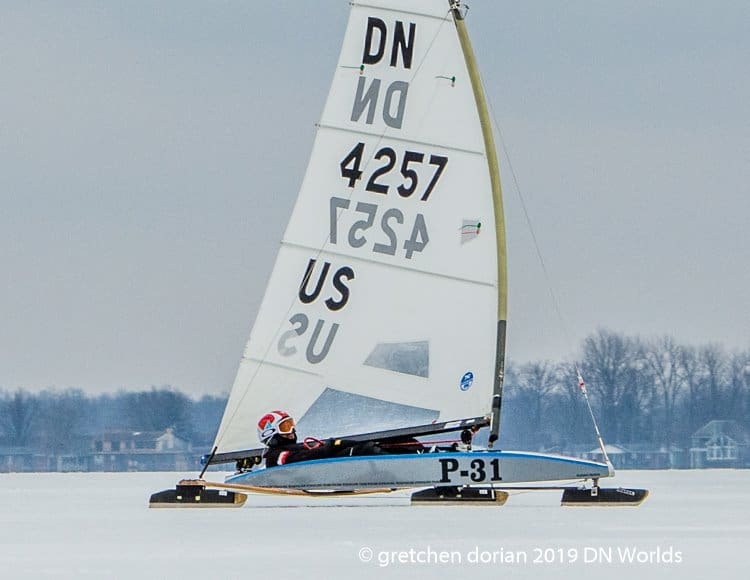 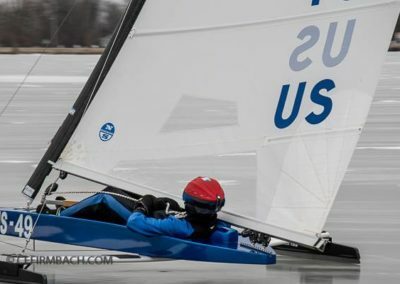 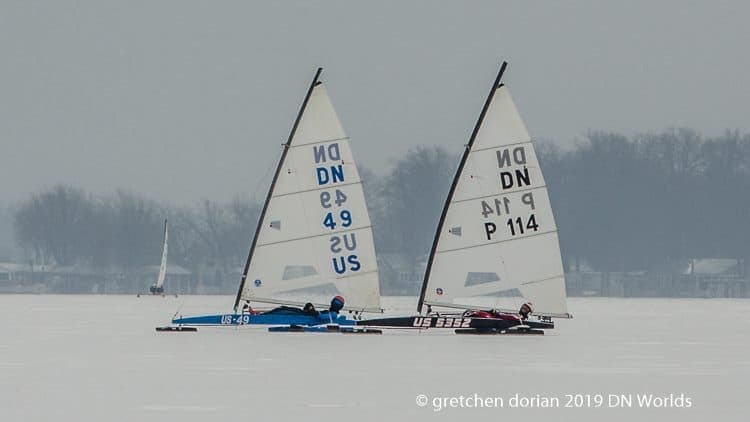 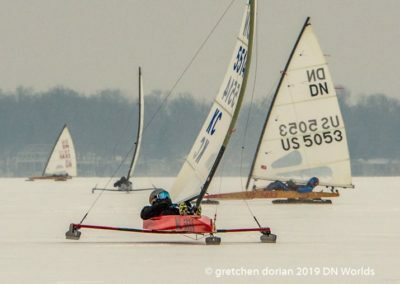 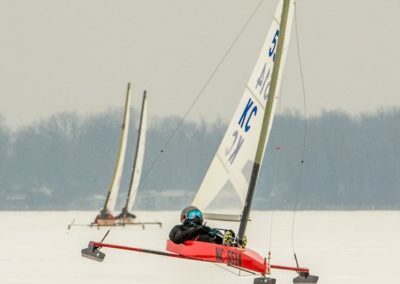 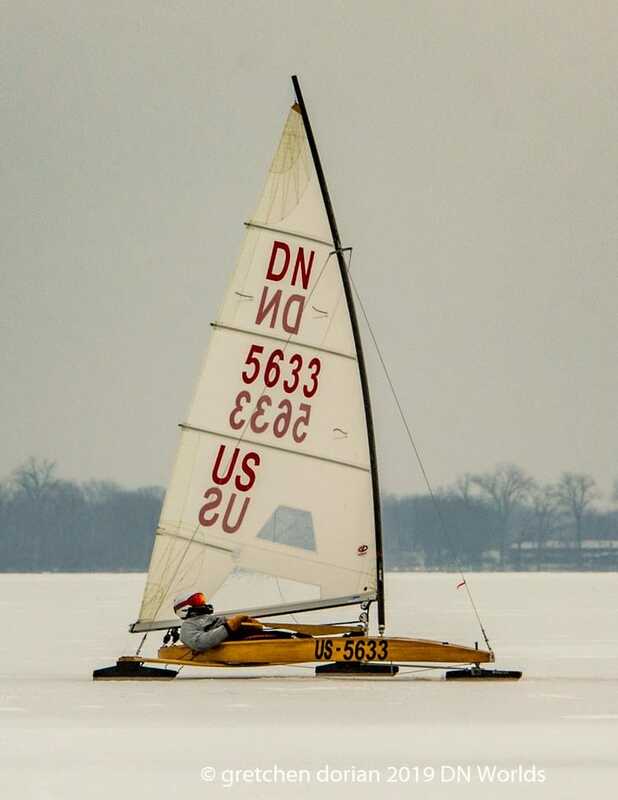 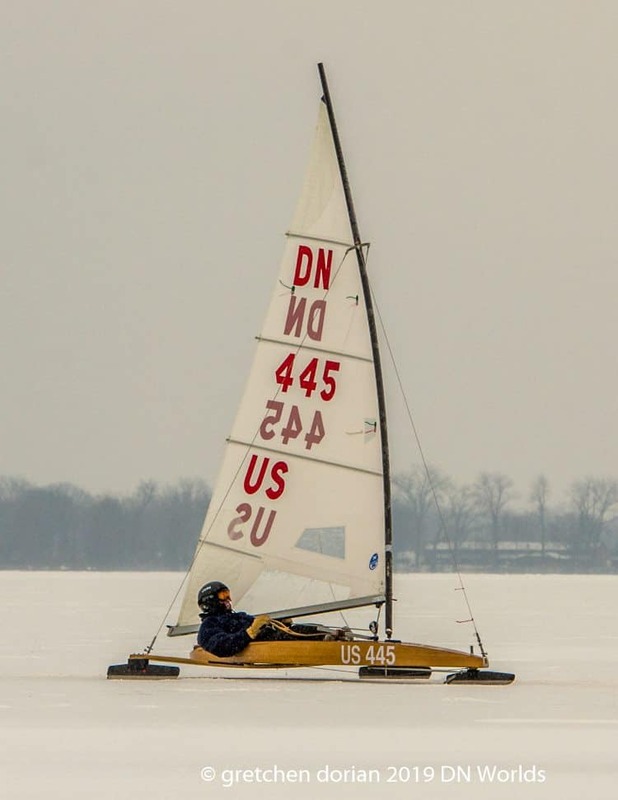 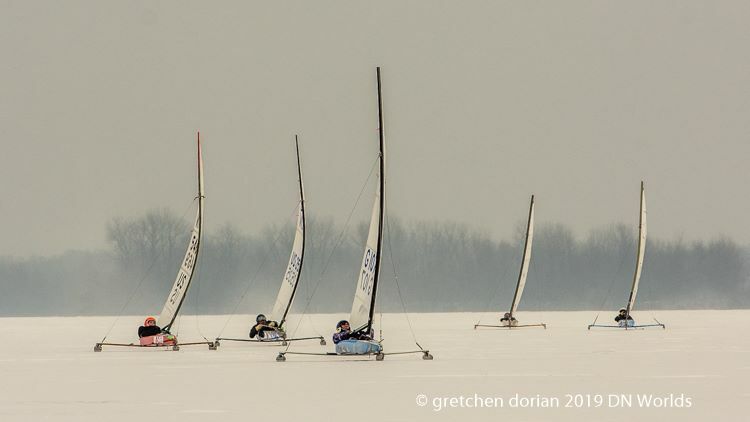 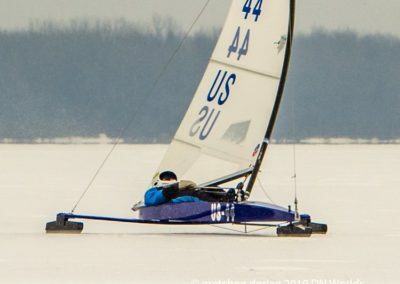 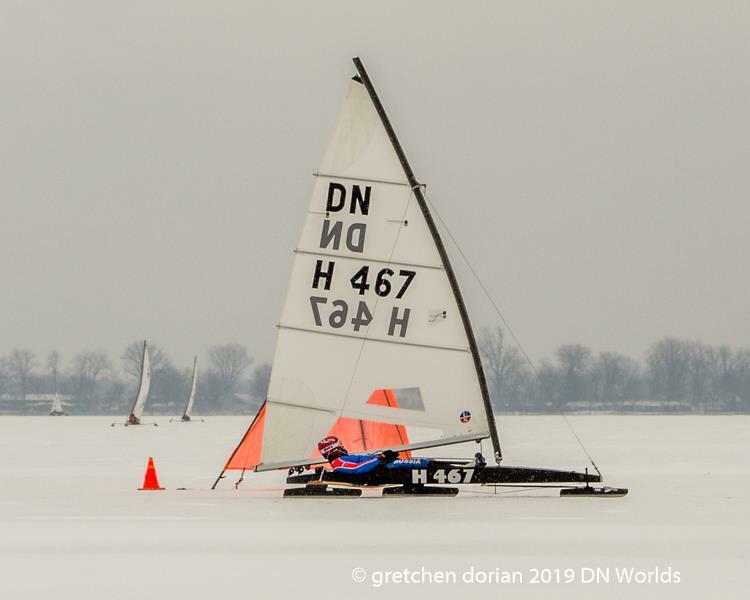 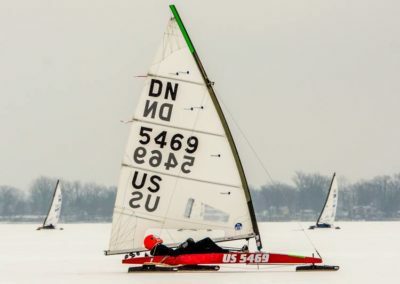 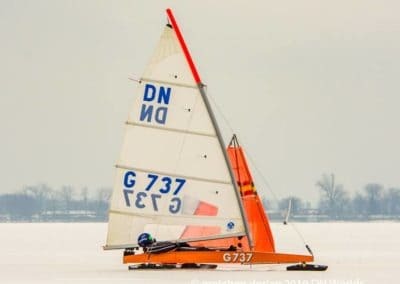 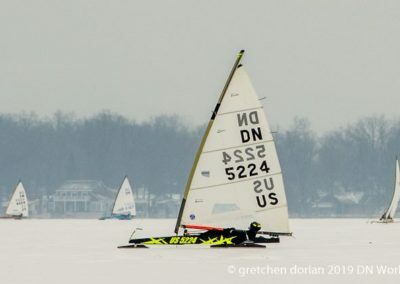 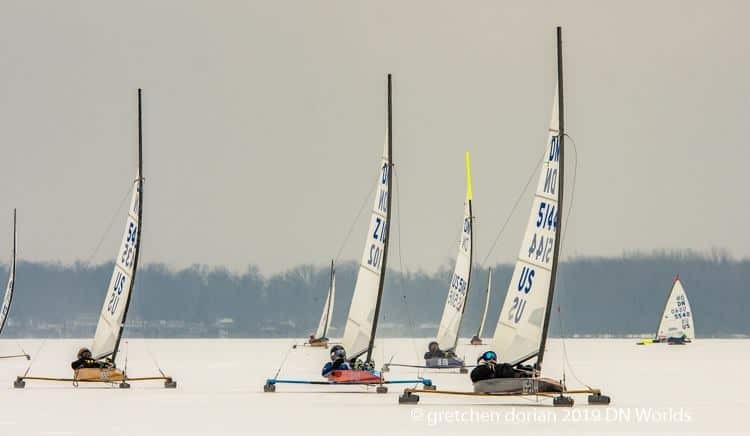 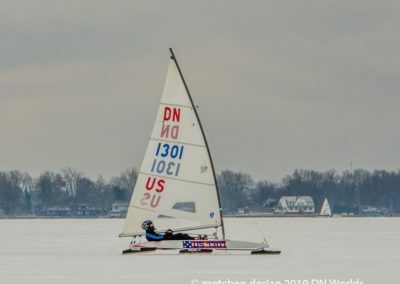 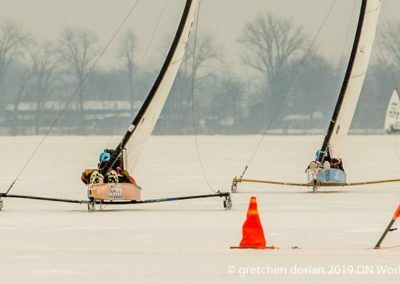 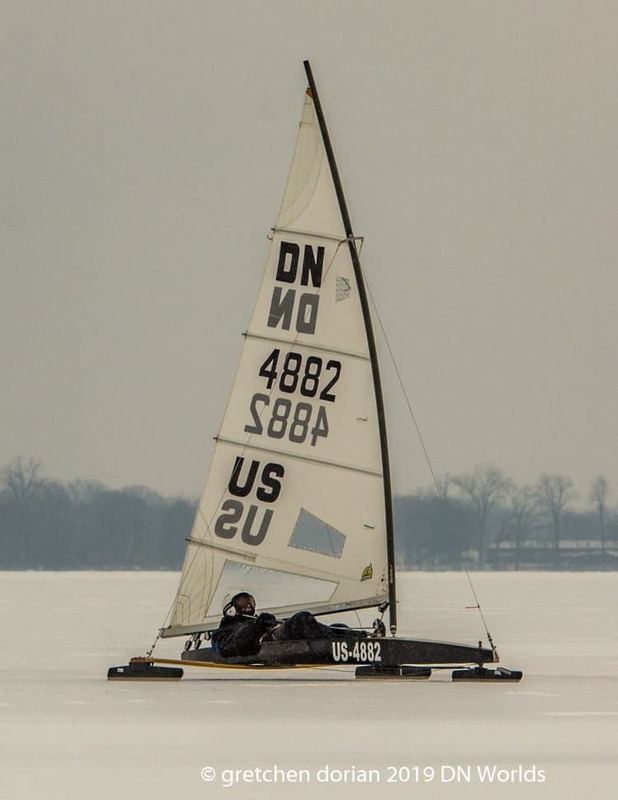 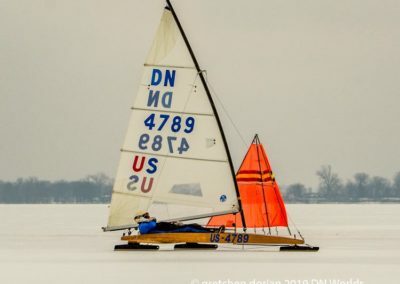 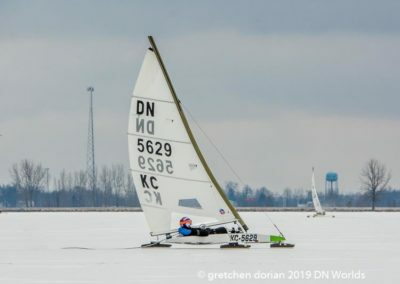 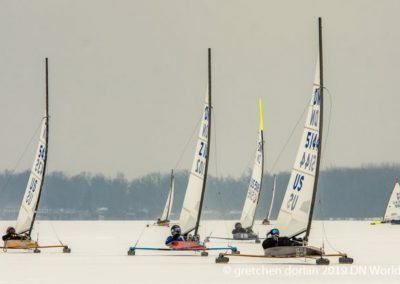 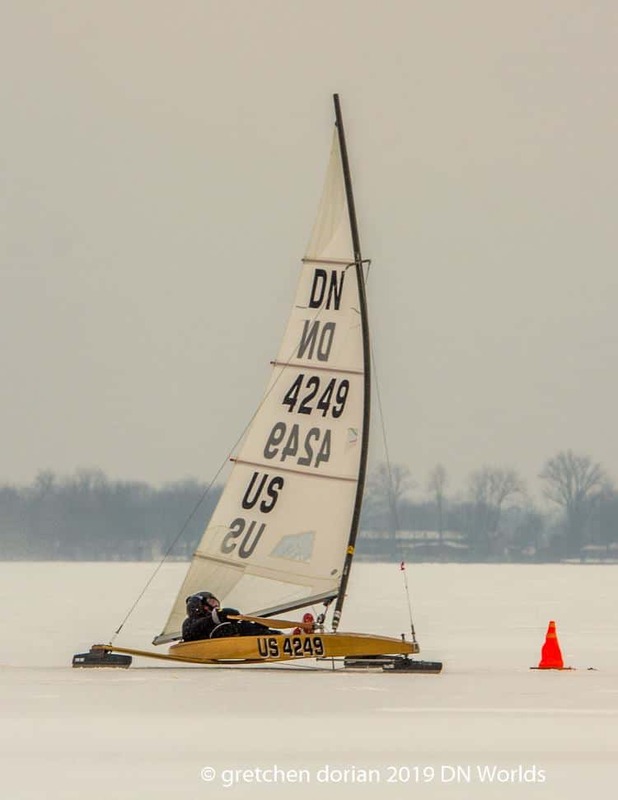 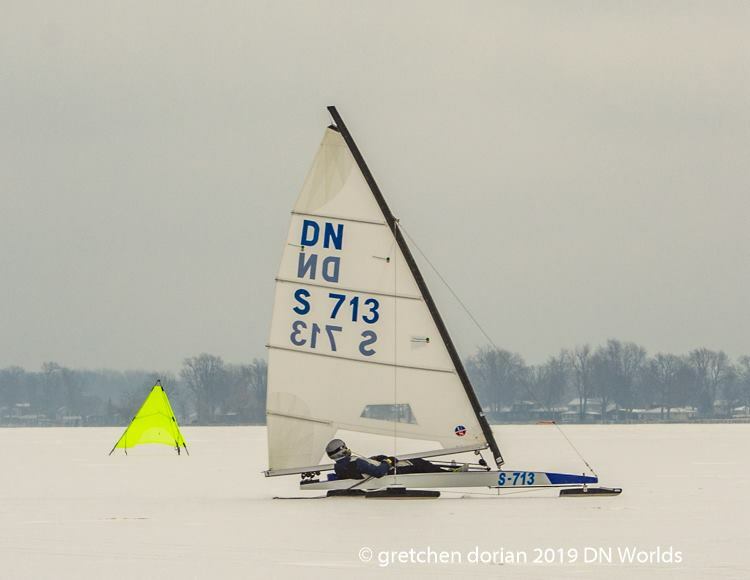 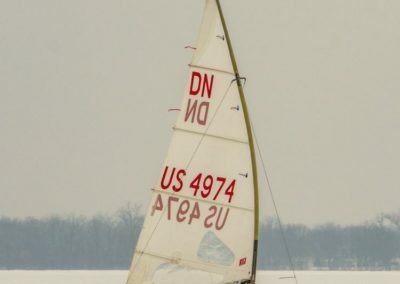 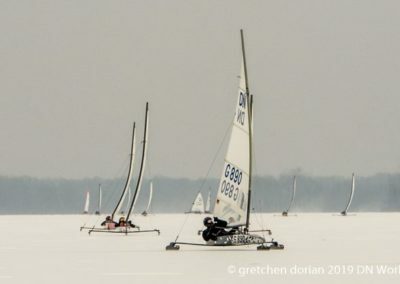 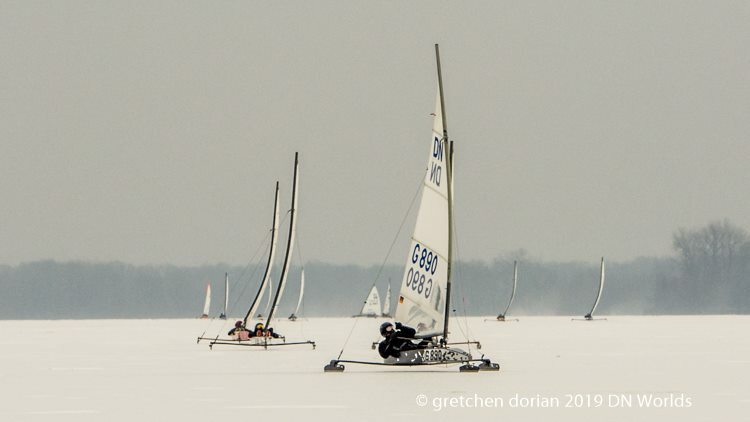 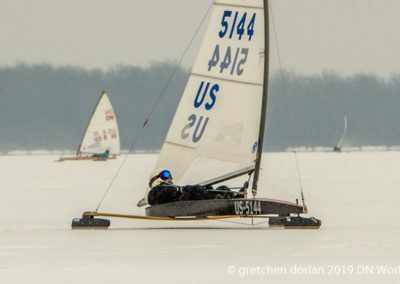 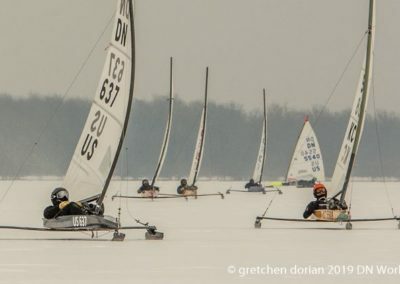 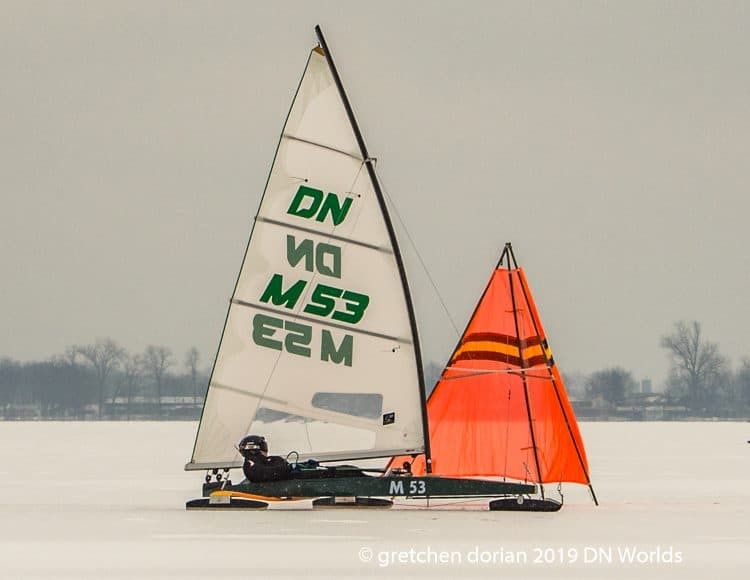 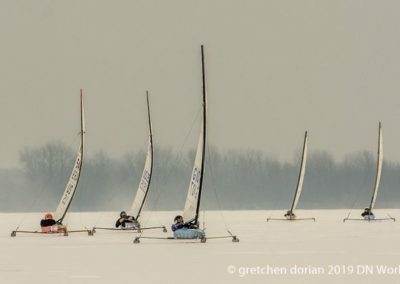 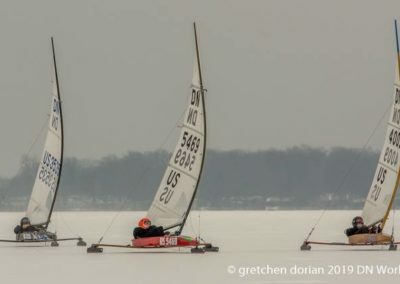 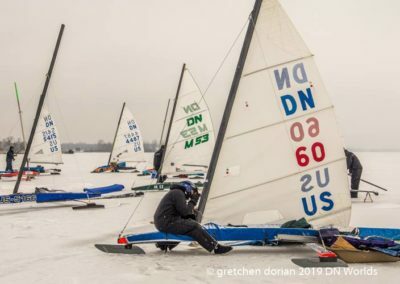 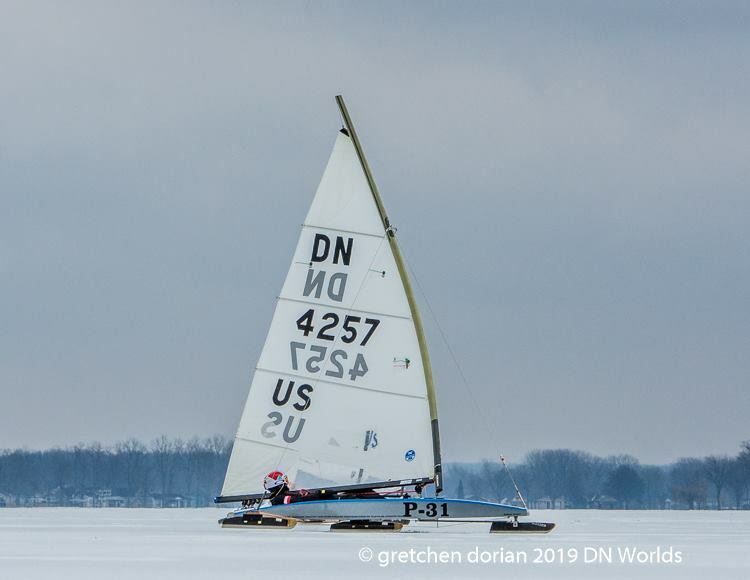 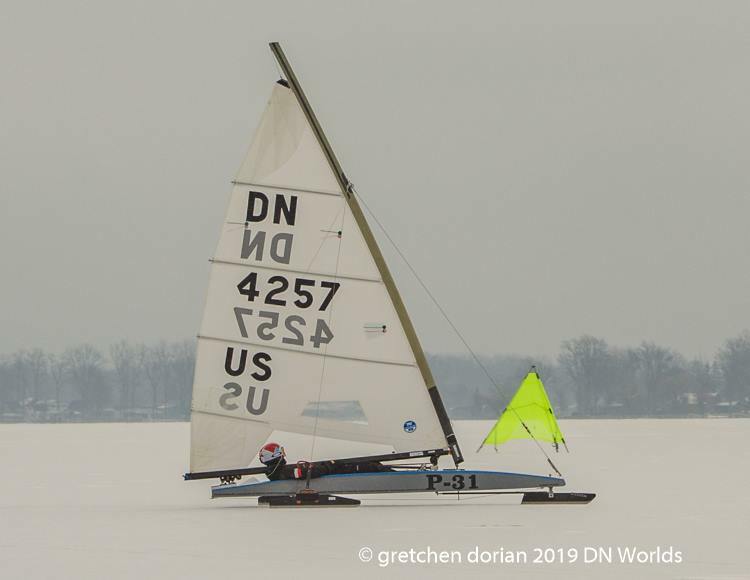 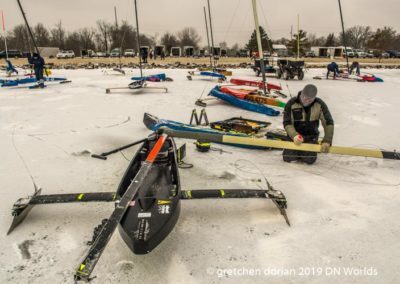 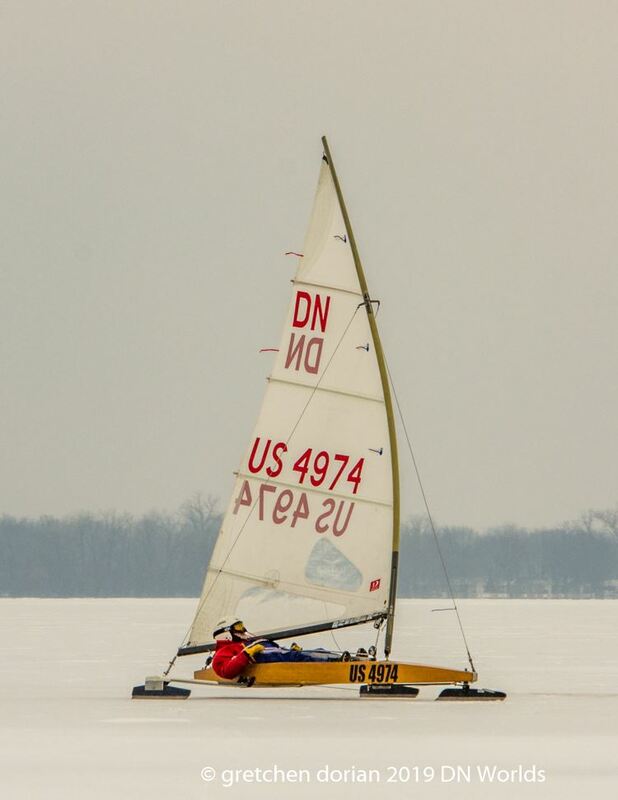 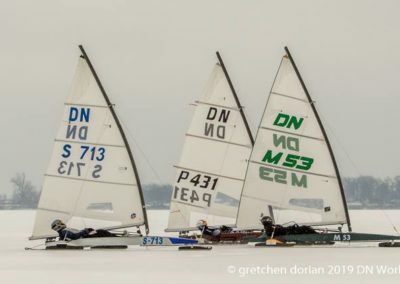 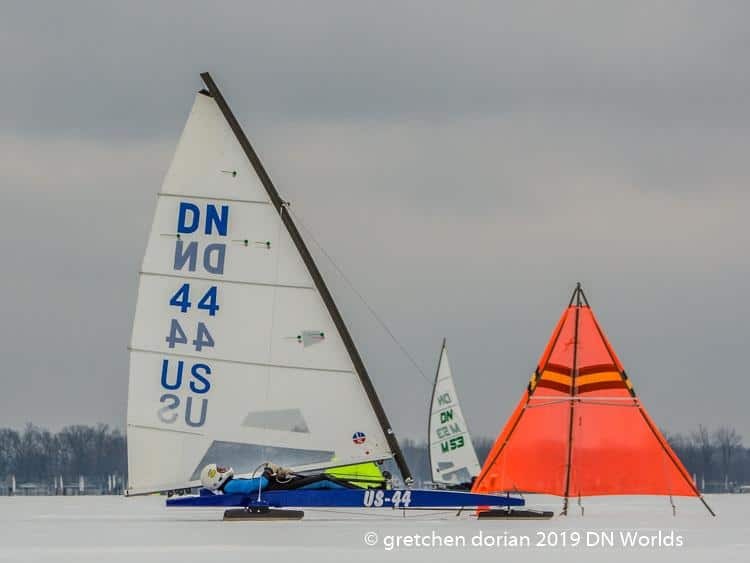 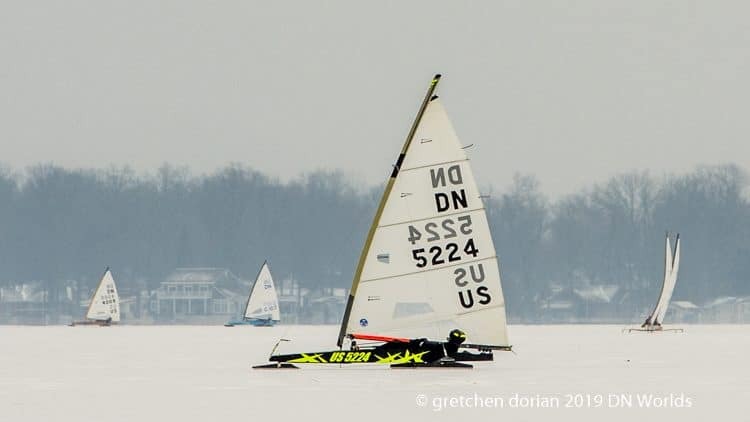 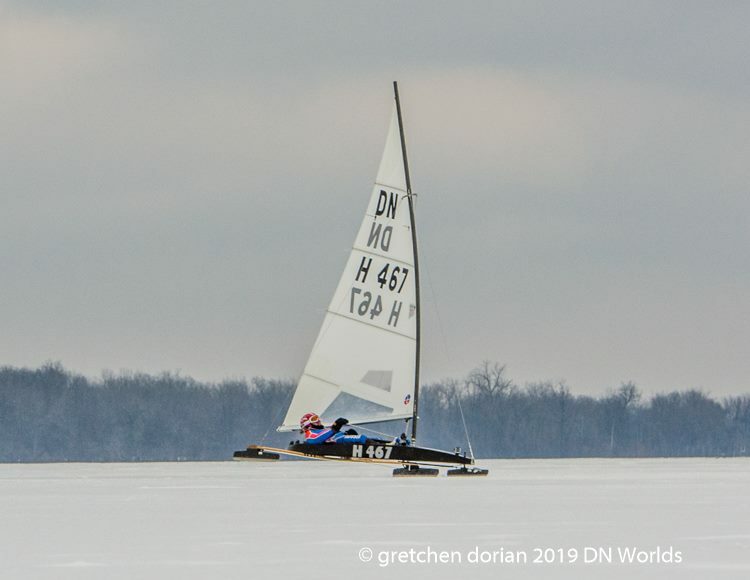 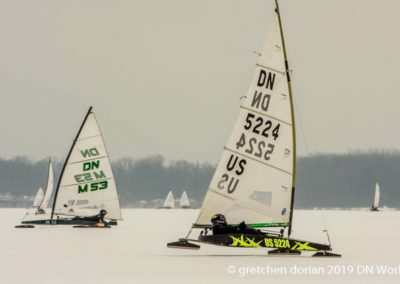 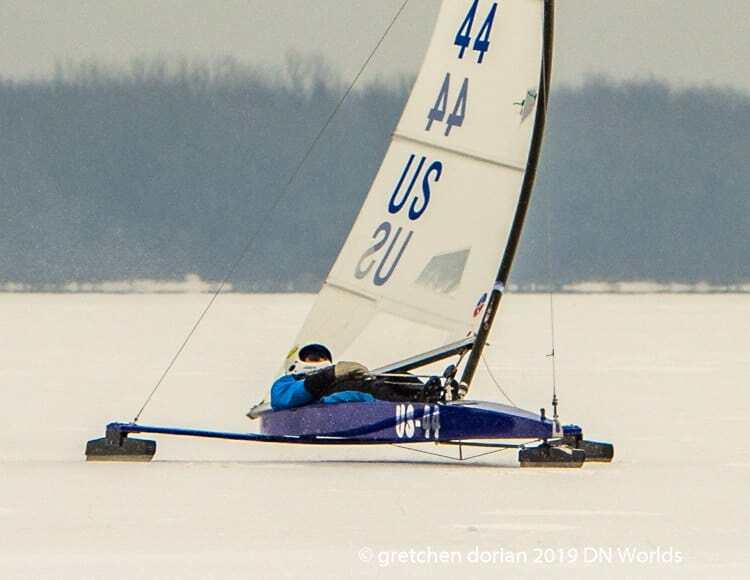 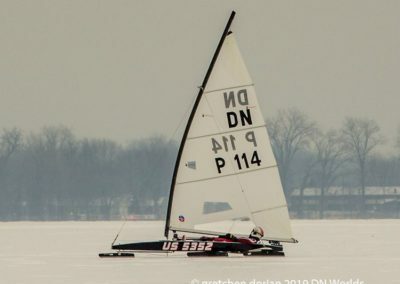 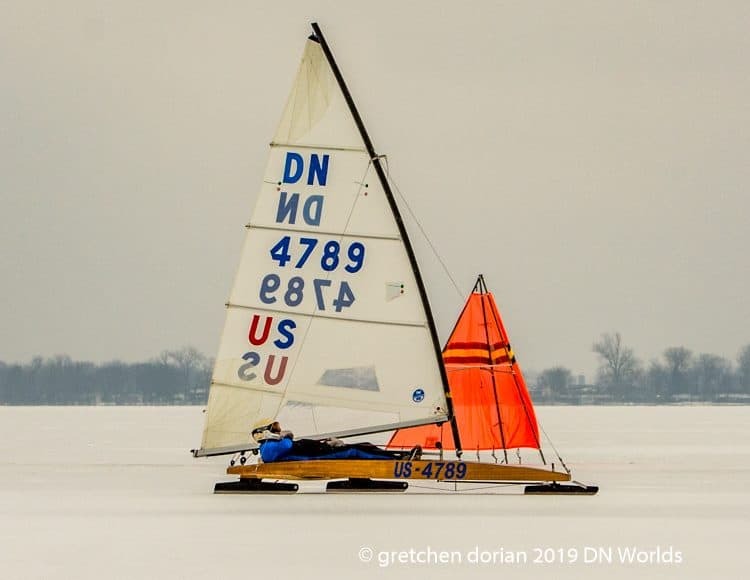 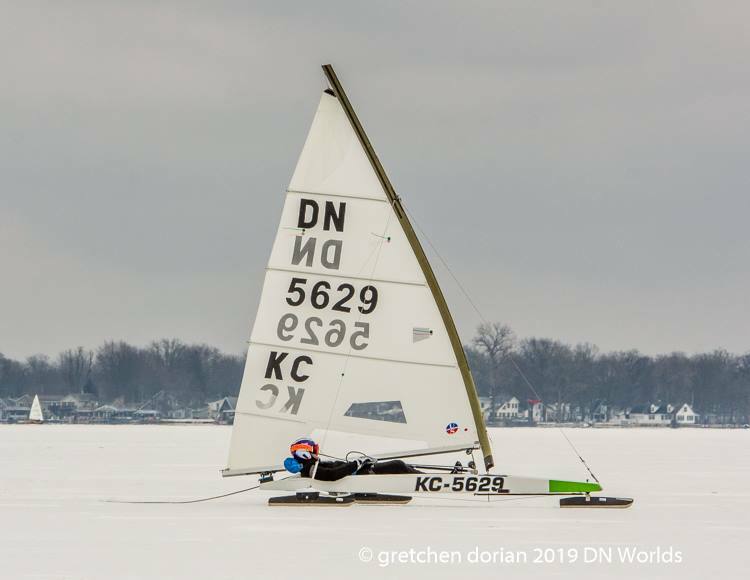 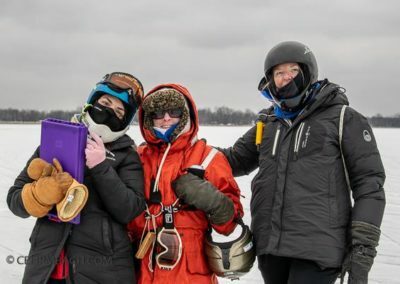 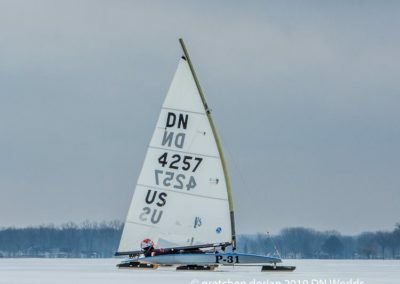 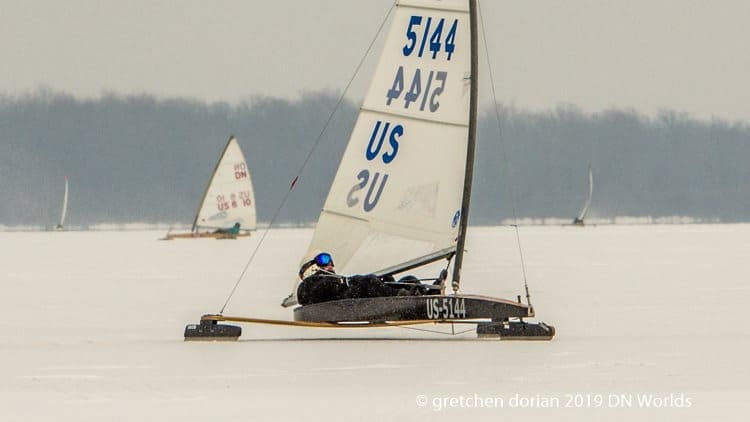 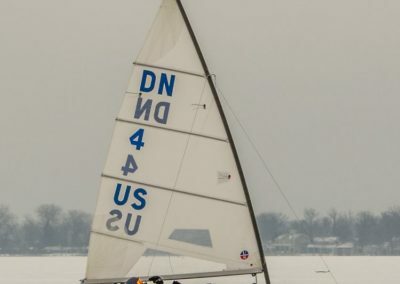 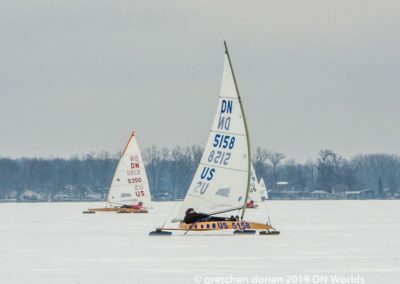 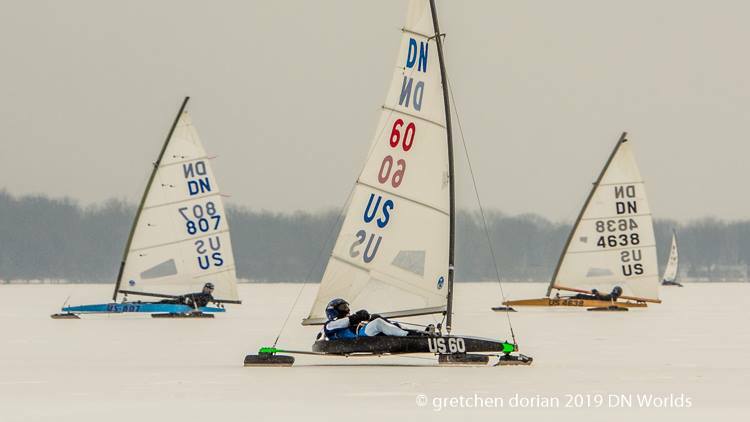 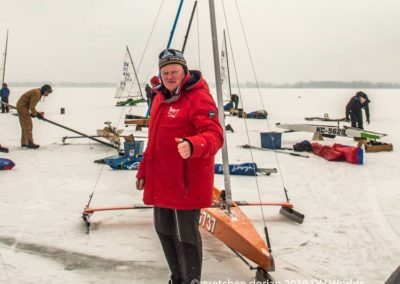 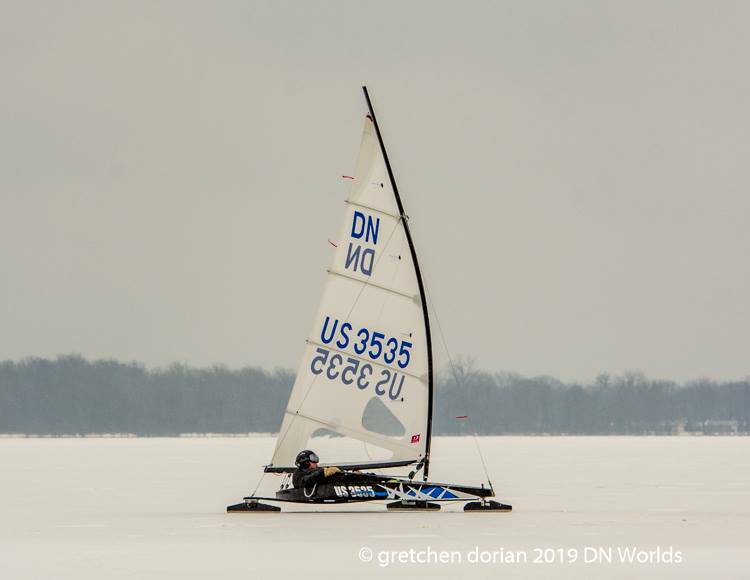 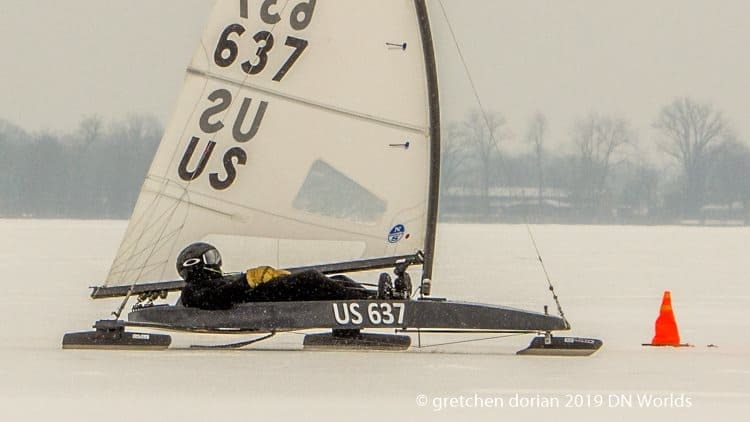 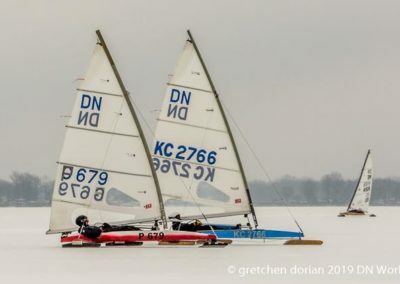 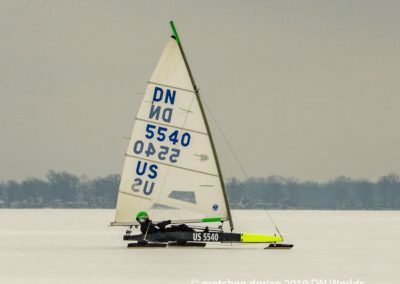 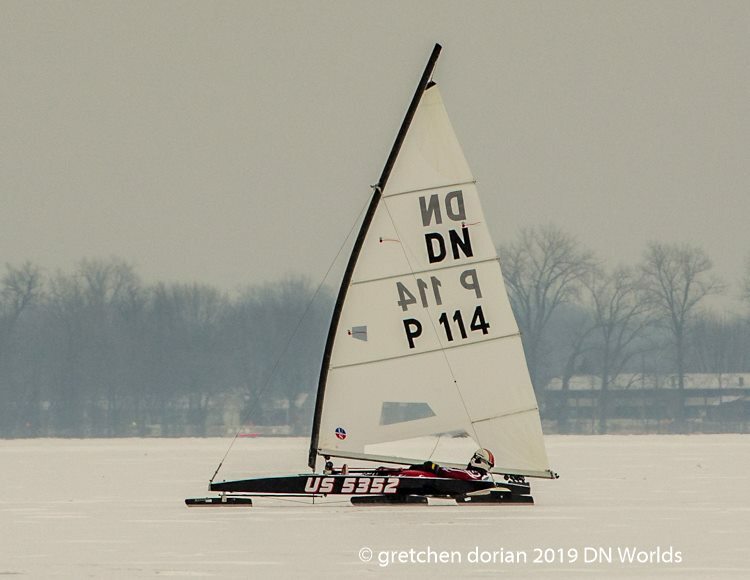 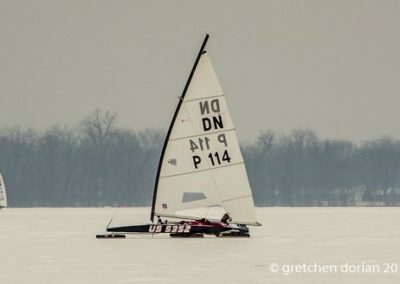 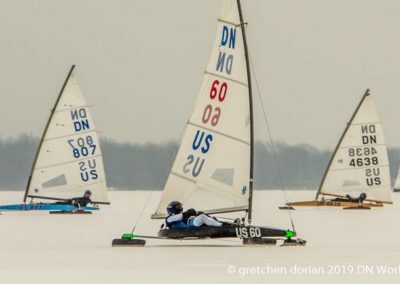 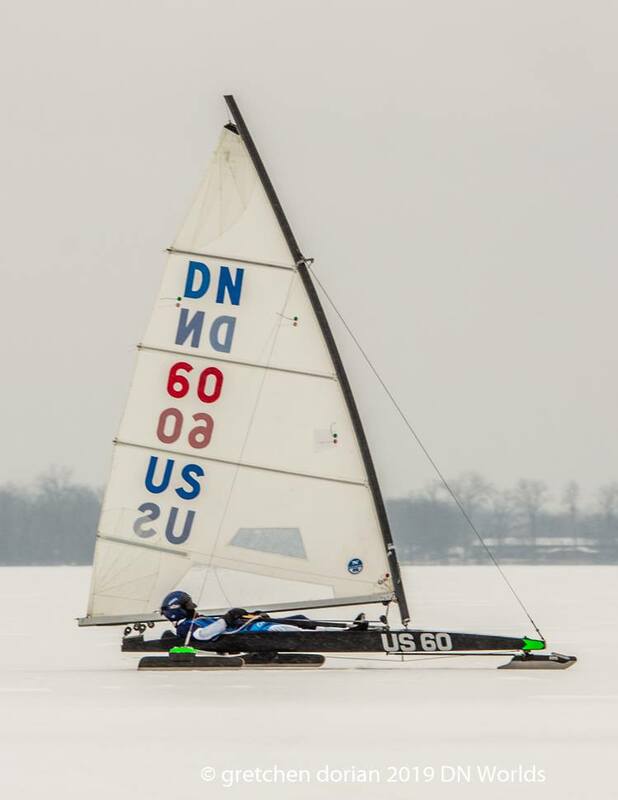 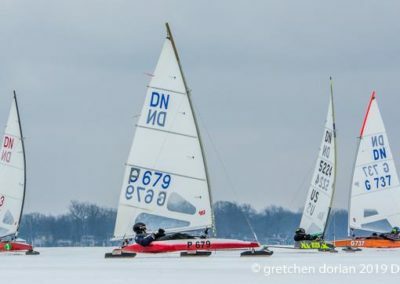 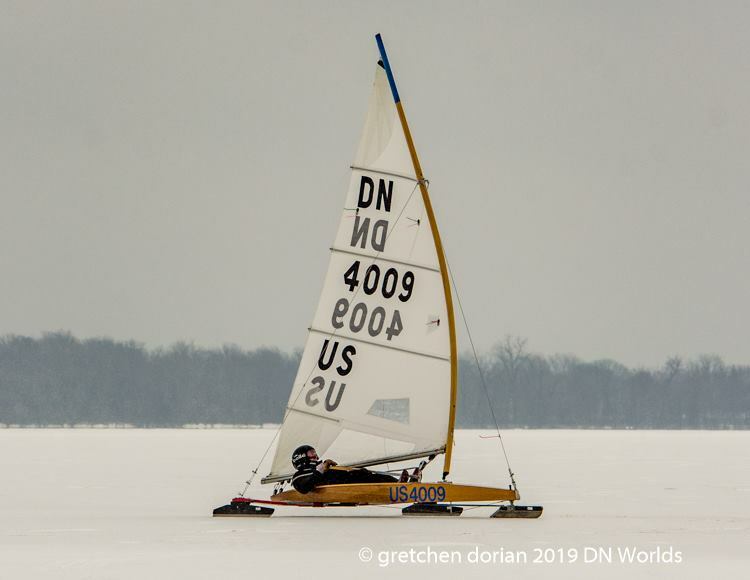 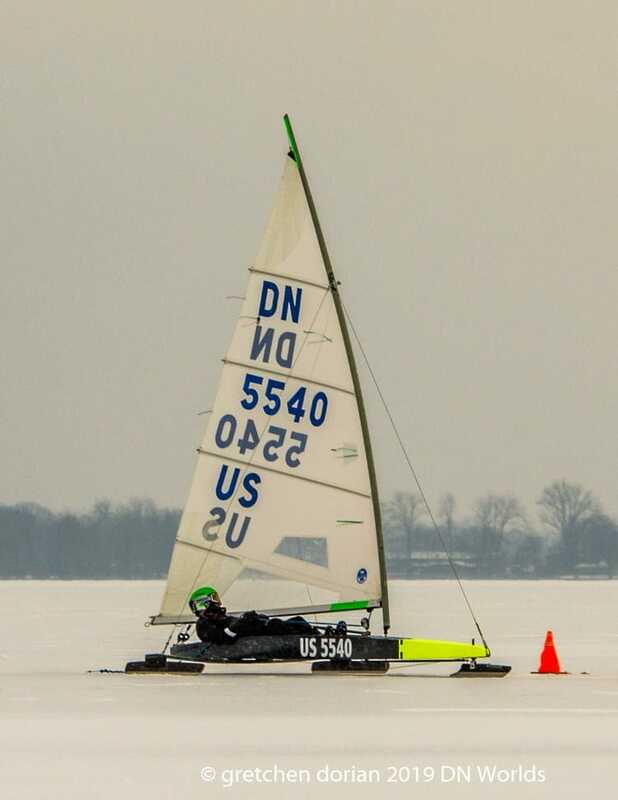 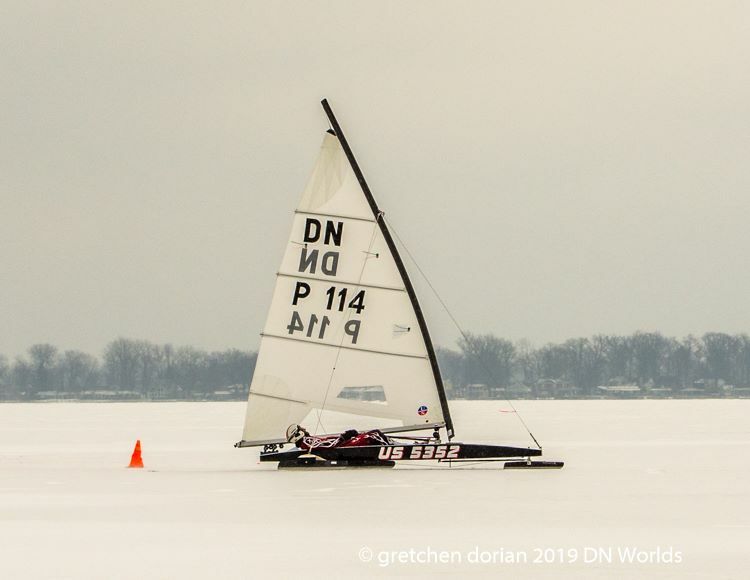 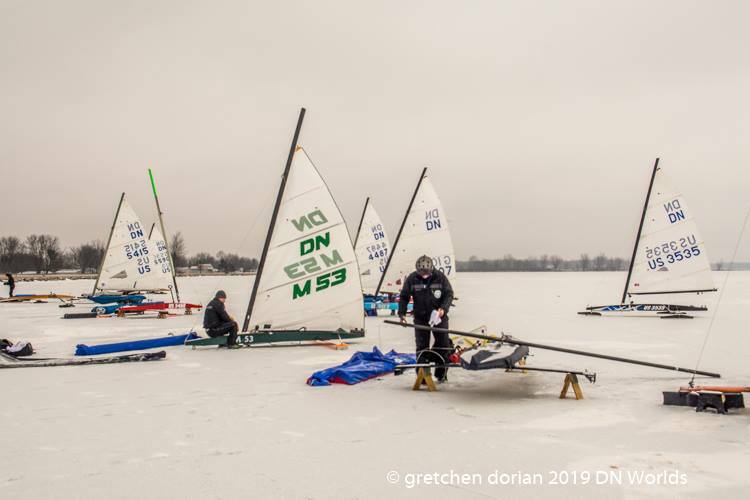 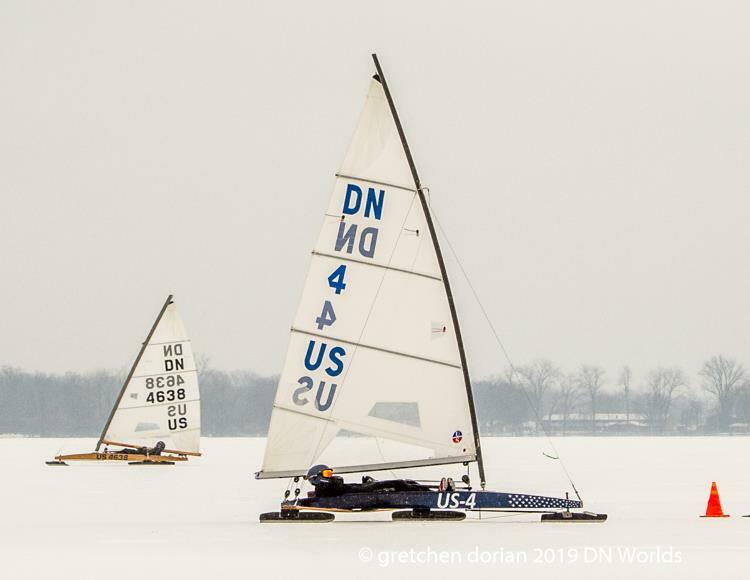 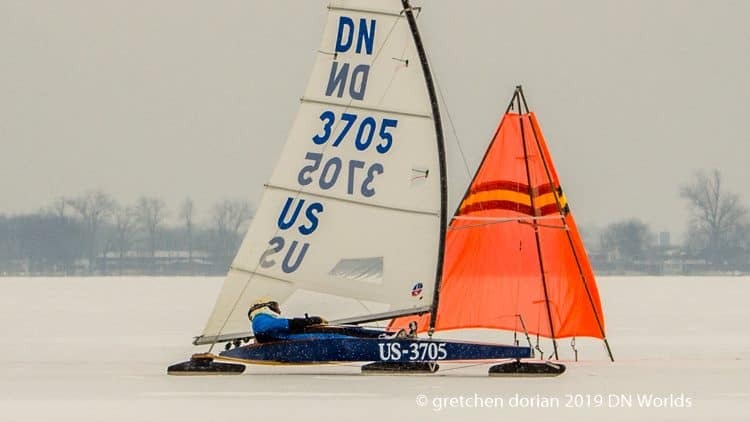 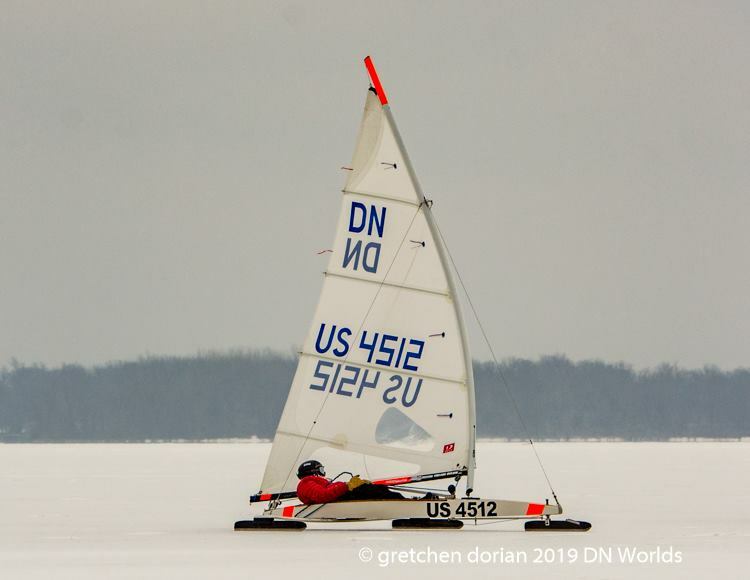 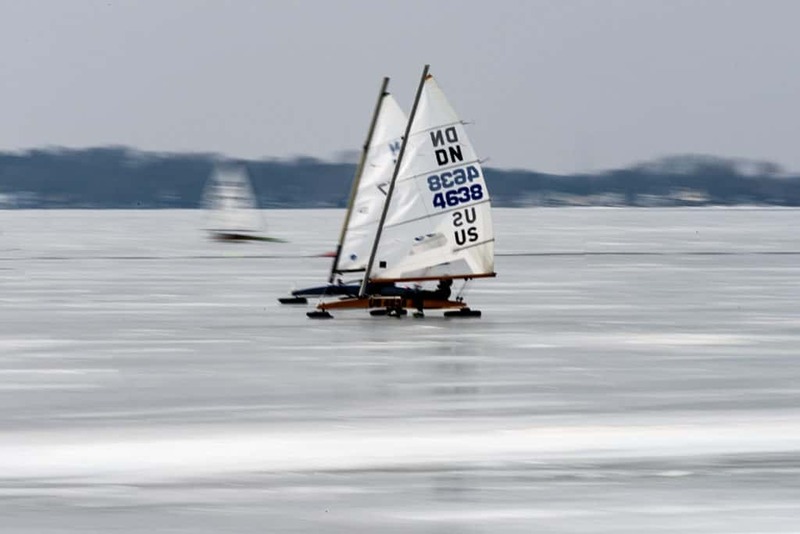 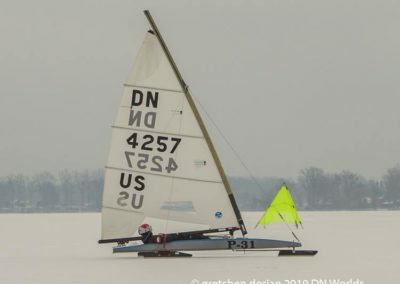 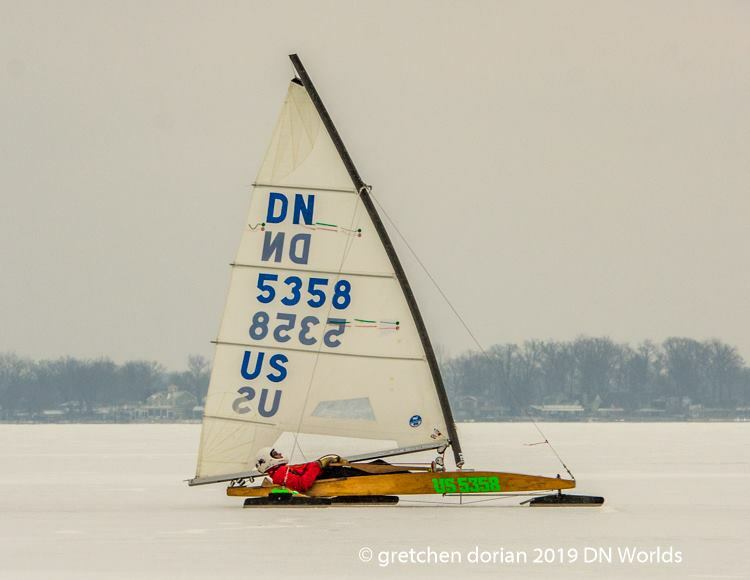 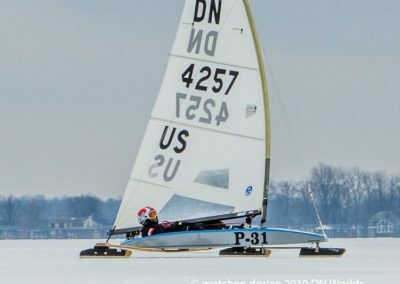 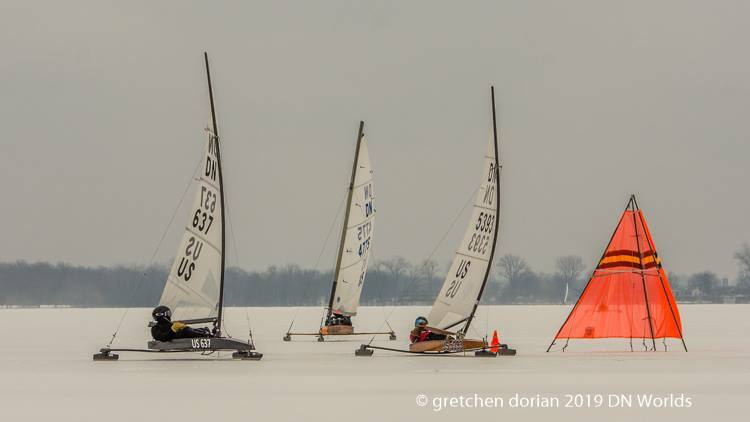 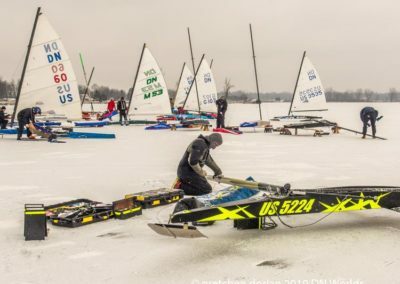 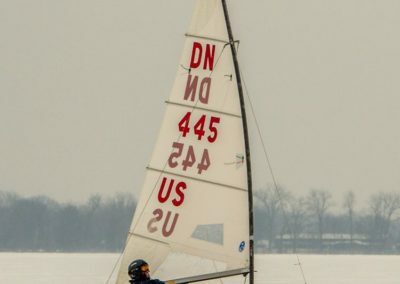 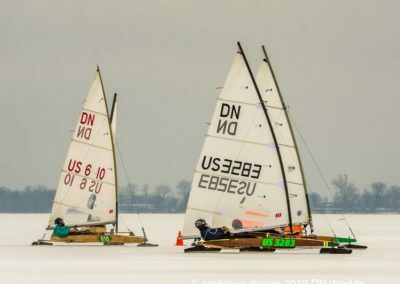 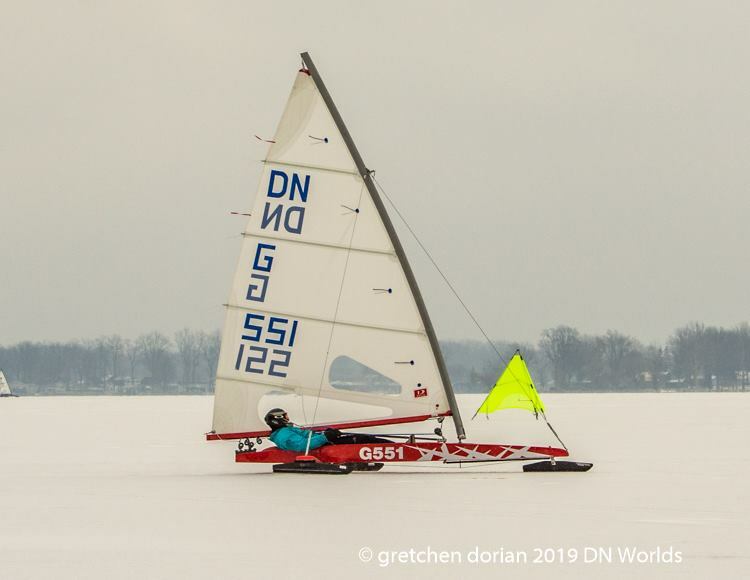 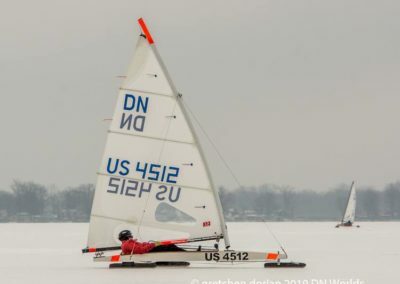 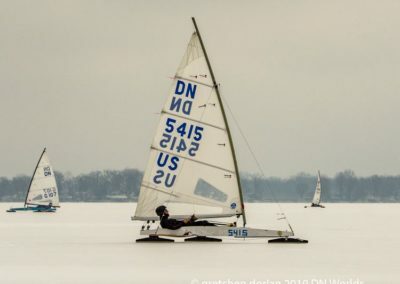 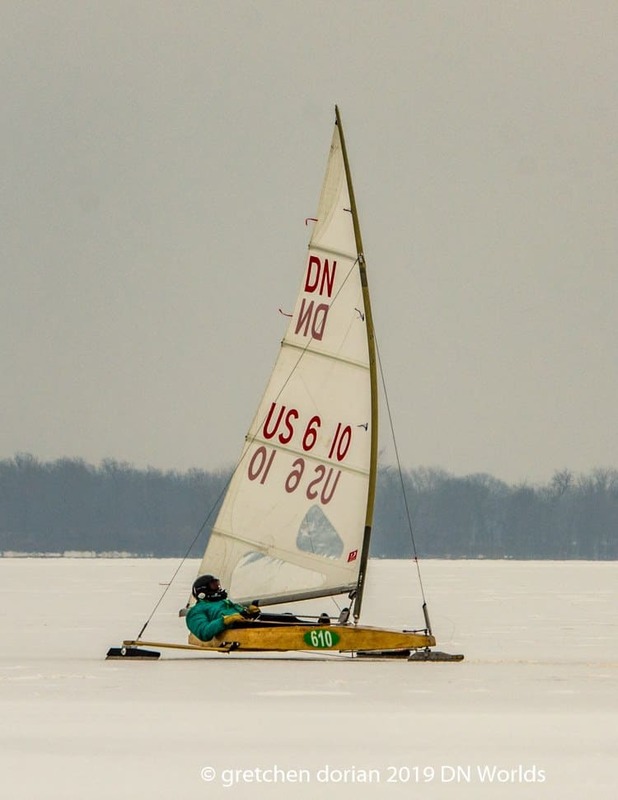 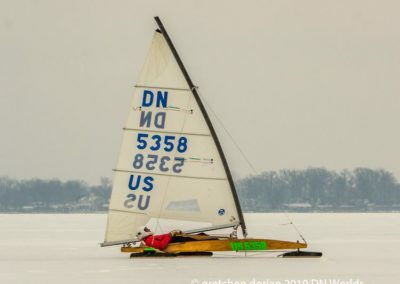 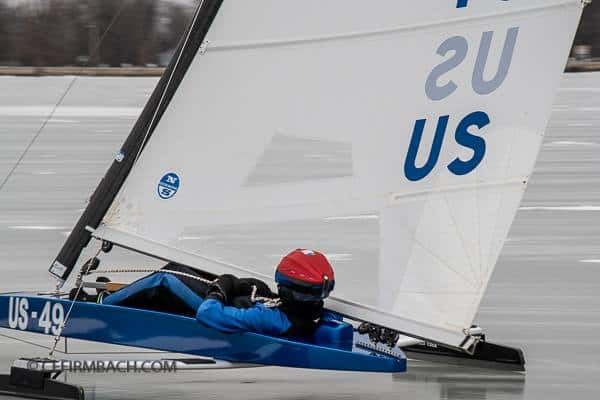 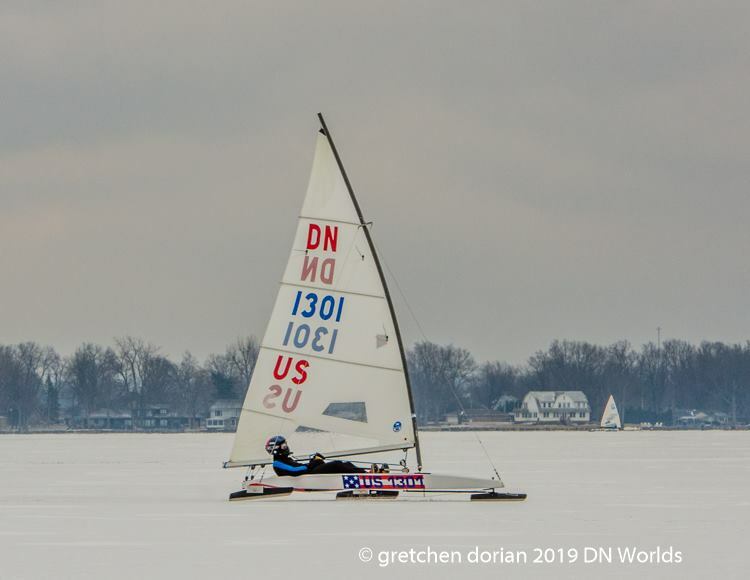 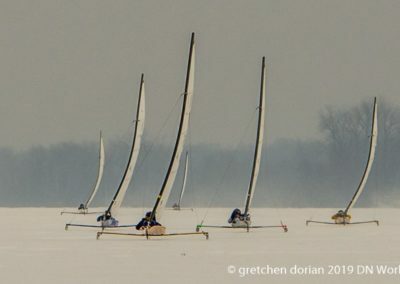 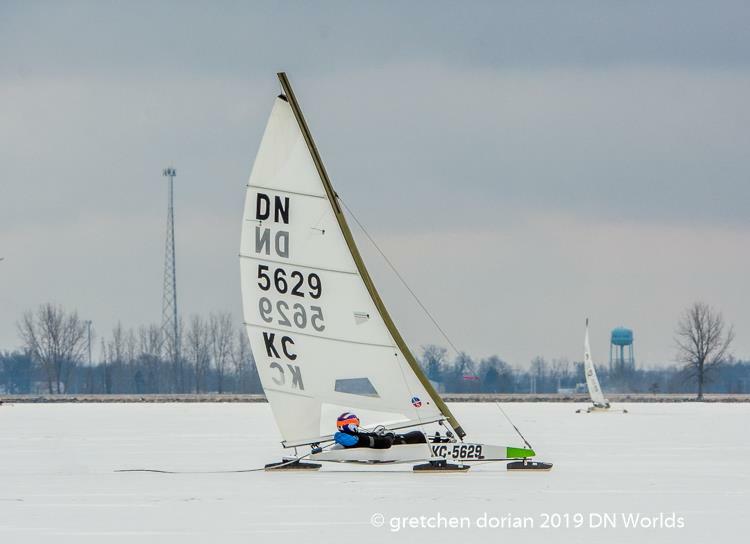 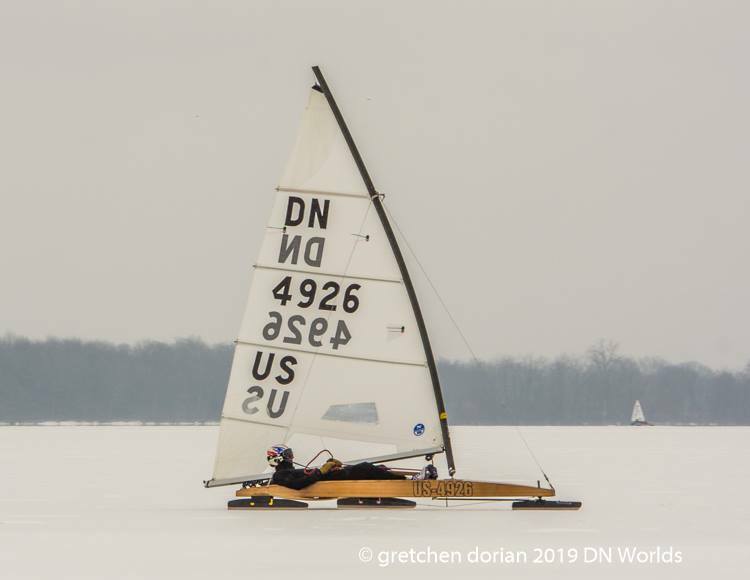 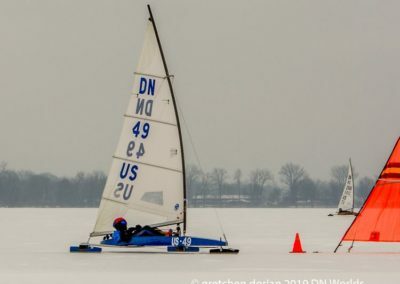 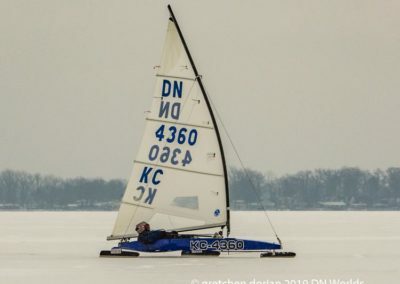 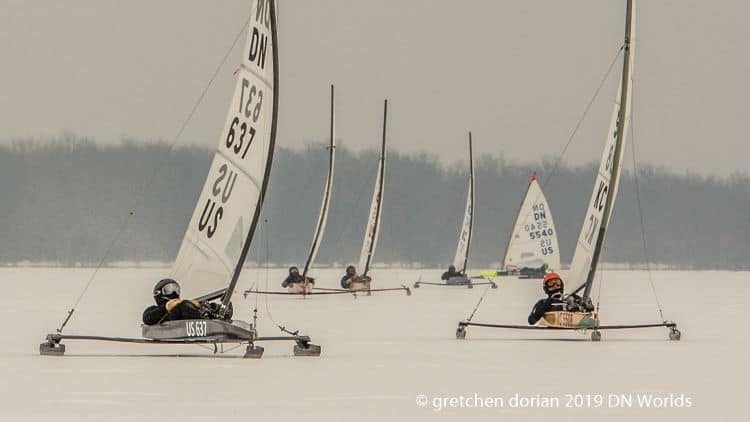 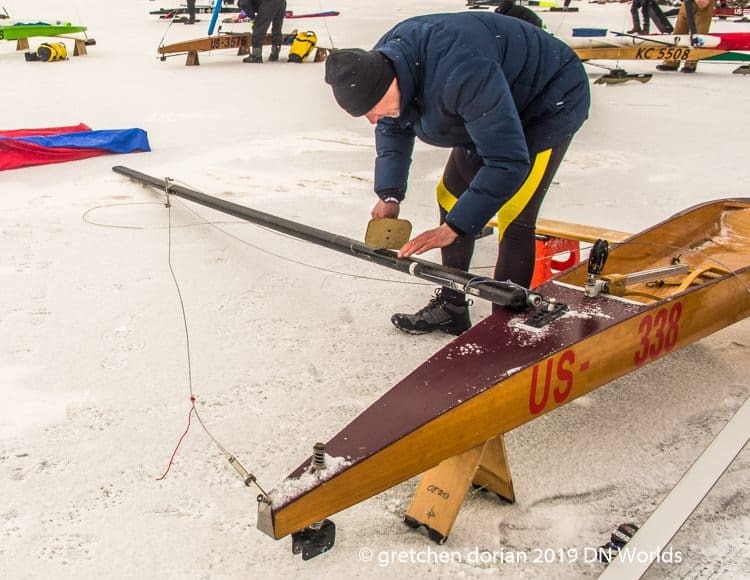 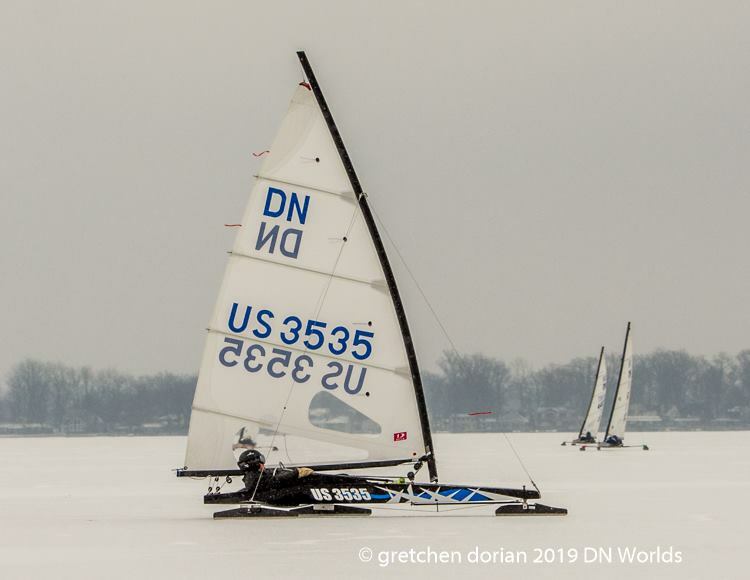 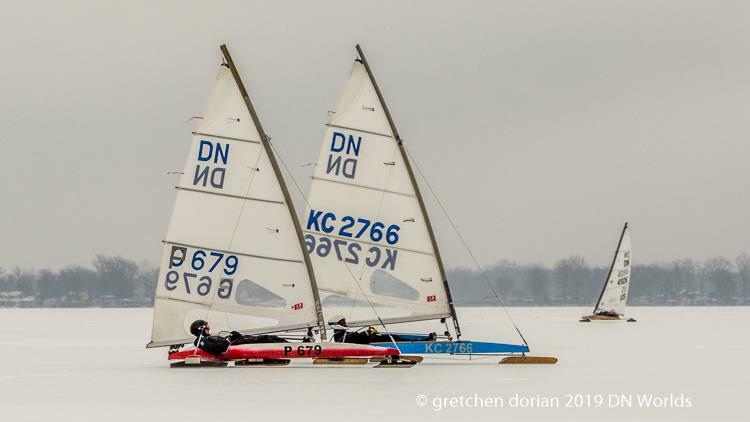 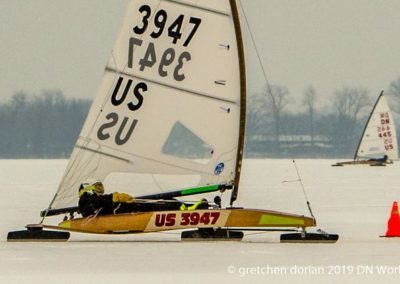 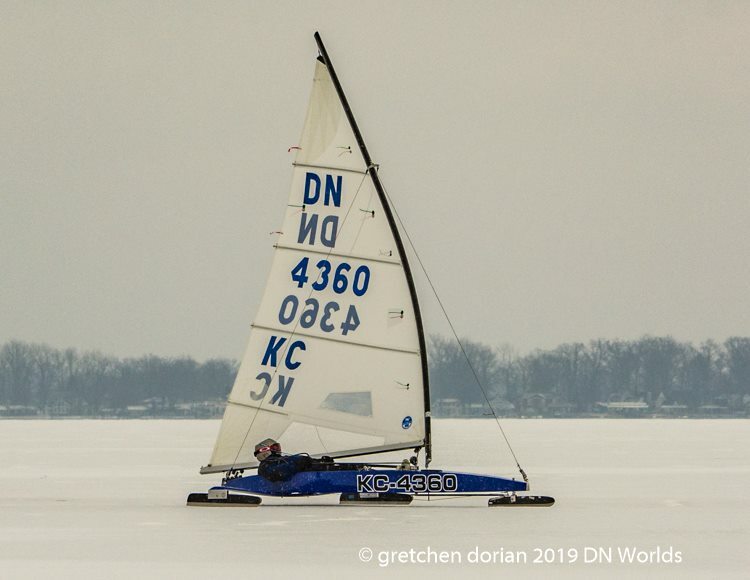 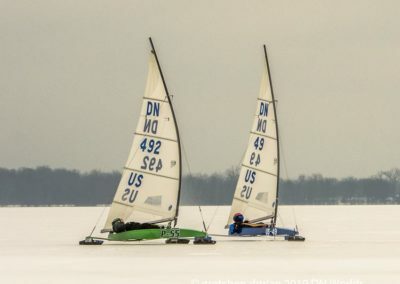 You can read about Jane Pegel’s remarkable career as a top ice sailor back when there were even fewer women competing at championships in the December 2016 DN class Newsletter, Runner Tracks. 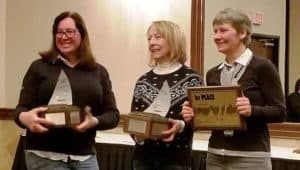 Susie and I are pleased to congratulate the women who competed in the Gold Cup and wish them well in the North Americans. But here is a correction to your report:In Susie’s scrap book she has come across an article about the first Gold Cup at Gull Lake in 1973. 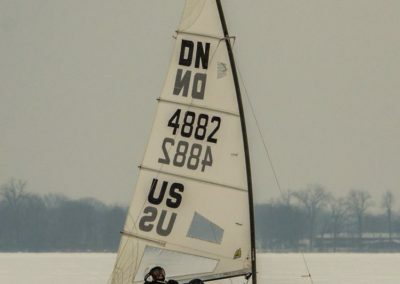 Jane placed 8th in the Gold fleet. 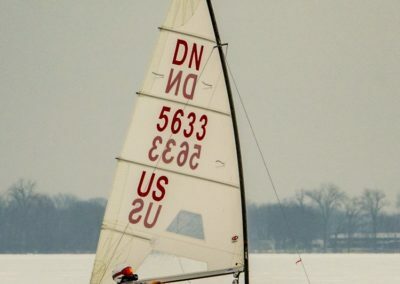 Susie placed 16th in the Gold fleet. 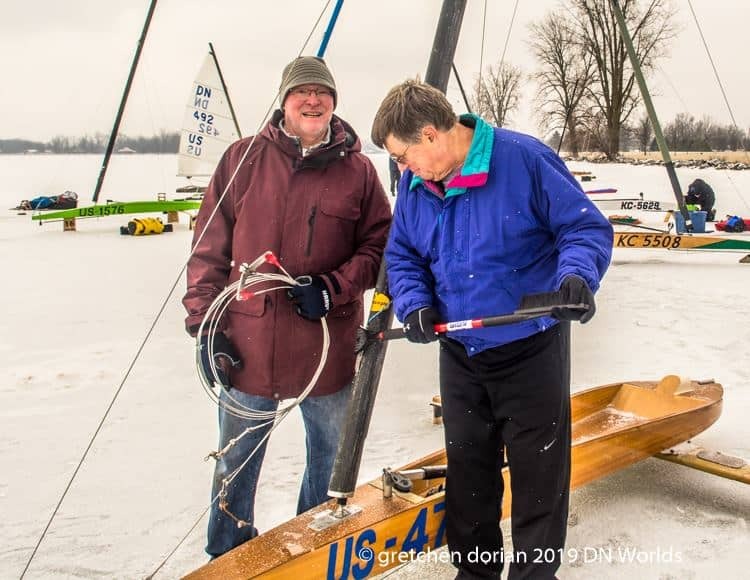 December 31, 2019: Registration deadline for early entry fee. 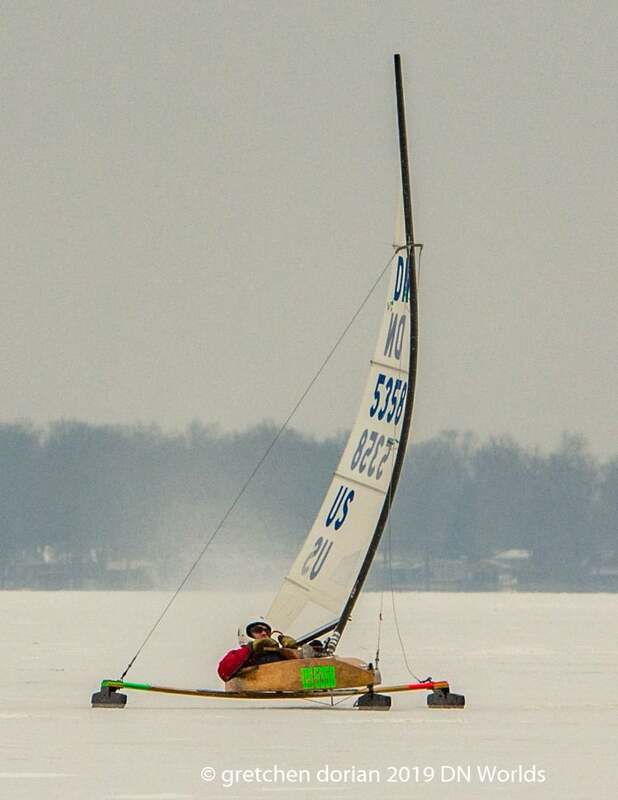 5 PM- 8 PM local time. 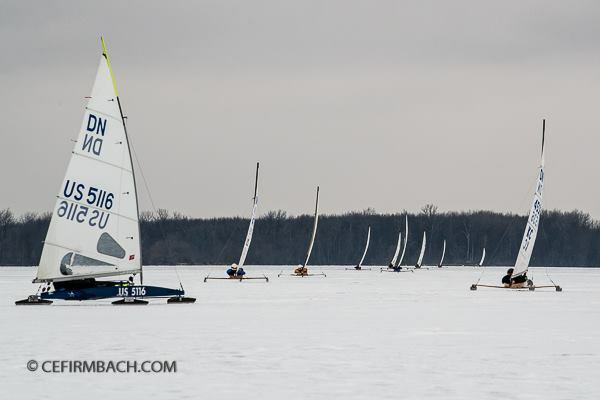 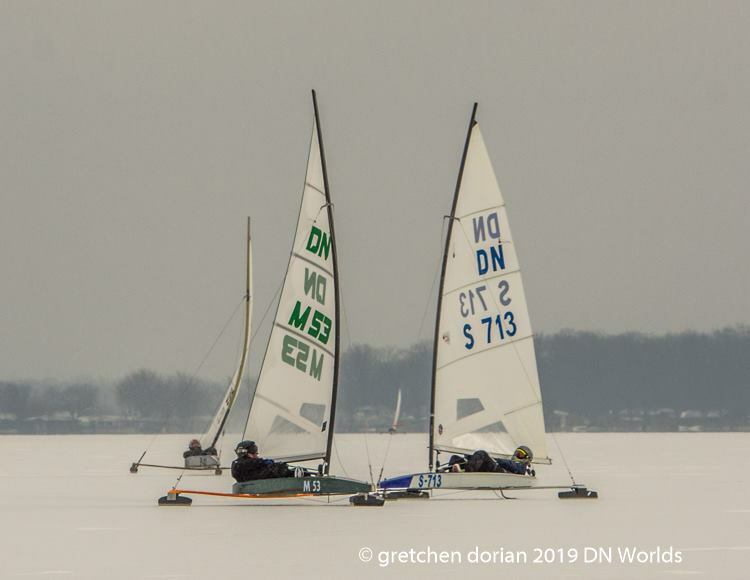 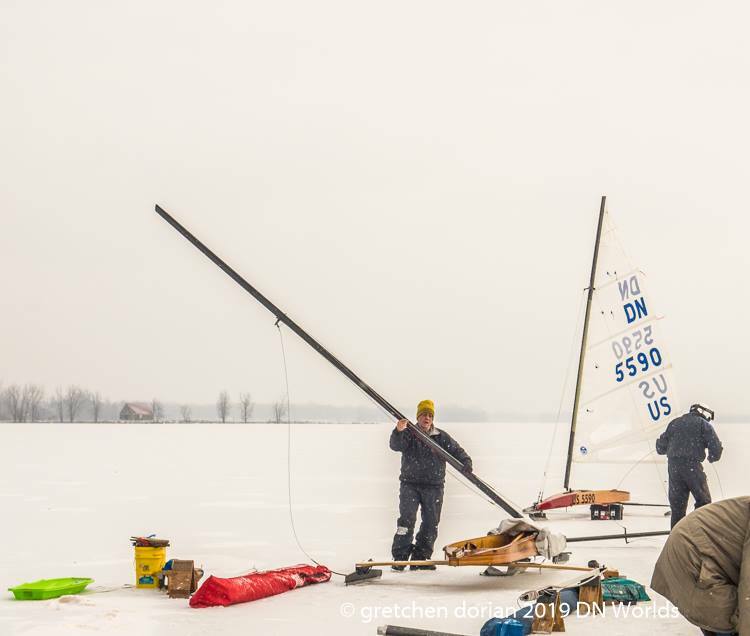 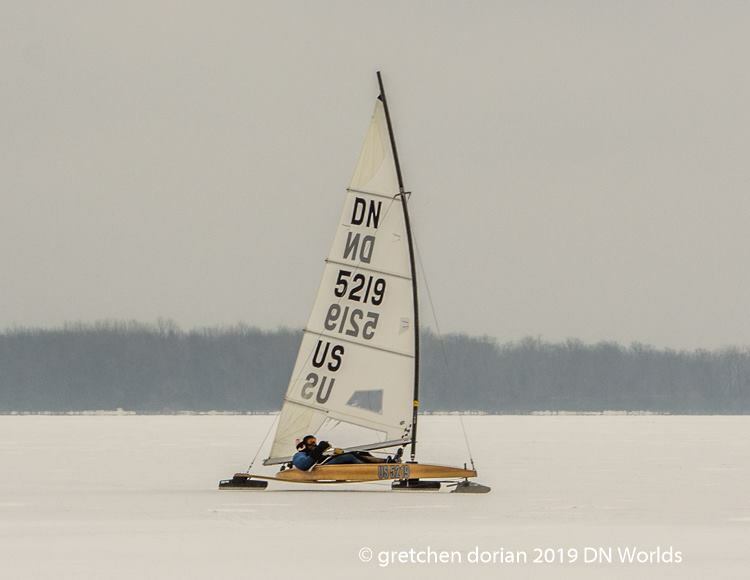 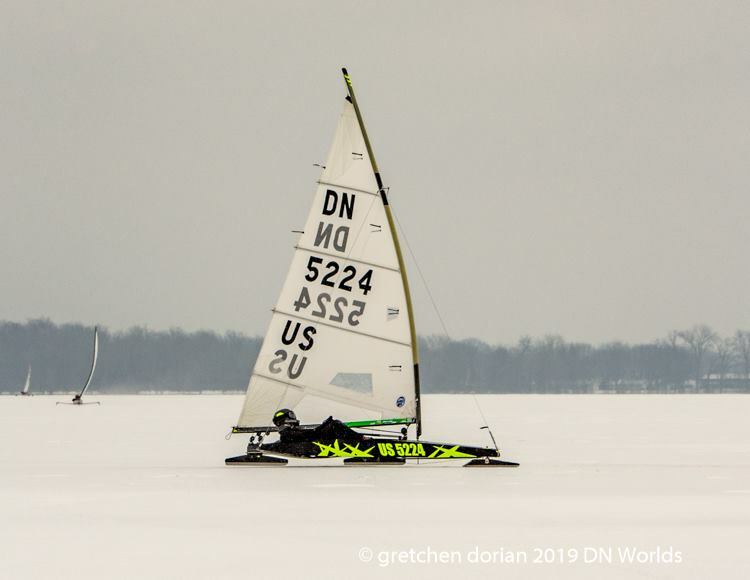 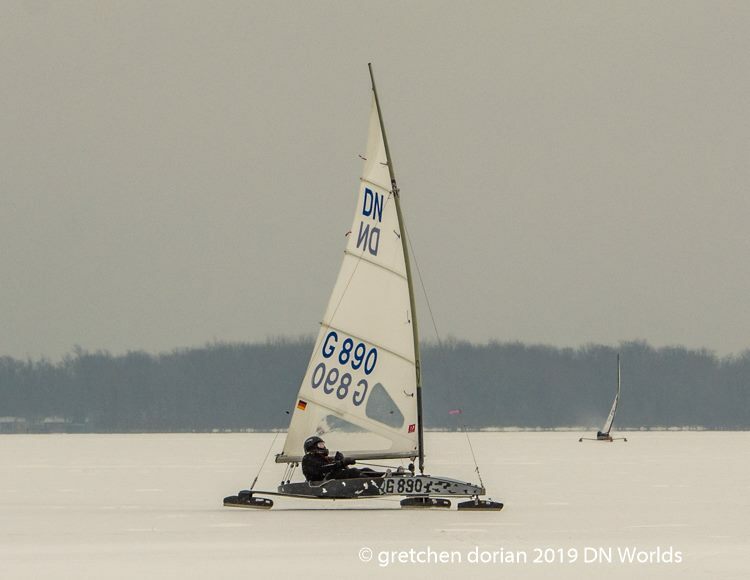 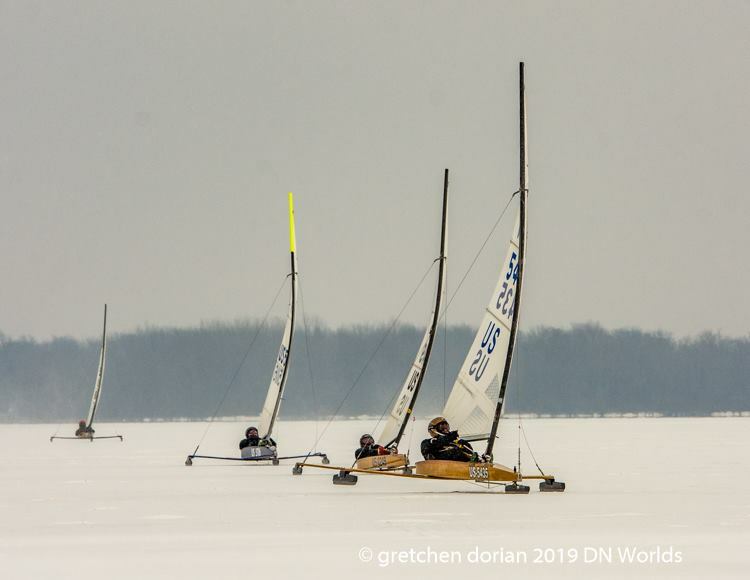 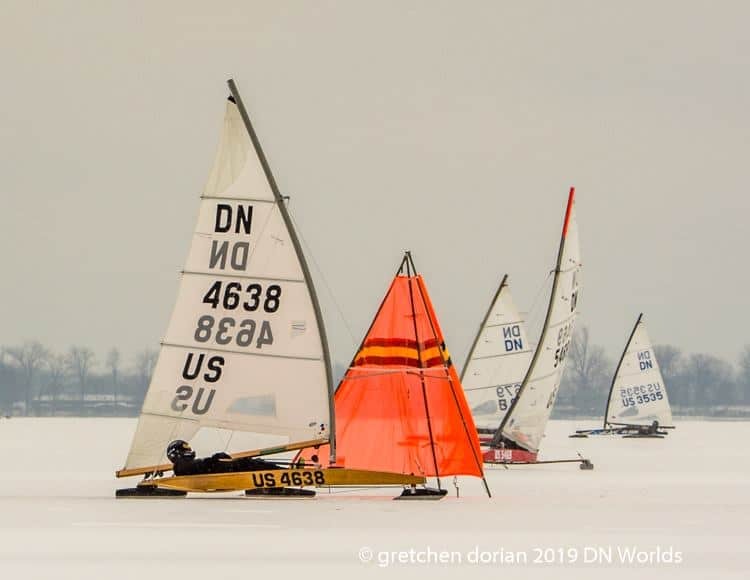 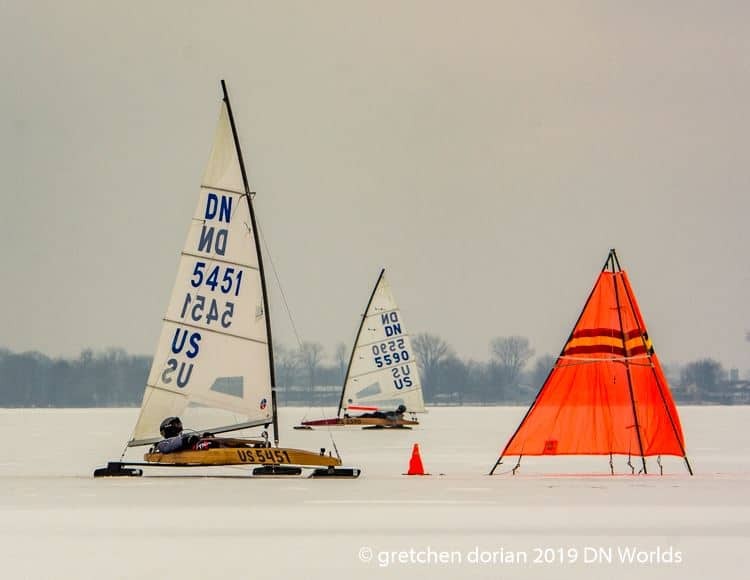 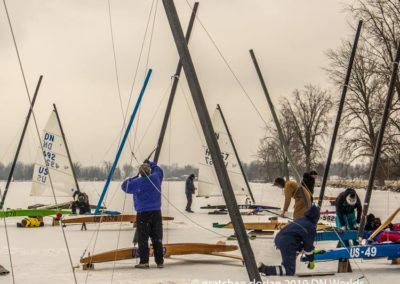 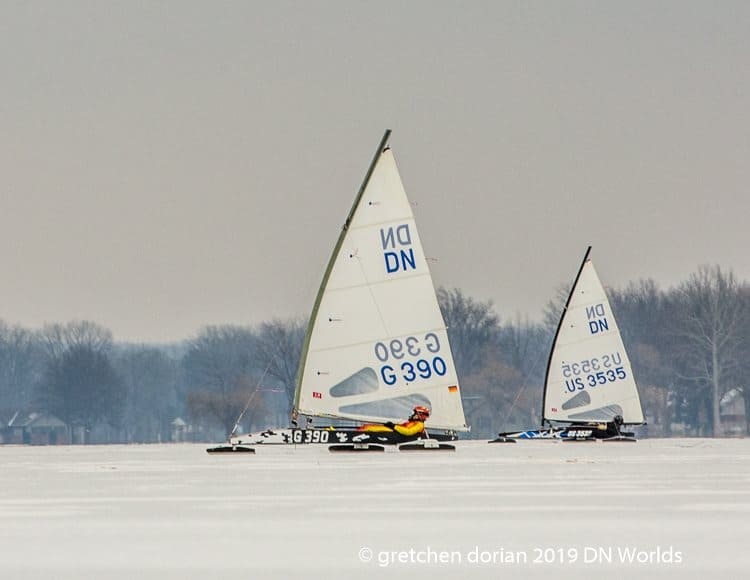 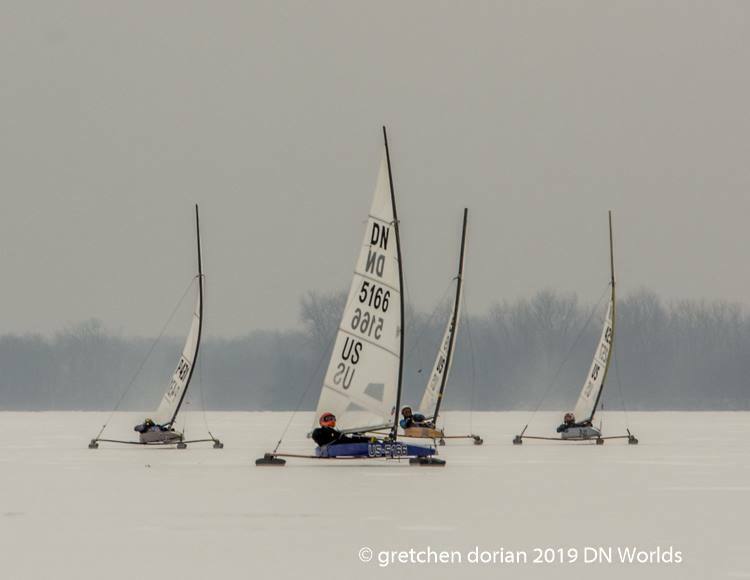 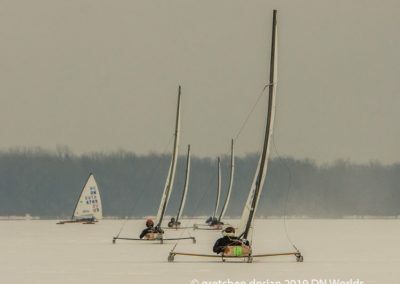 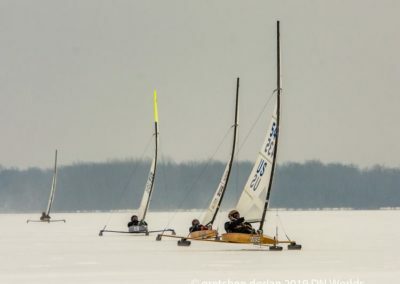 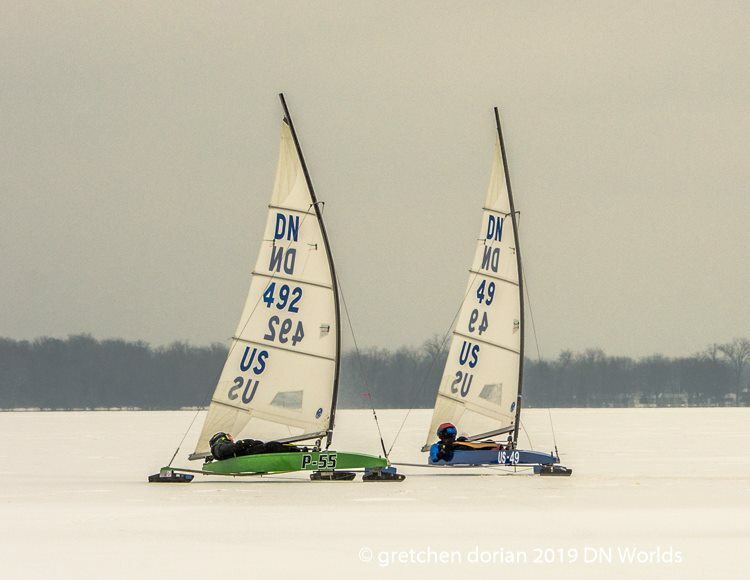 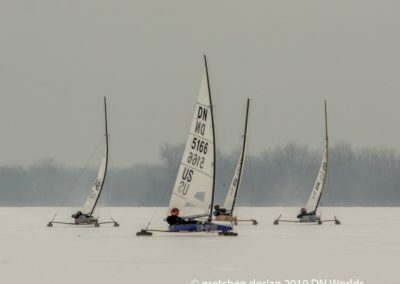 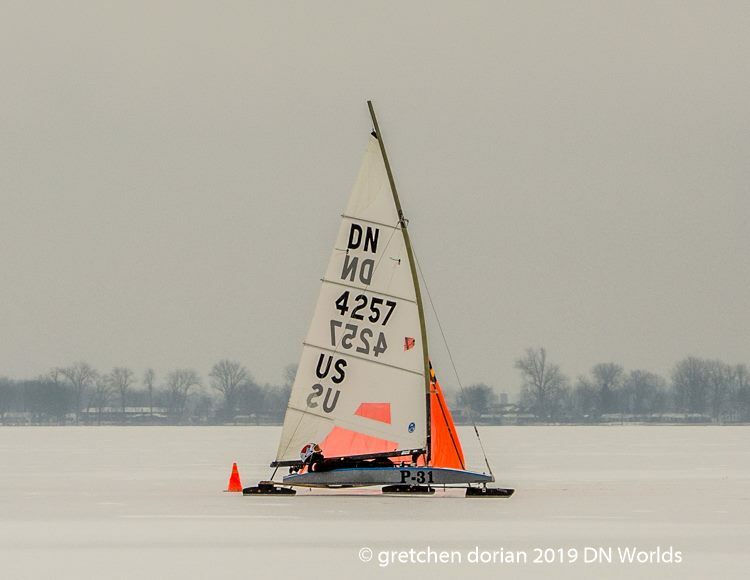 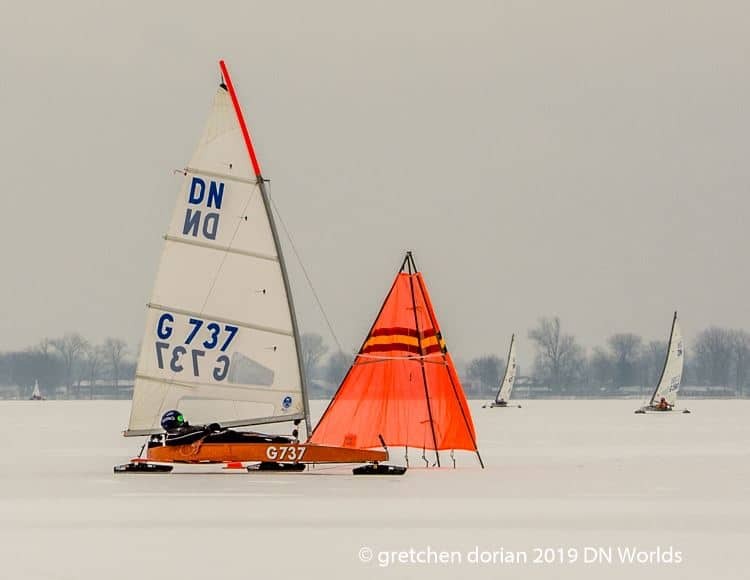 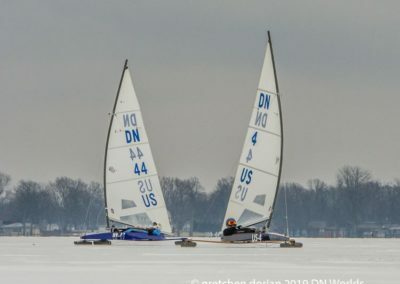 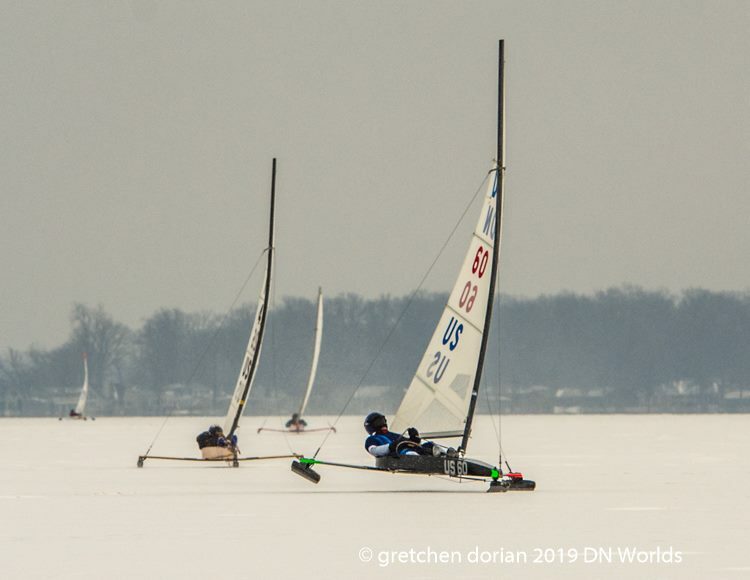 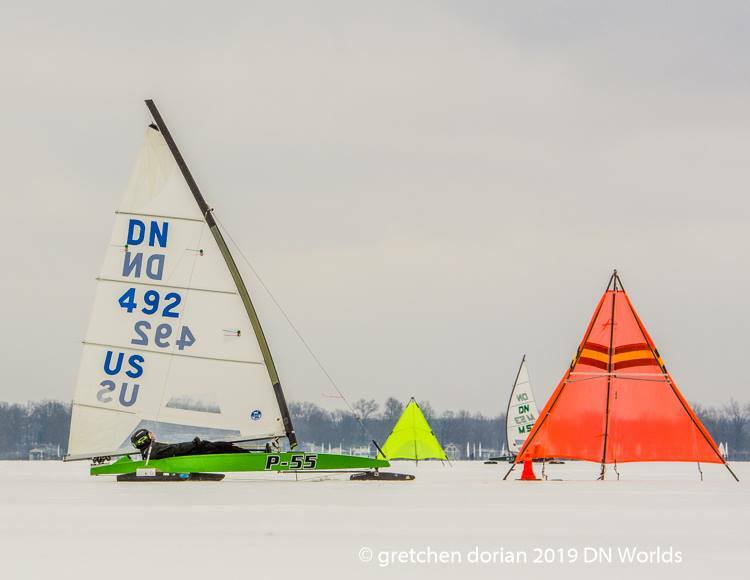 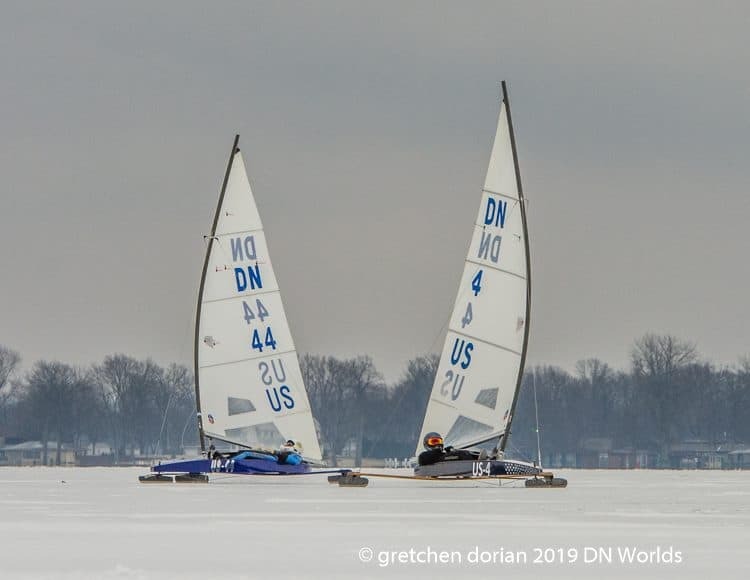 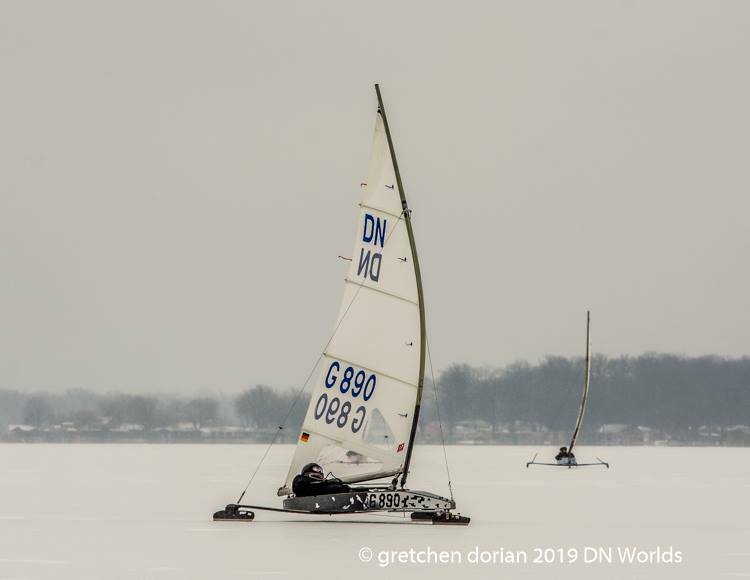 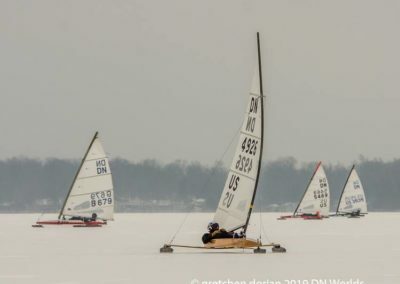 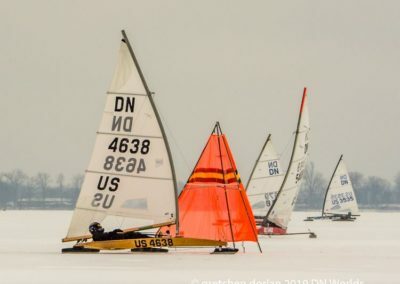 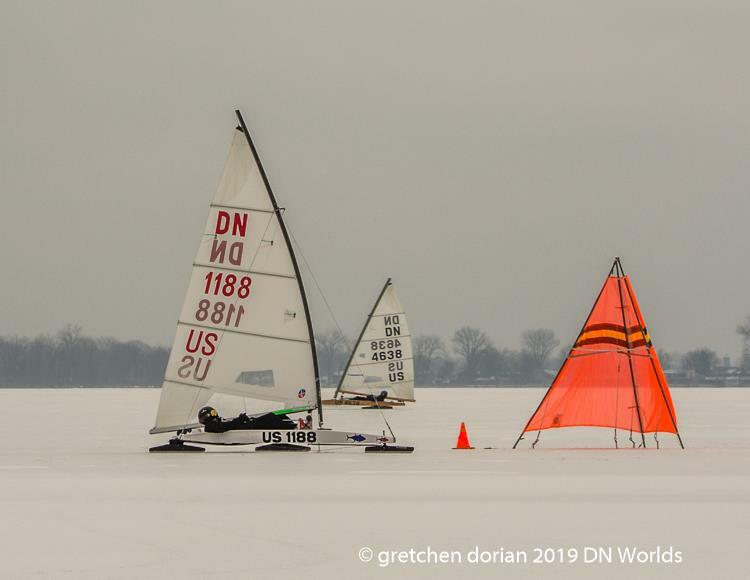 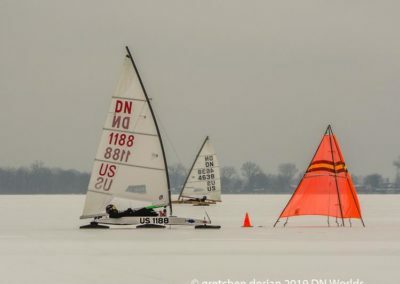 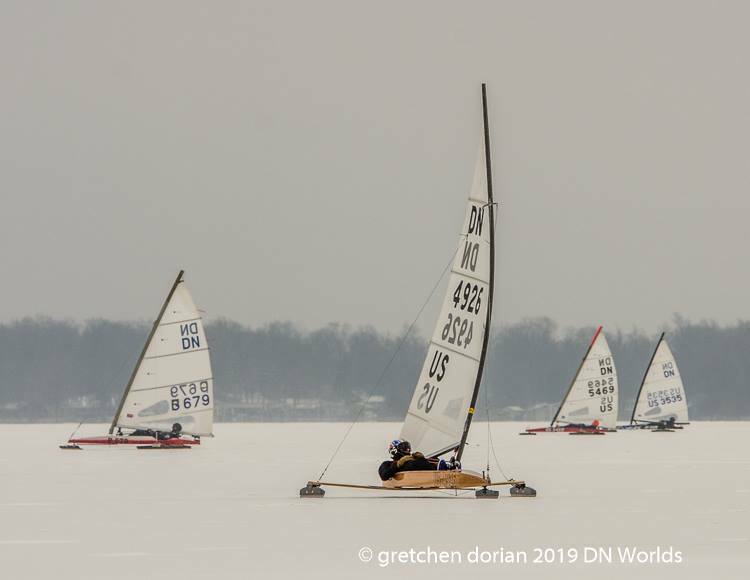 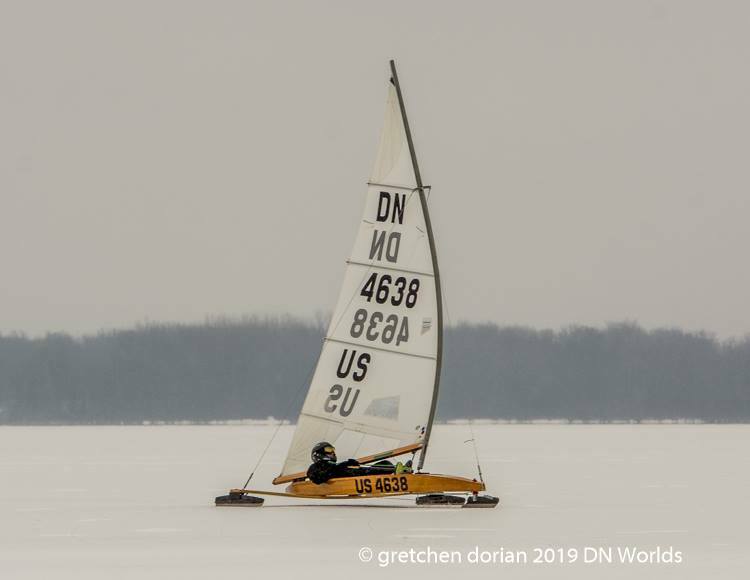 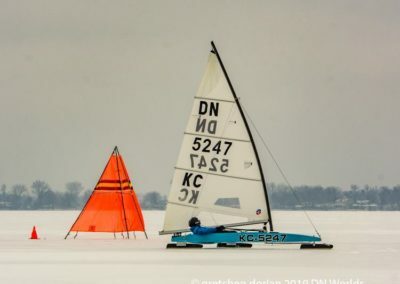 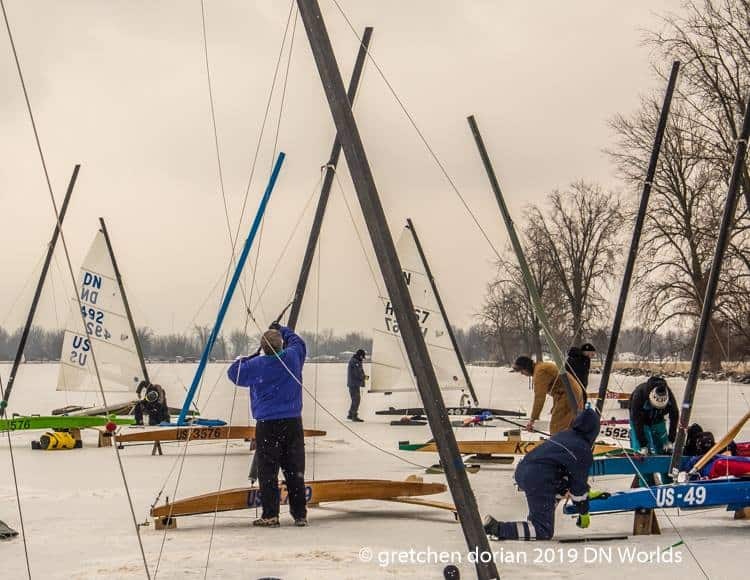 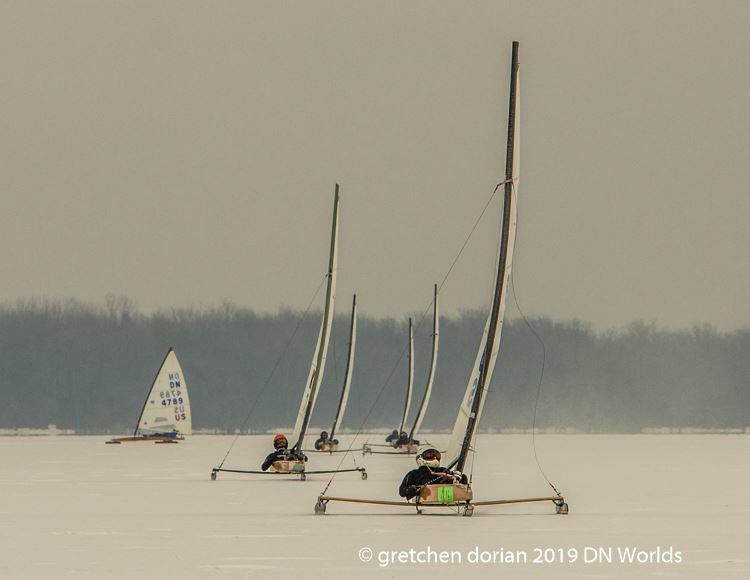 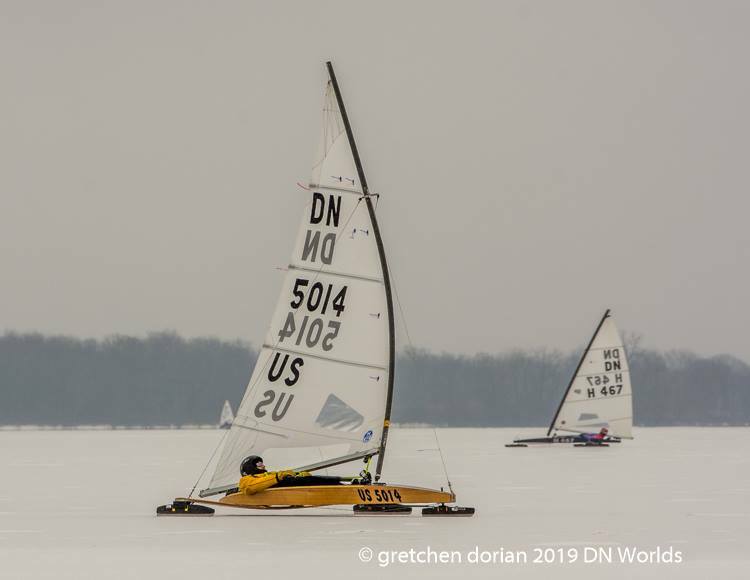 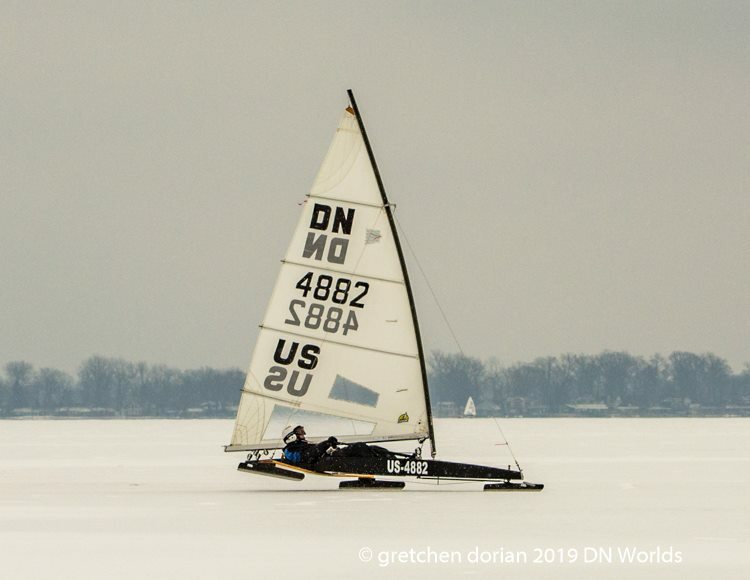 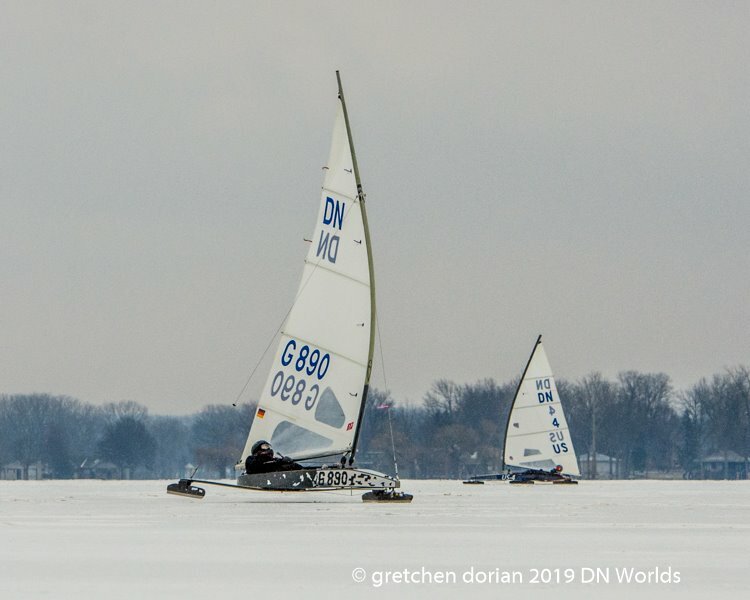 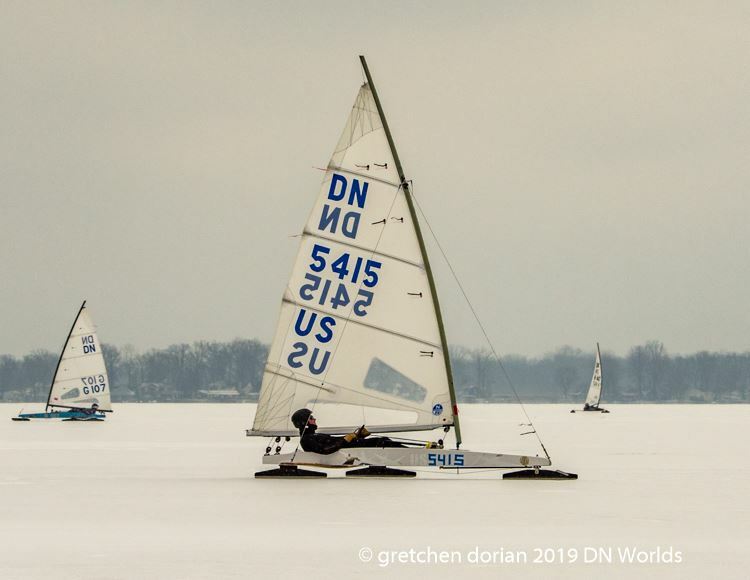 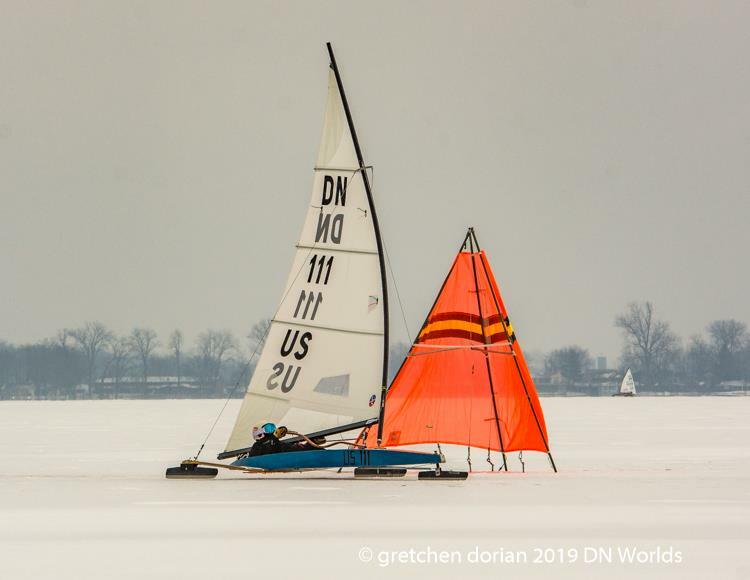 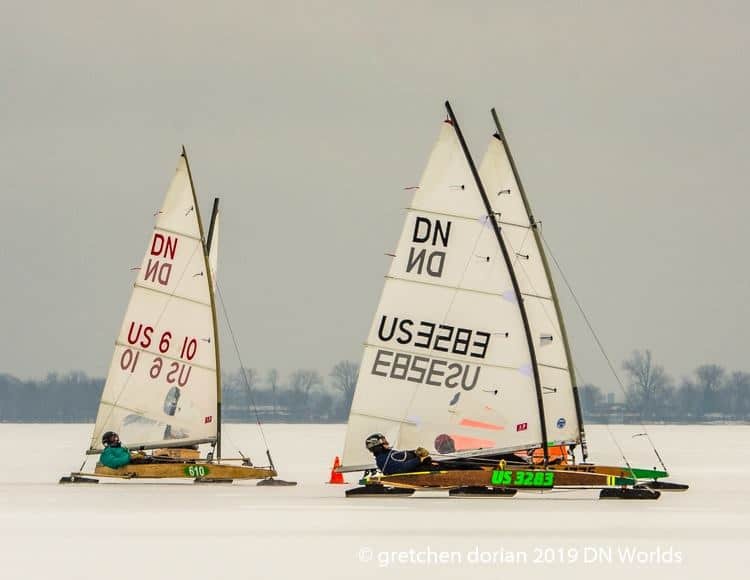 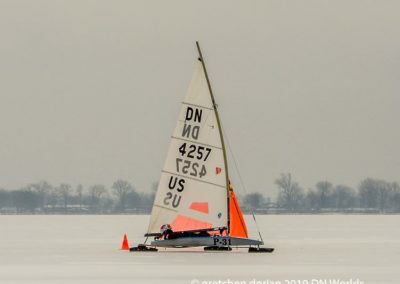 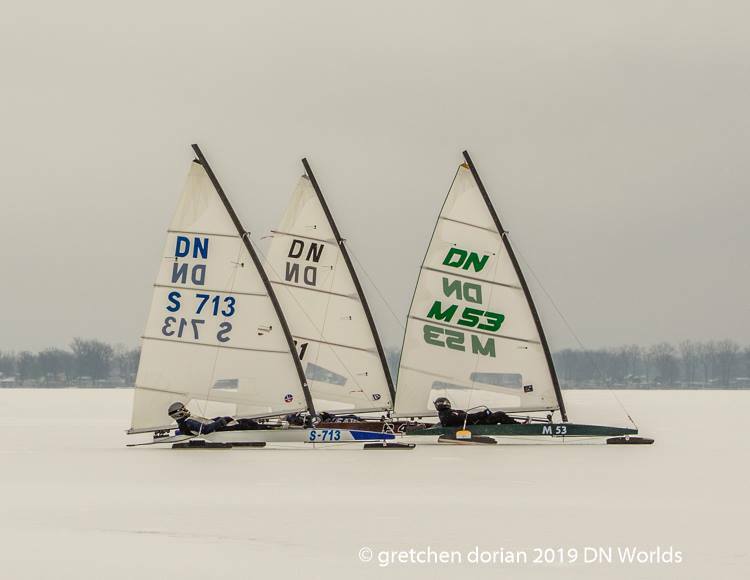 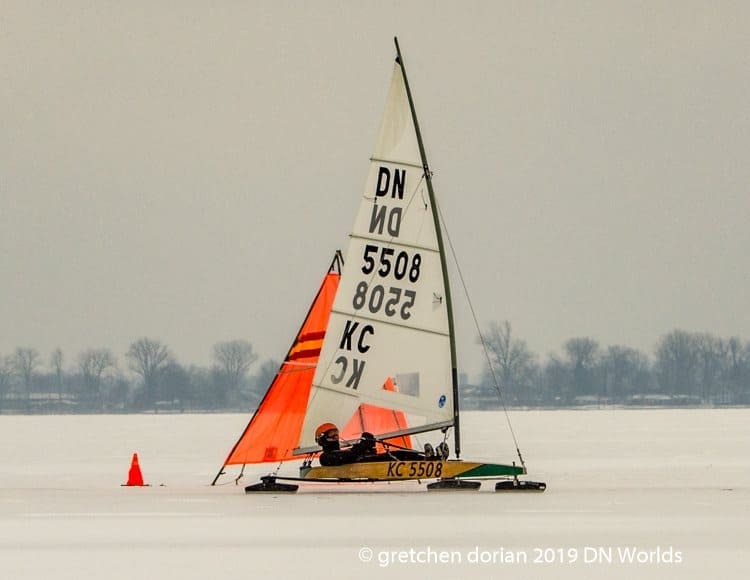 February 17, 2019: First World Gold Cup race at time stated in sailing instructions. 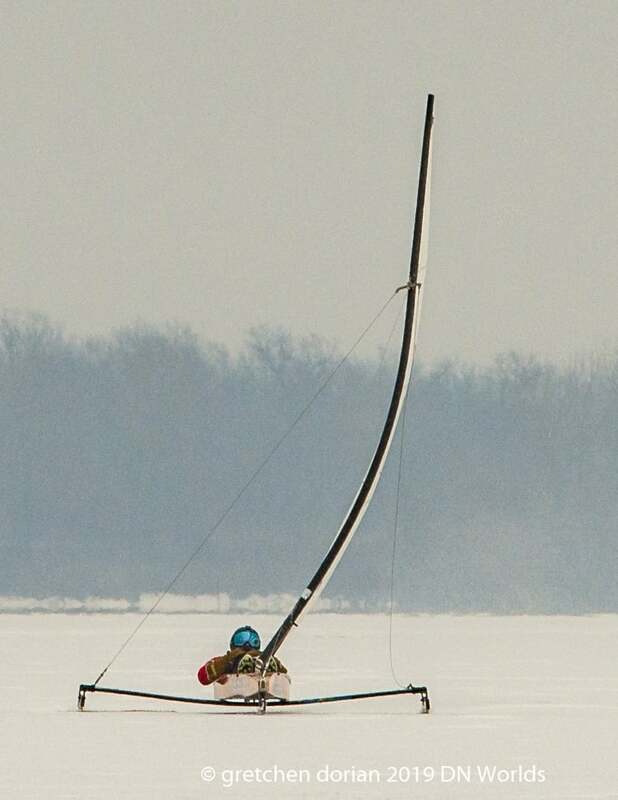 7 PM -9 PM local time: Location and updated date, time and place to be listed on the IDNIYRA website. 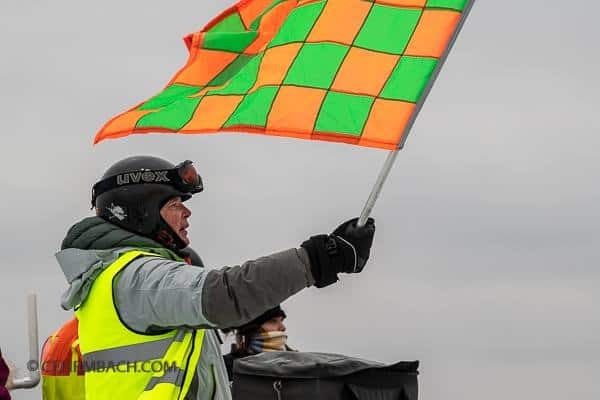 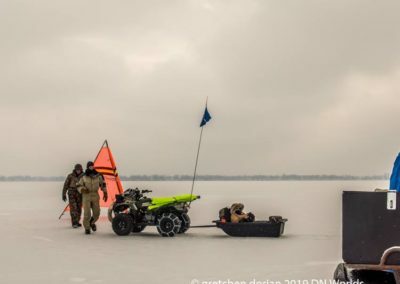 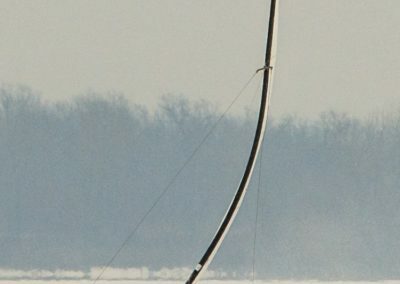 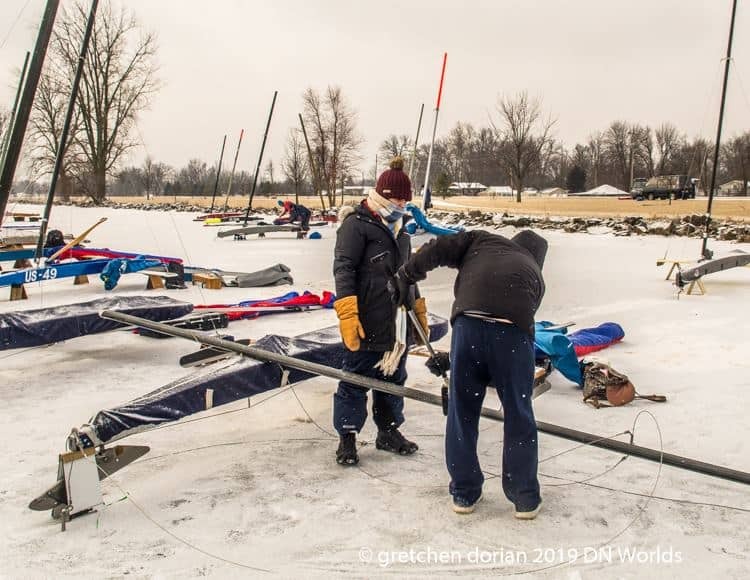 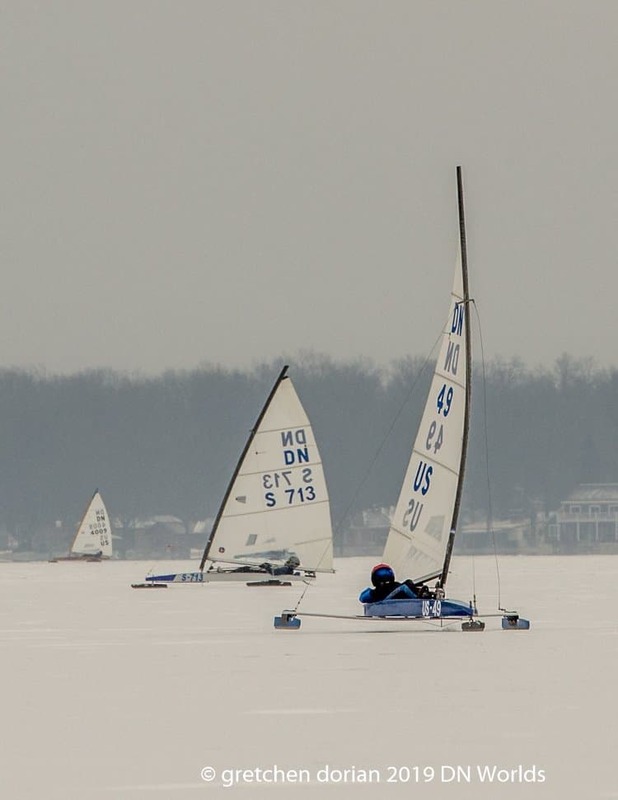 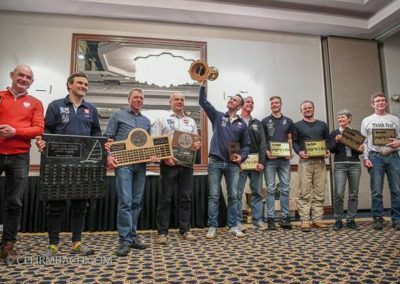 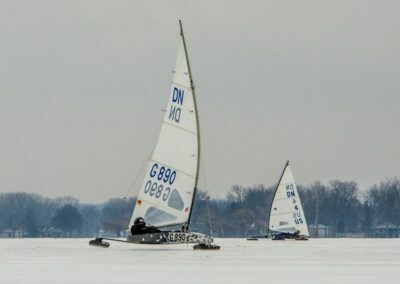 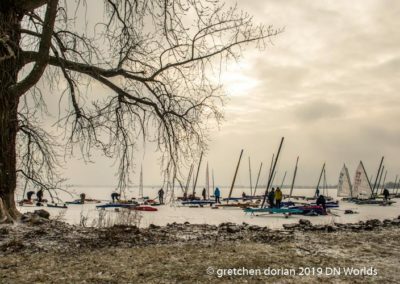 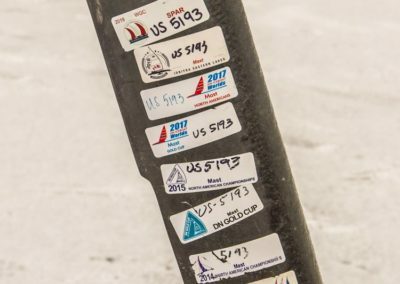 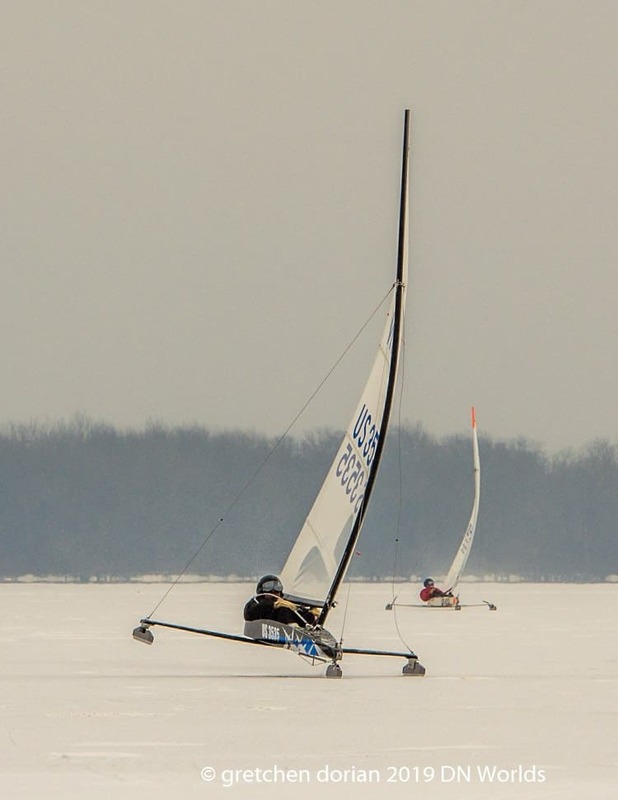 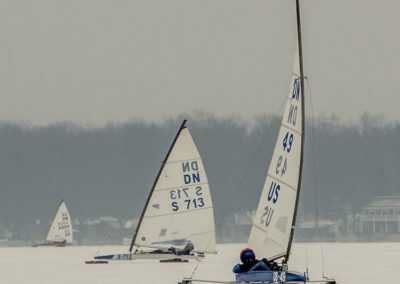 February 19, 2019 earliest possible race in North American Championship, at time stated in sailing instructions.